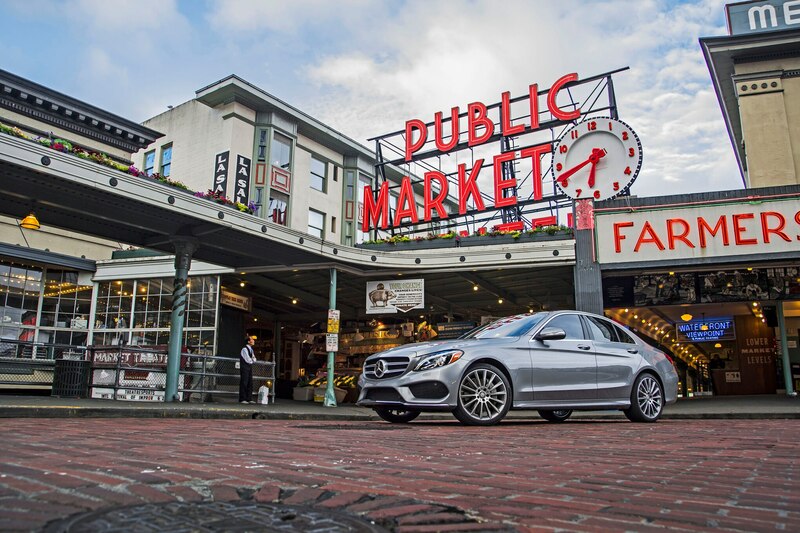 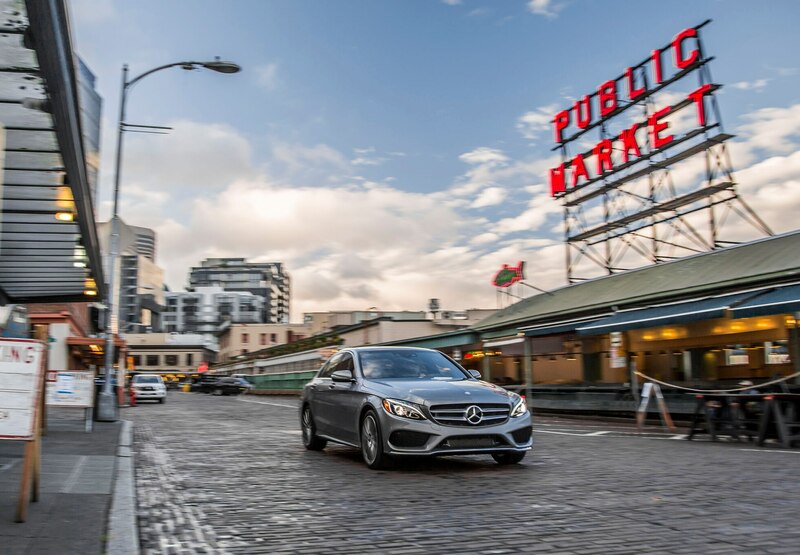 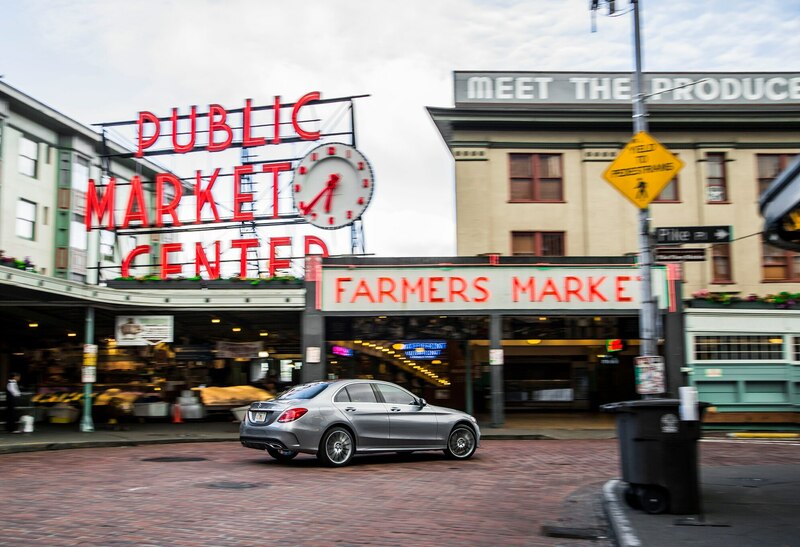 Seattle, Washington — Downtown brims with high-end cars owned by those flush with tech industry money, and the 2015 Mercedes-Benz C-Class fits right in. 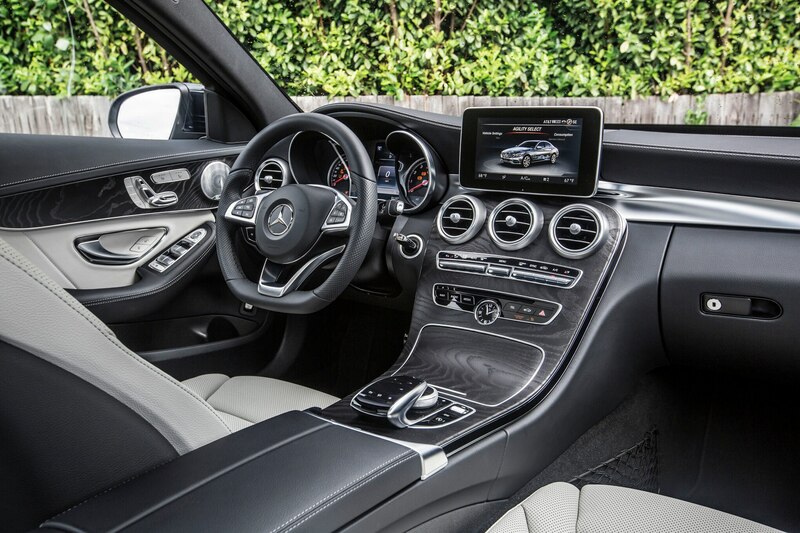 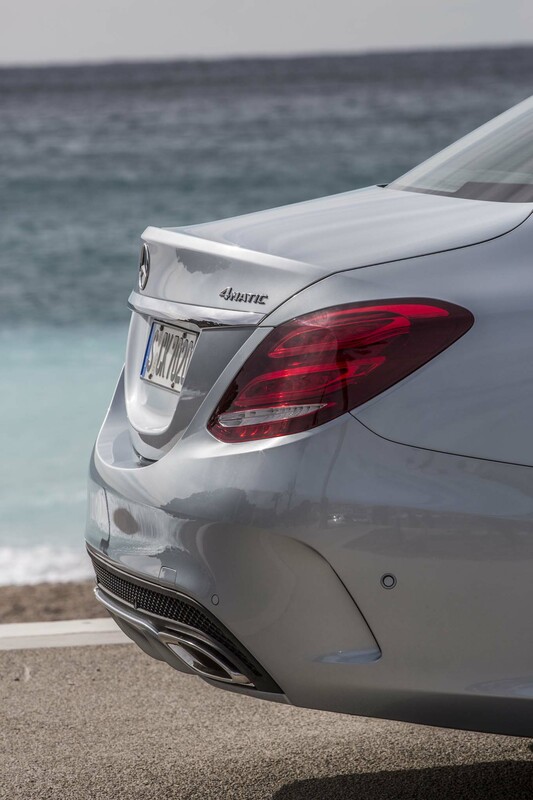 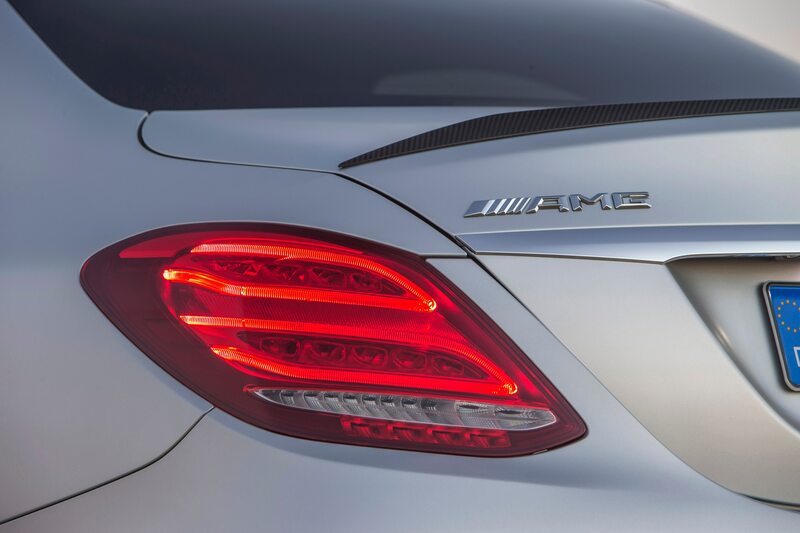 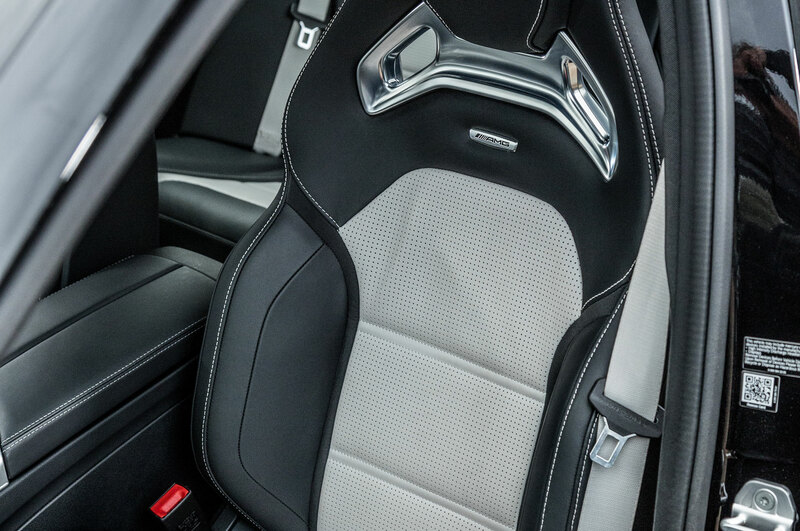 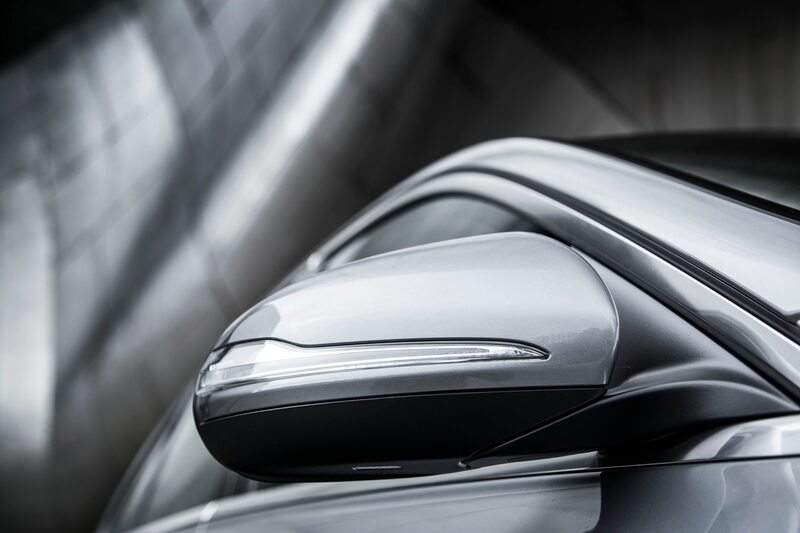 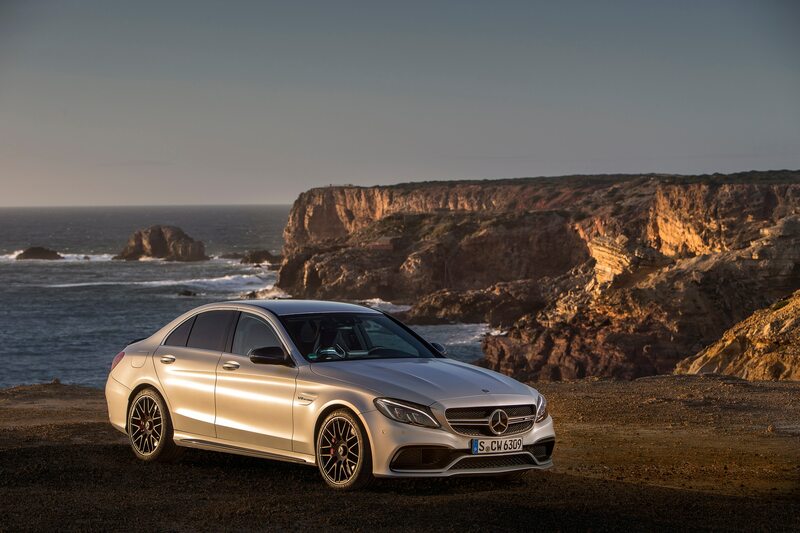 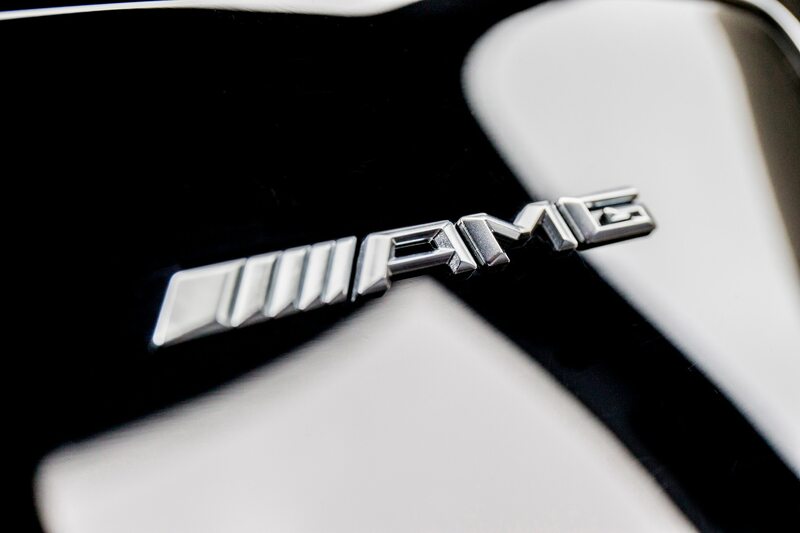 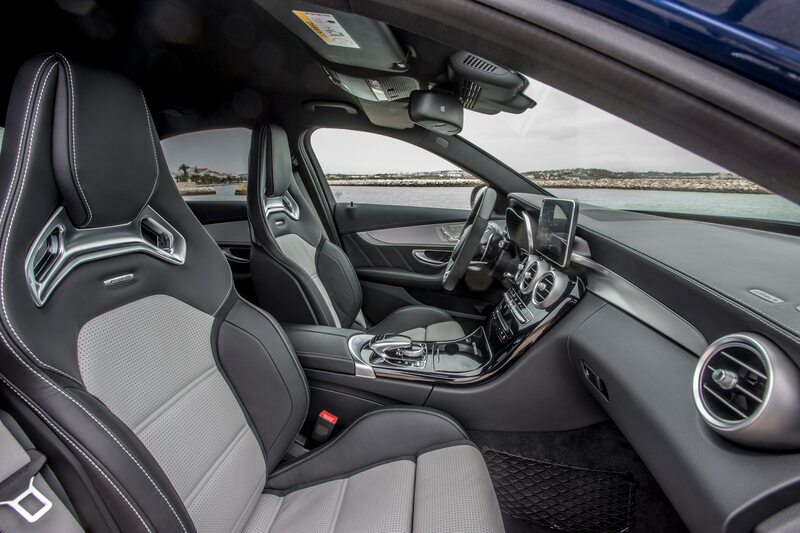 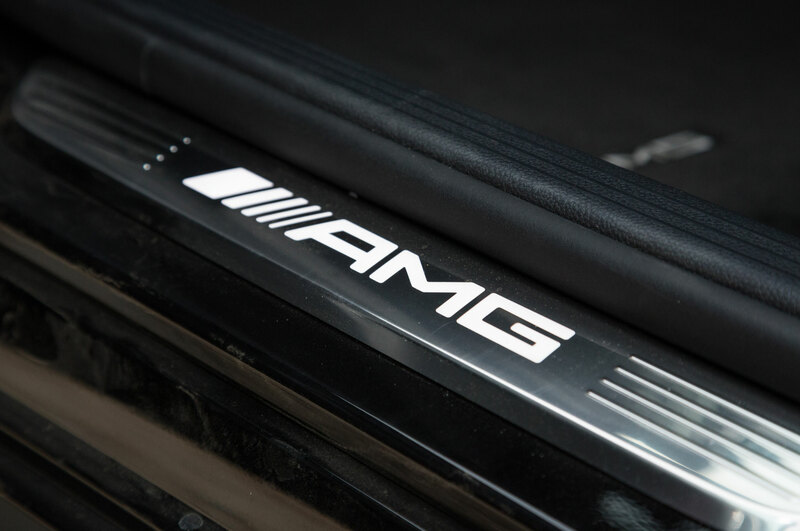 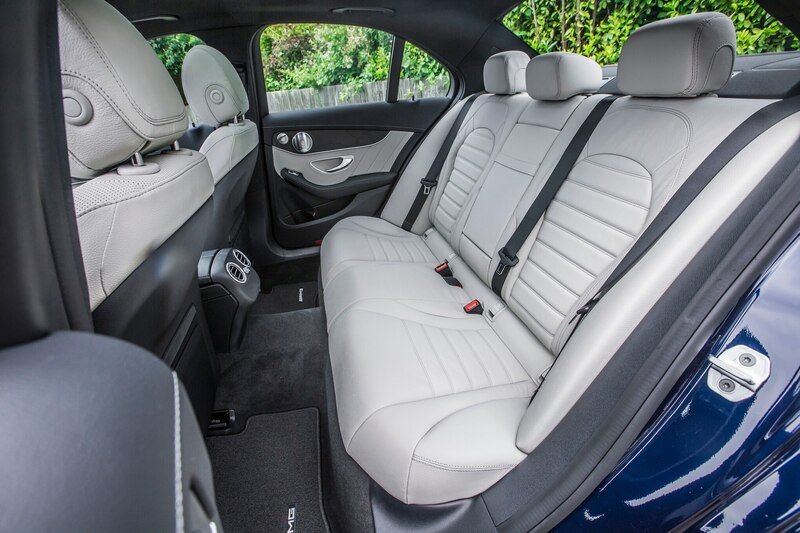 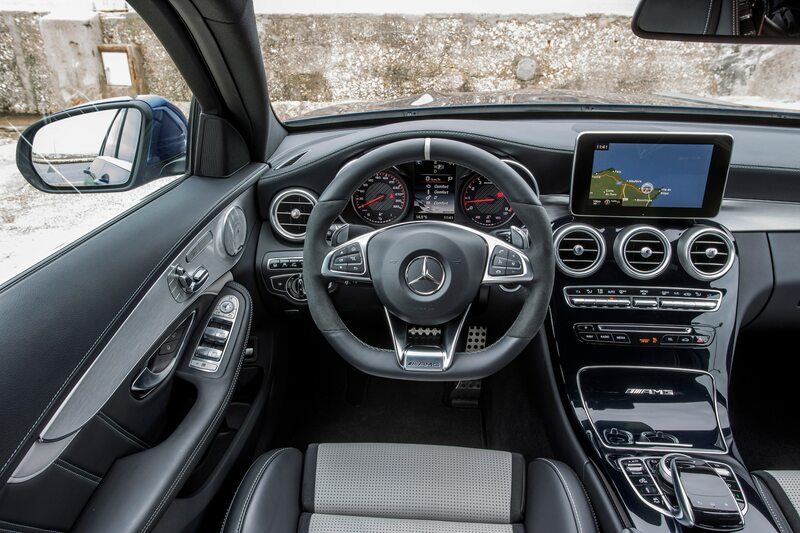 Its sophisticated design cues come from the S-Class, fortunately, and not the CLA-Class; bereft of swoopy four-door coupe lines, the creases and scallops on the doors add elegance. 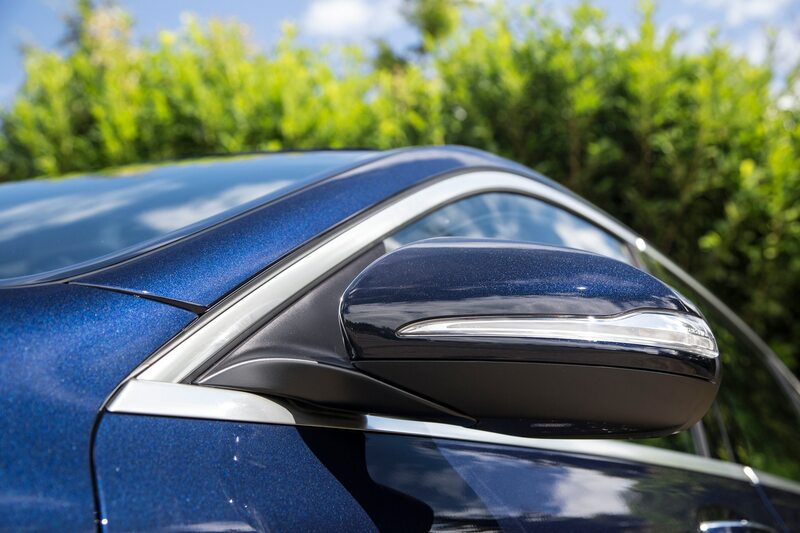 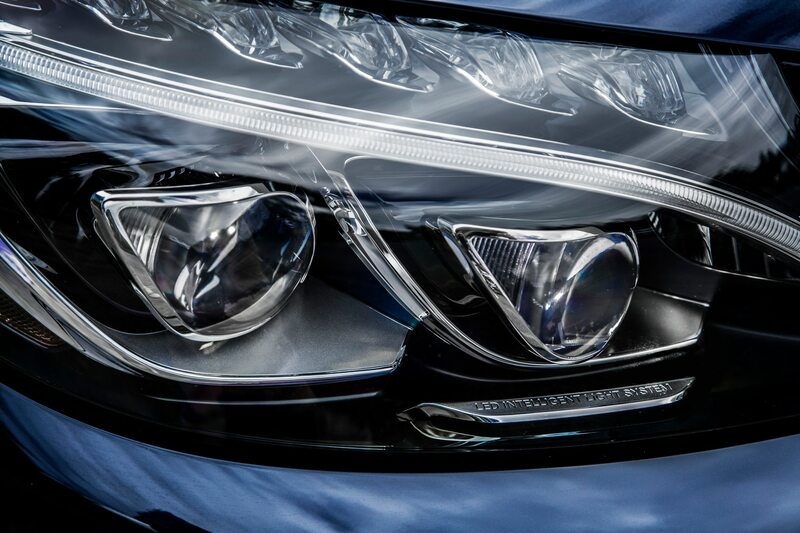 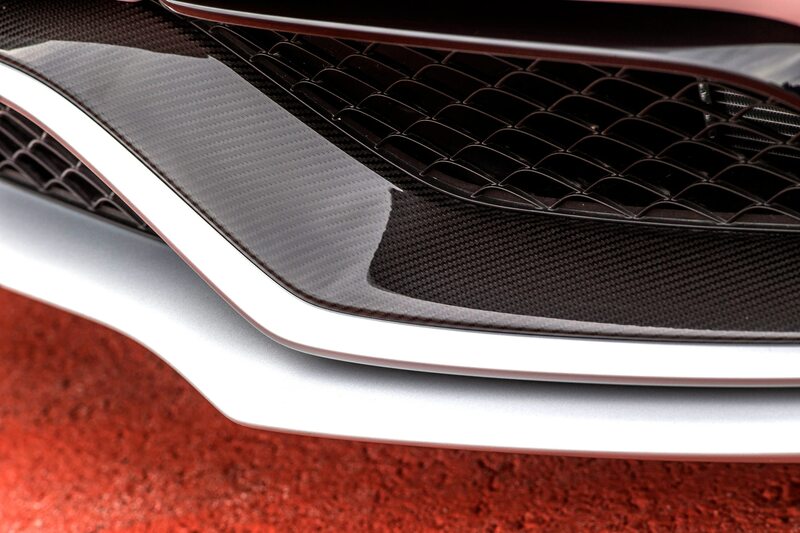 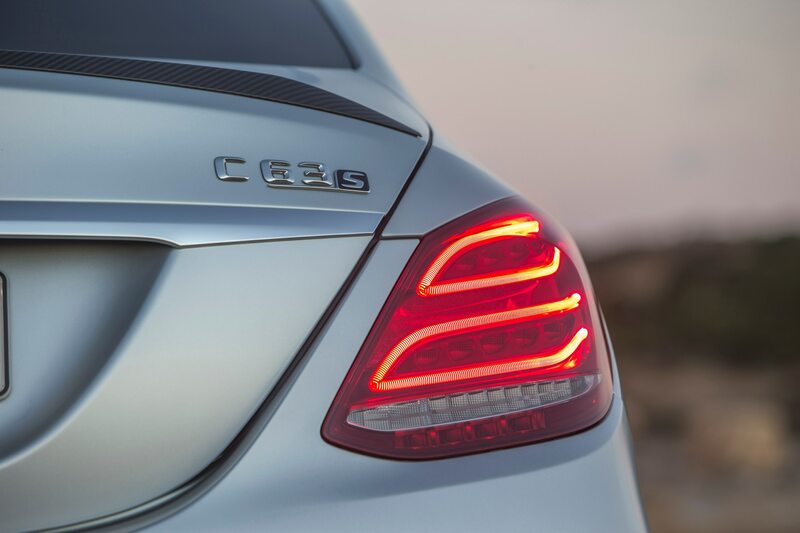 With glinting LED running lights and a sloped nose, it’s easy to pick out the new C in traffic, though it would benefit from a more inspiring paint-color palate than its offering of whites, silvers, blacks, and silvery blues. 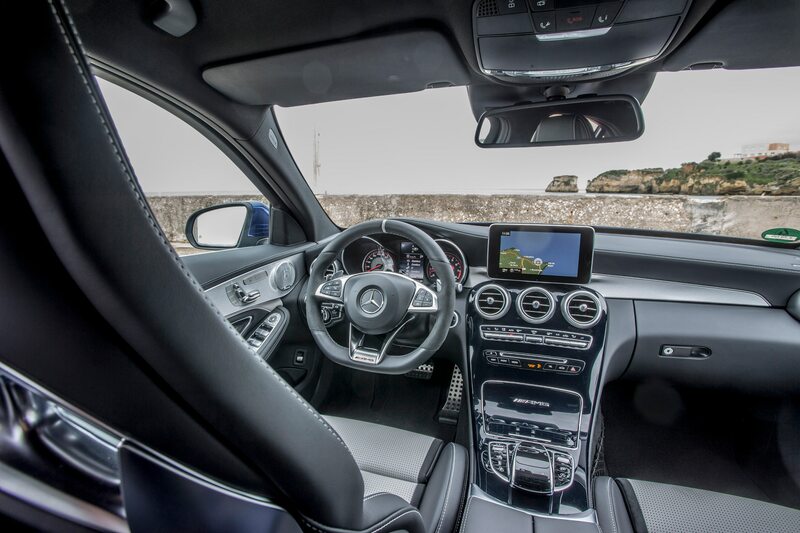 The interior takes a similarly measured approach to style, with a wraparound dashboard leading to a tidy, uncluttered center stack. 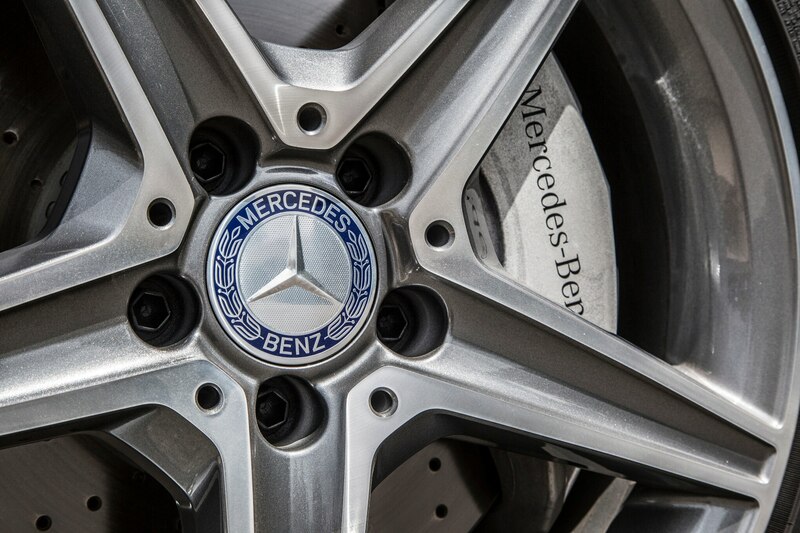 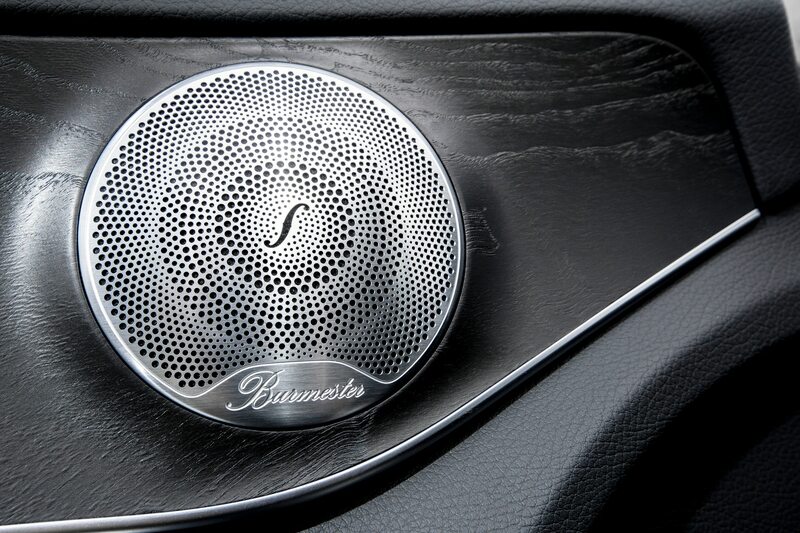 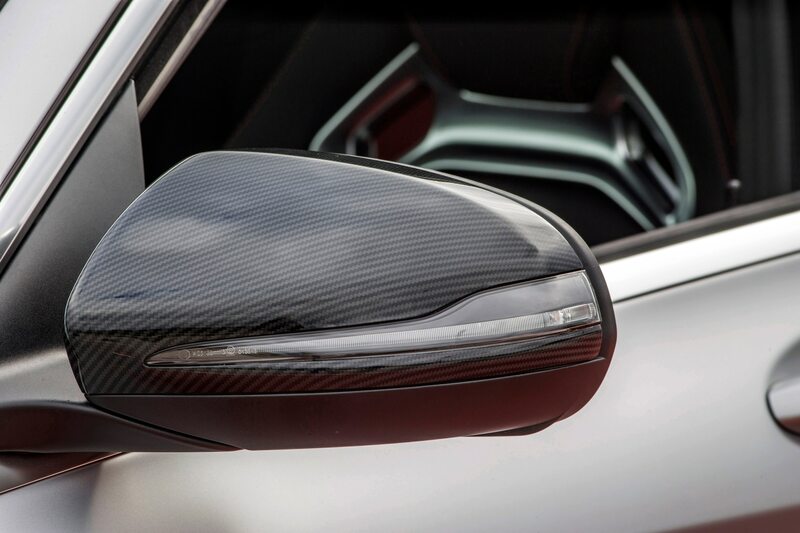 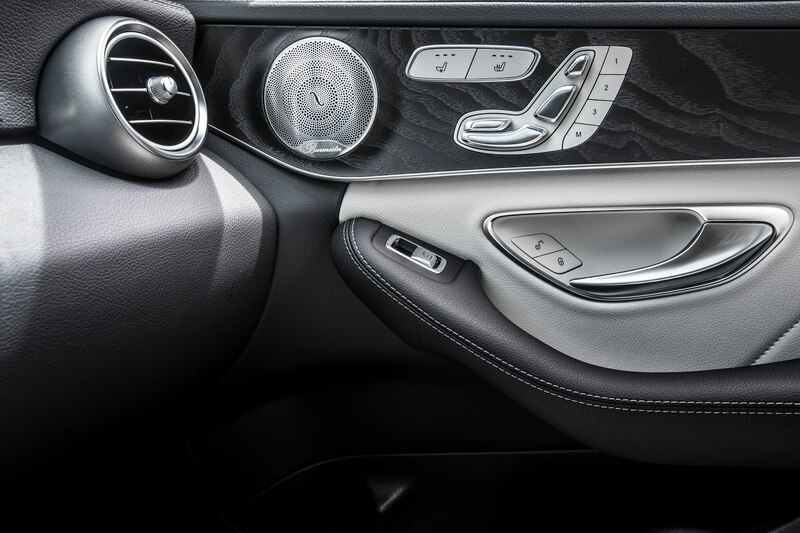 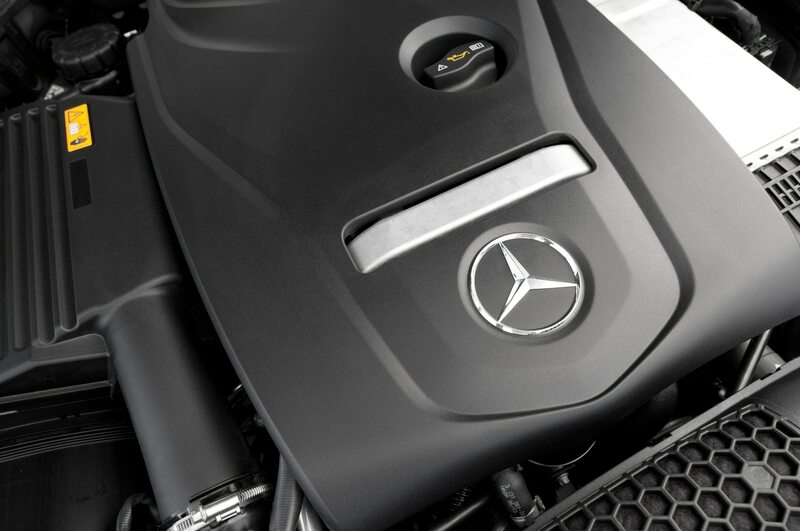 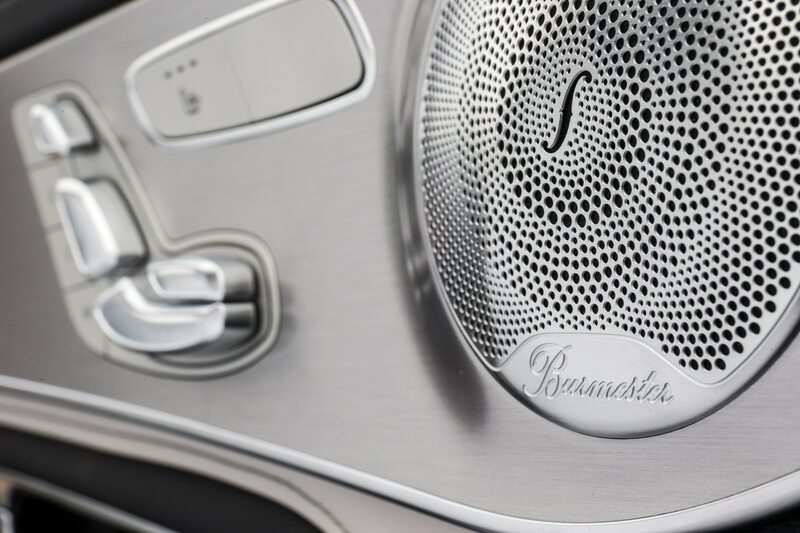 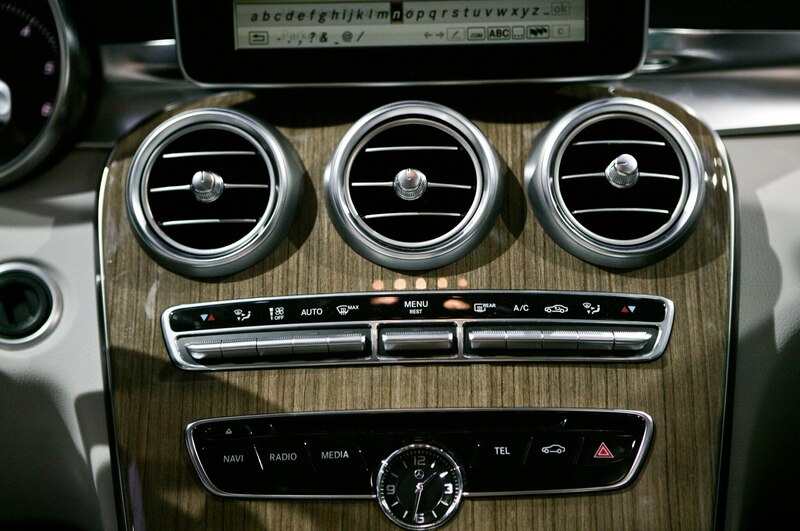 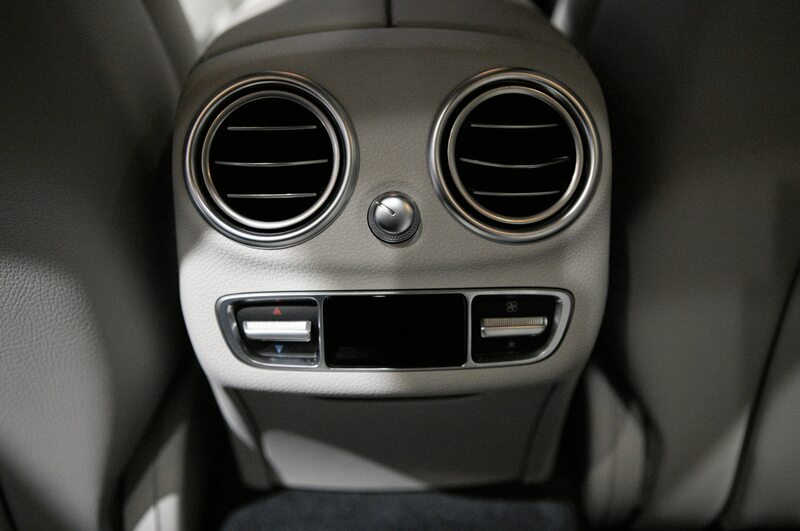 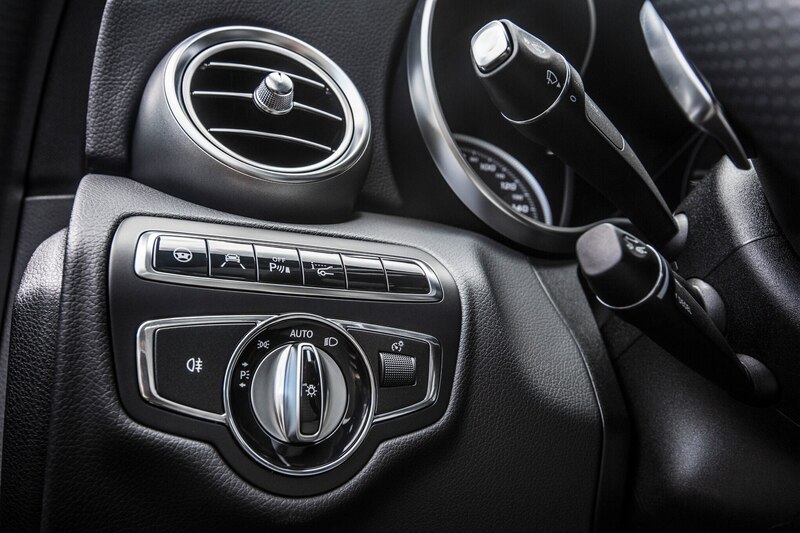 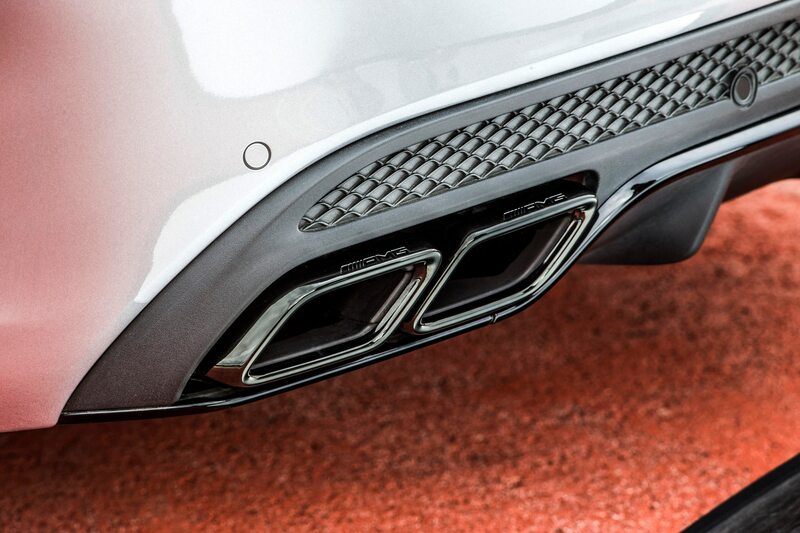 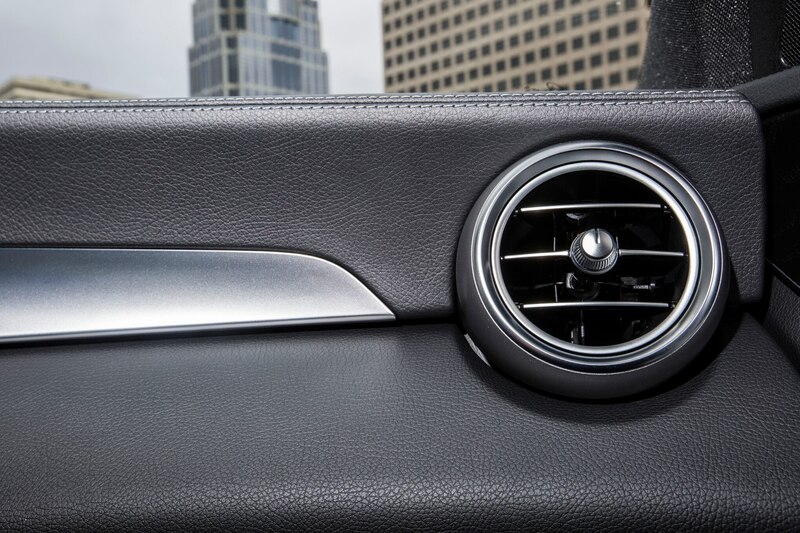 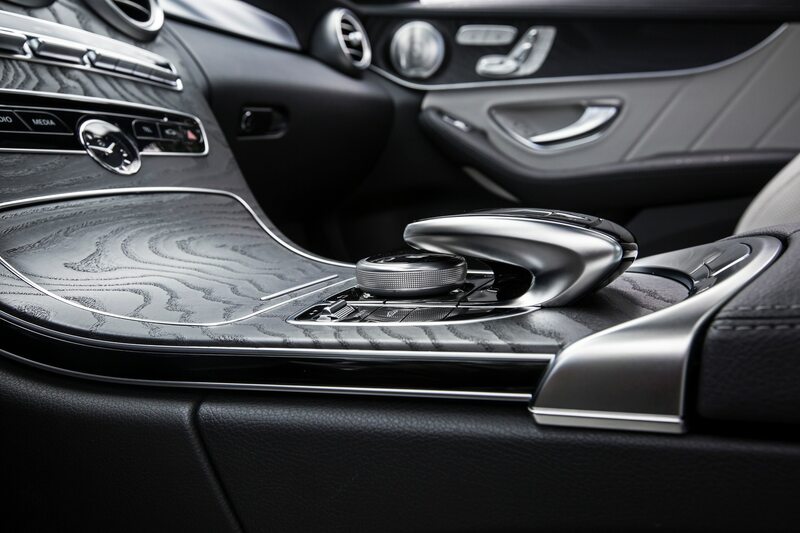 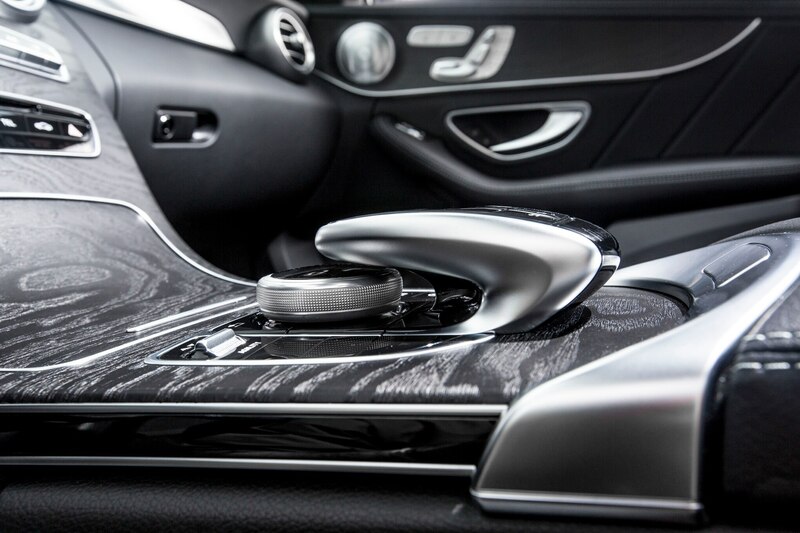 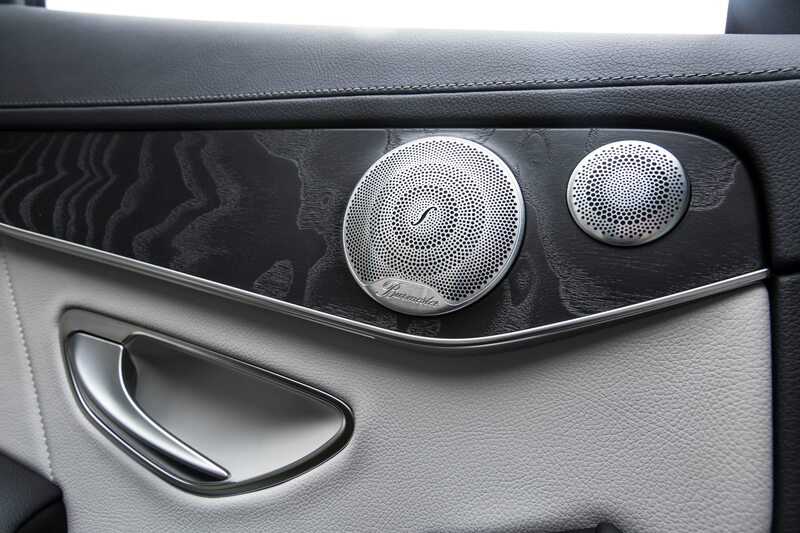 Large, turbine-like air vents remain a polarizing Mercedes design touch, but every control looks and feels hewn from high-quality materials, even the bits made of painted plastic. 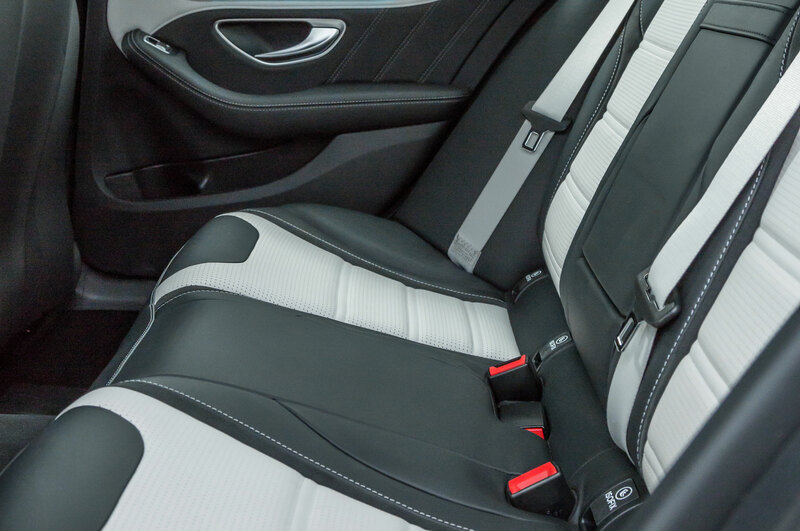 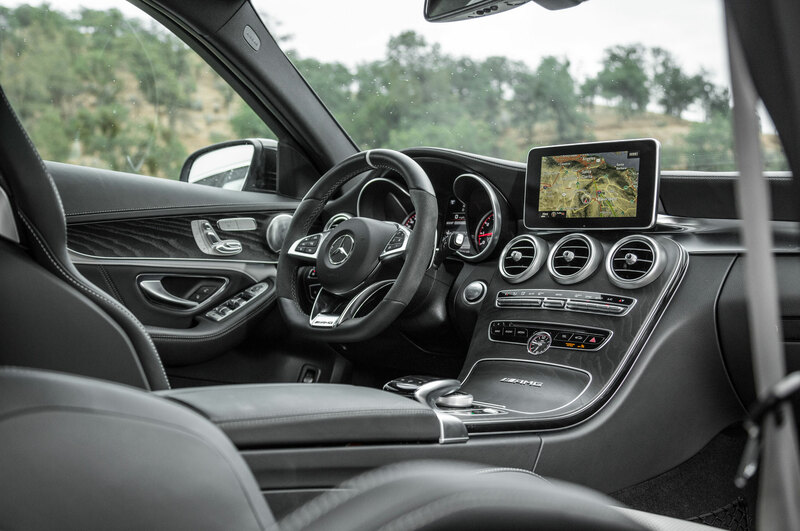 The comfy leather seats, bright LCD screens, and nicely weighted switches convey the sense that this car is a descendant of the S-Class, not a gussied-up version of the far cheaper (by $8500) CLA. 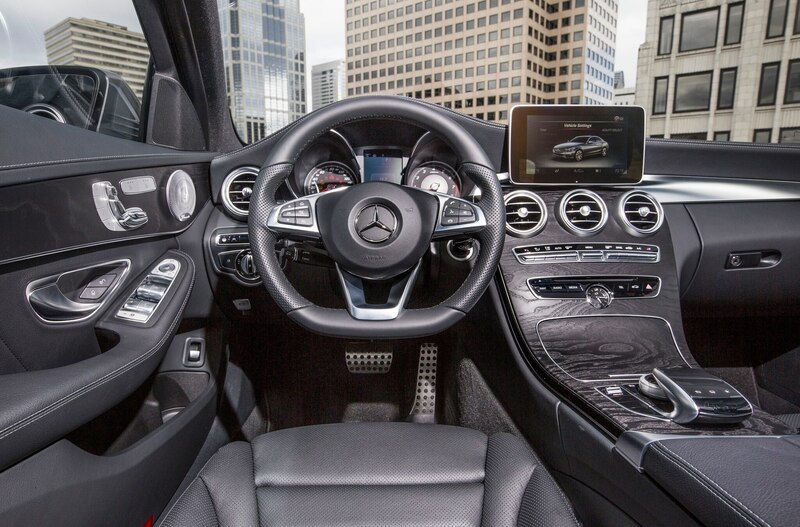 The one flaw with the interior is the way the 8.4-inch infotainment display (a 7.0-inch screen is standard) is integrated with the dashboard — or rather, not integrated. 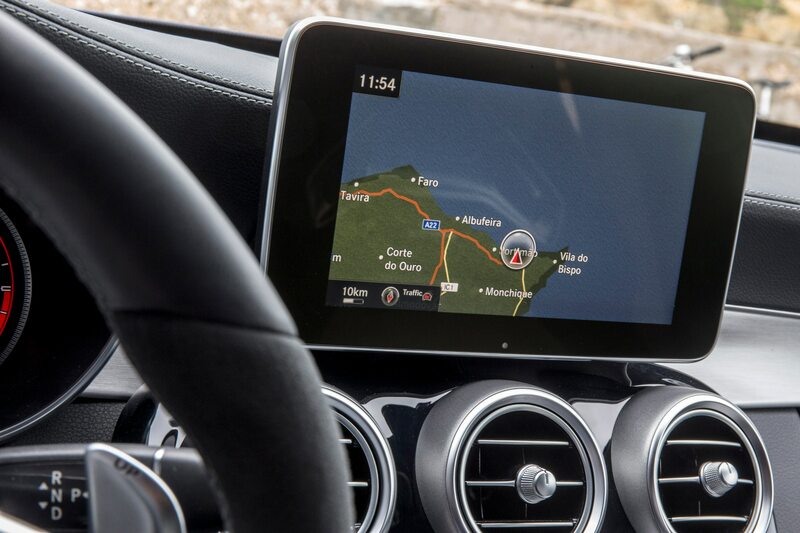 The screen looks like a tablet computer bolted to the dash; it doesn’t flow with the rest of the design. 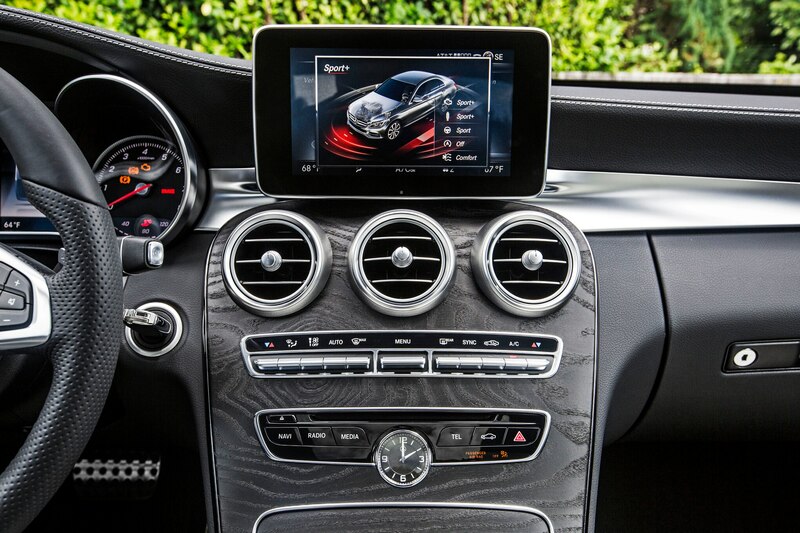 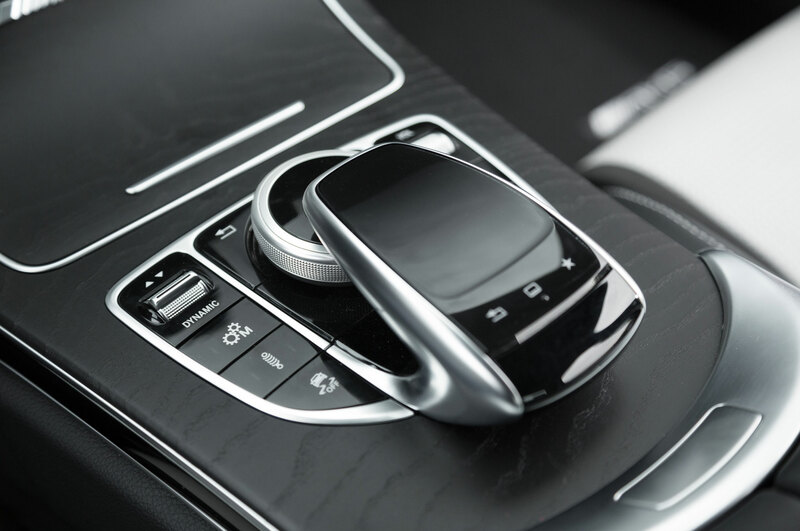 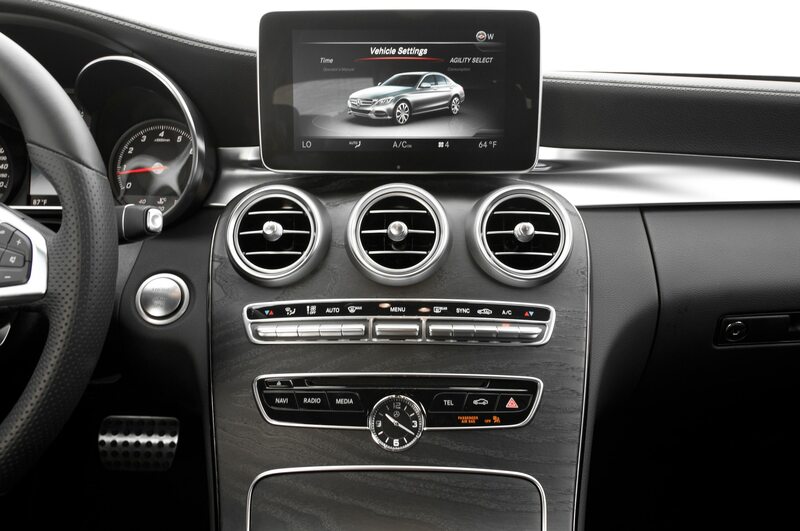 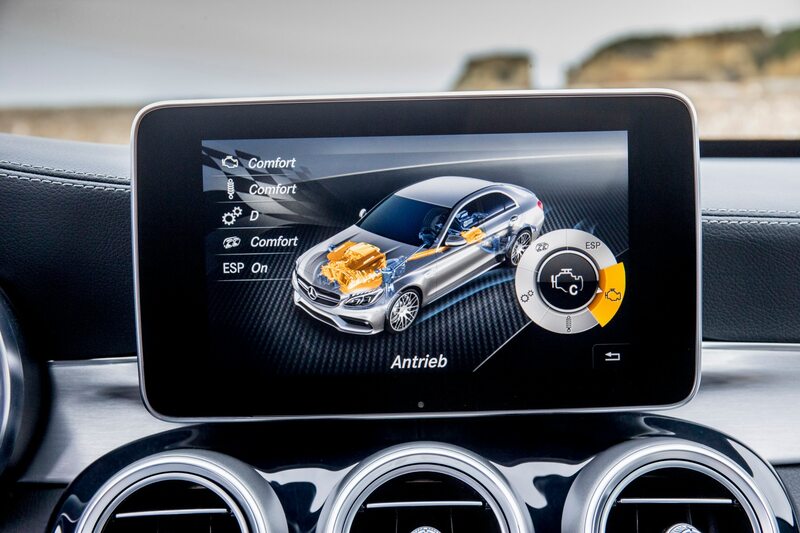 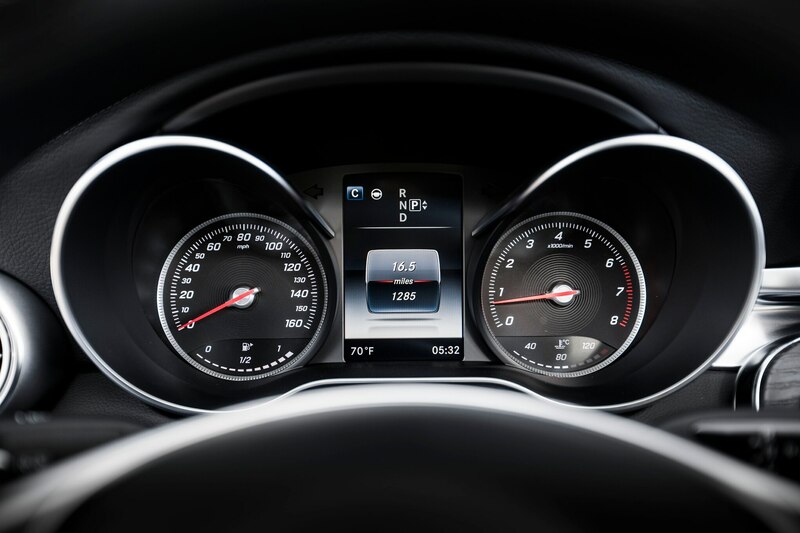 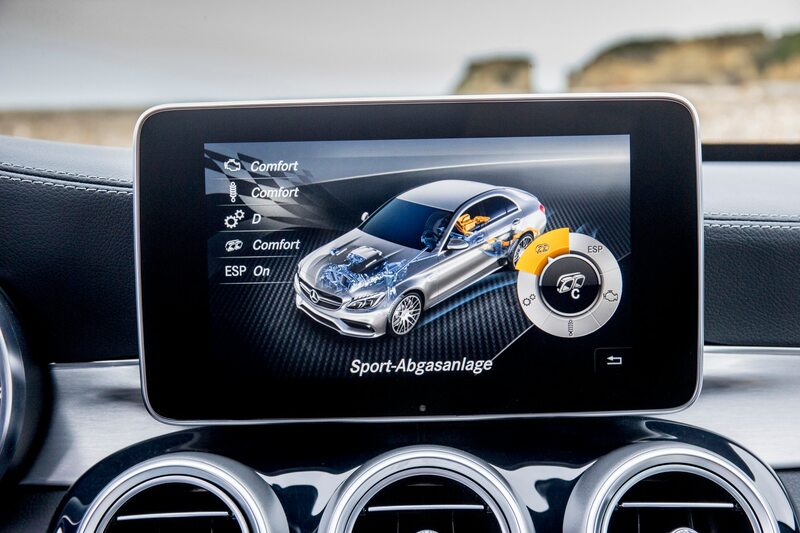 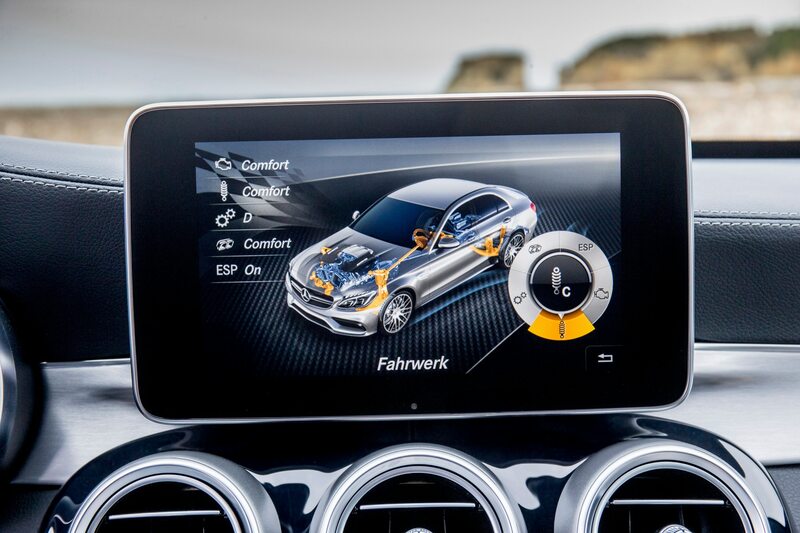 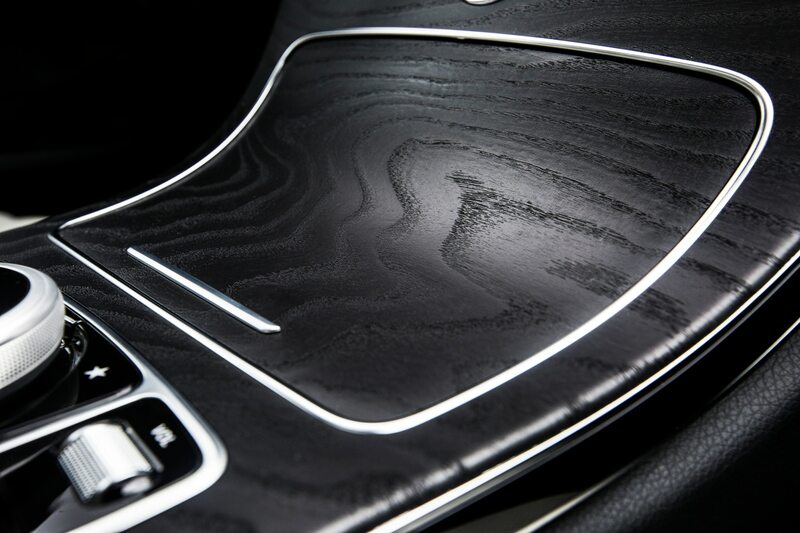 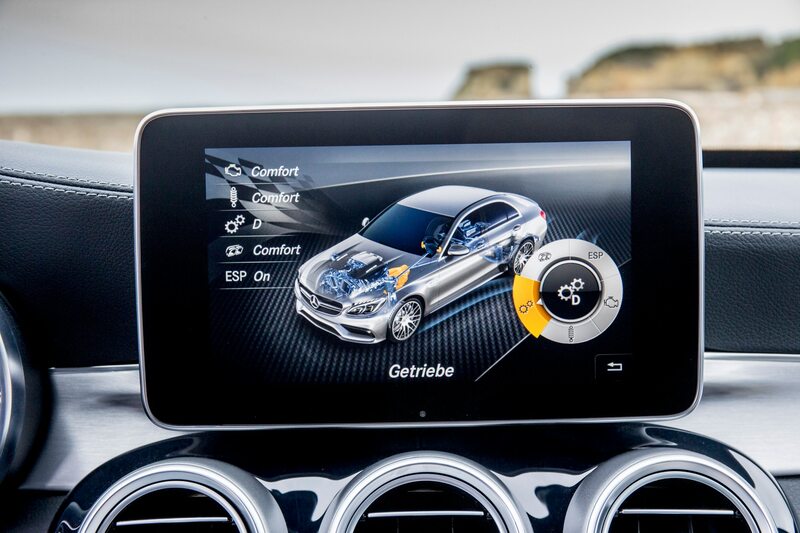 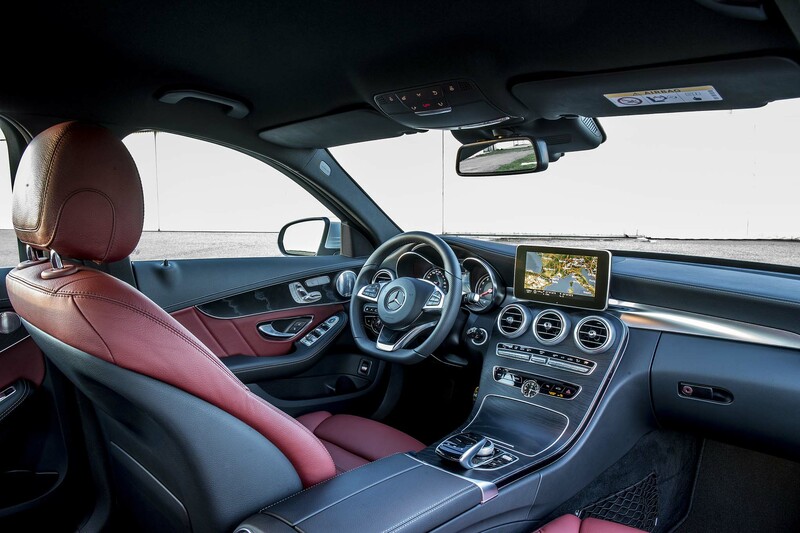 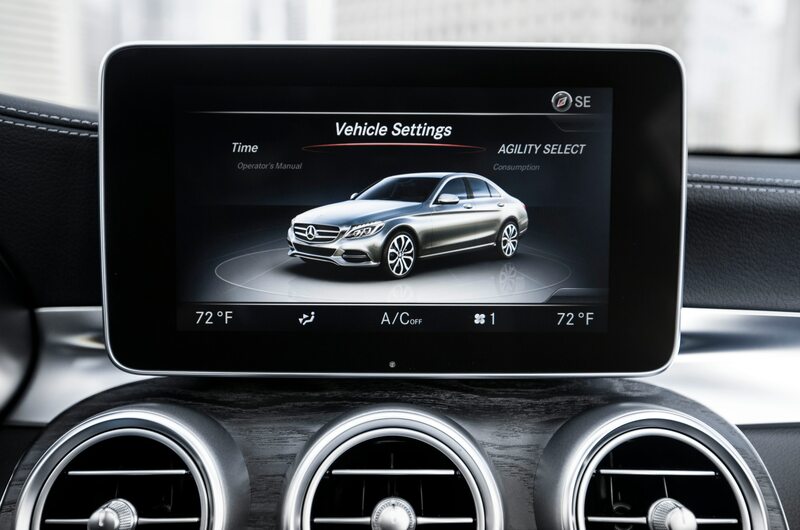 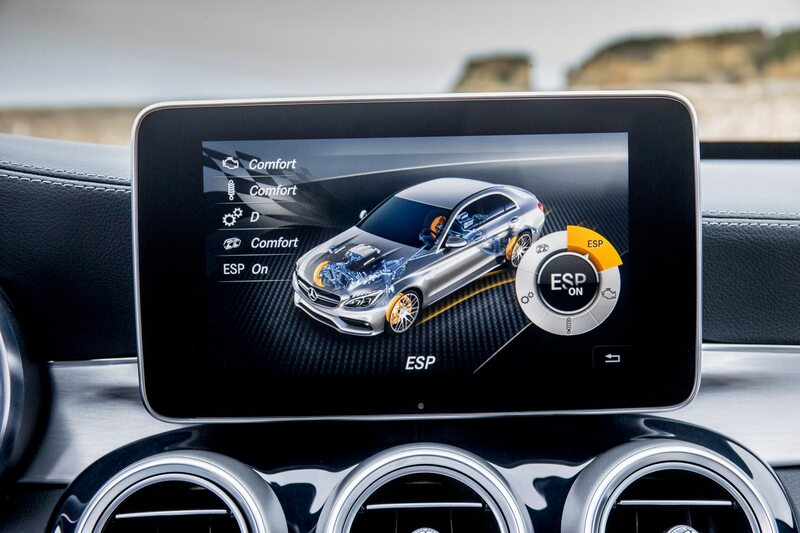 That might make sense for a touchscreen, but drivers operate the COMAND infotainment system with controls on the center console, including a touchpad that complements the Mercedes rotary dial we’ve come to love. 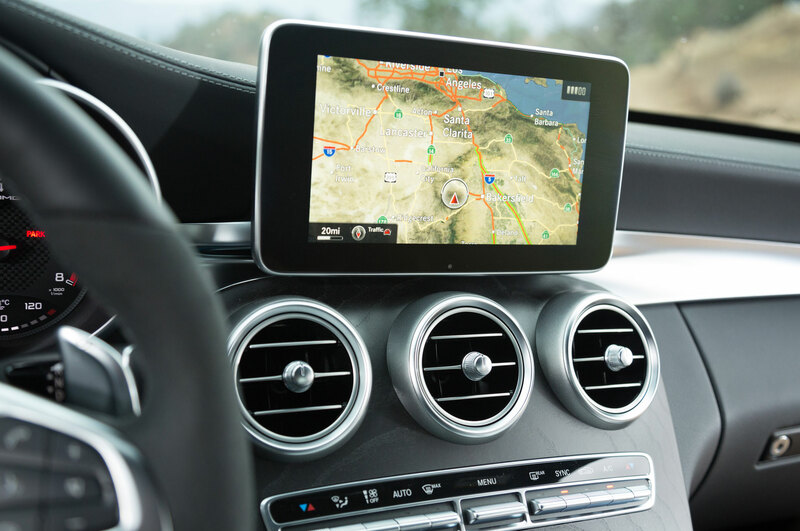 It operates like the knob, allowing you to flick and slide your finger across a black pad to navigate the menus, as well as perform a few new tricks like “writing” letters for navigation addresses. 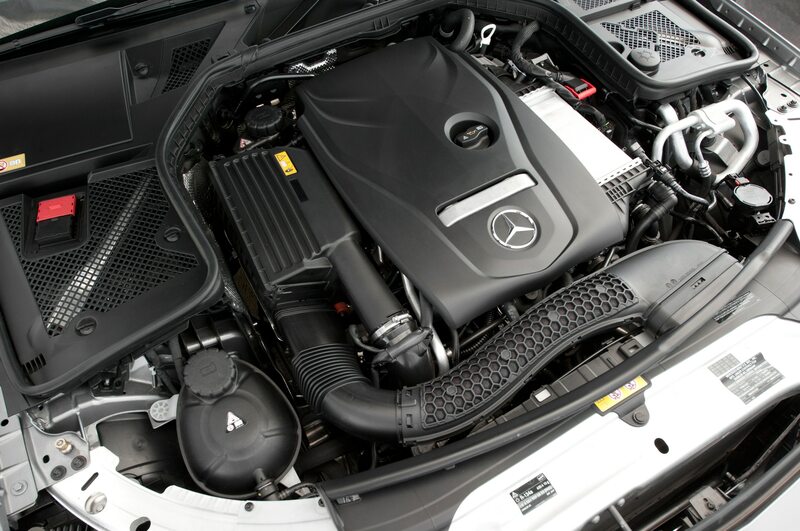 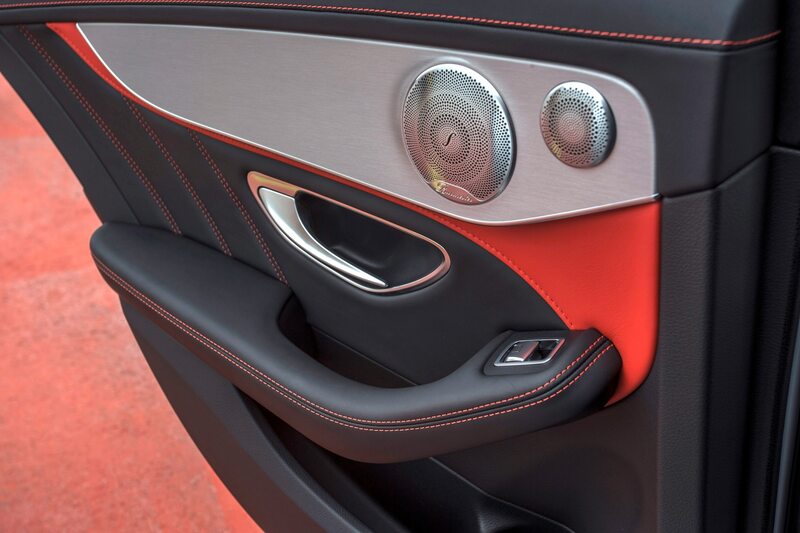 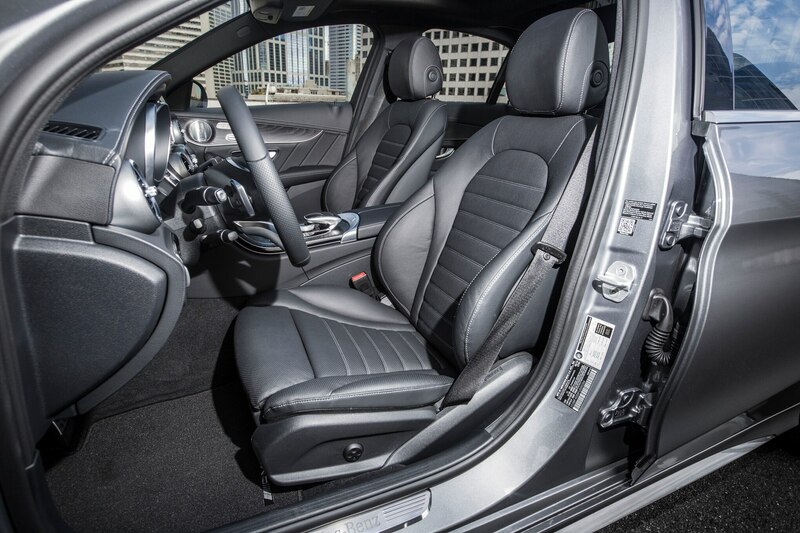 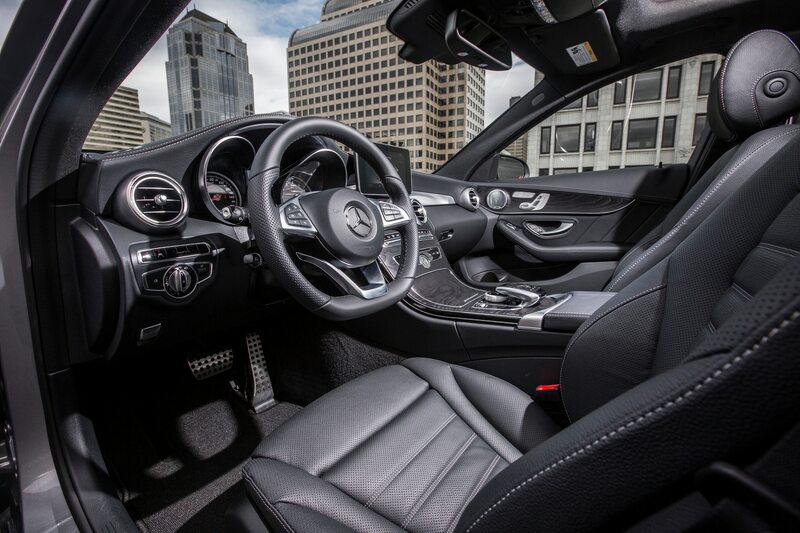 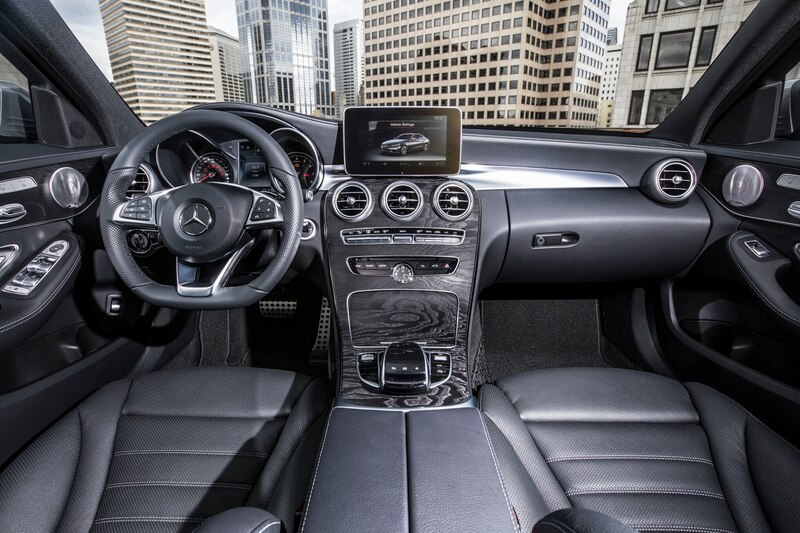 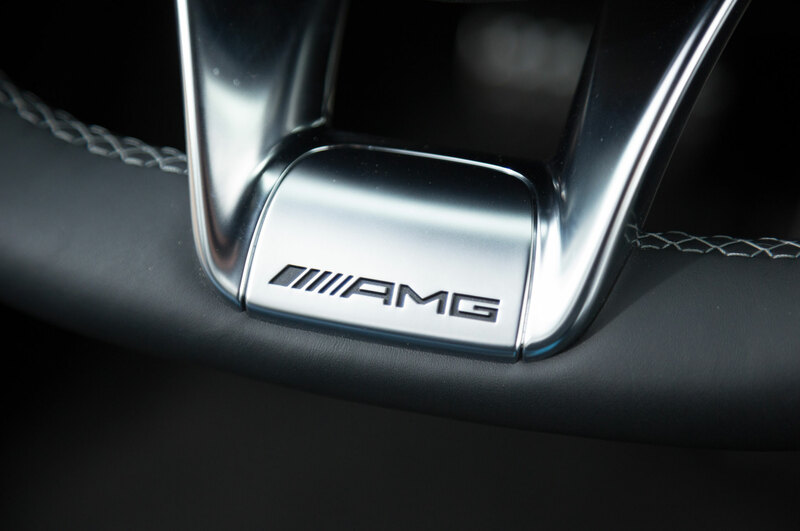 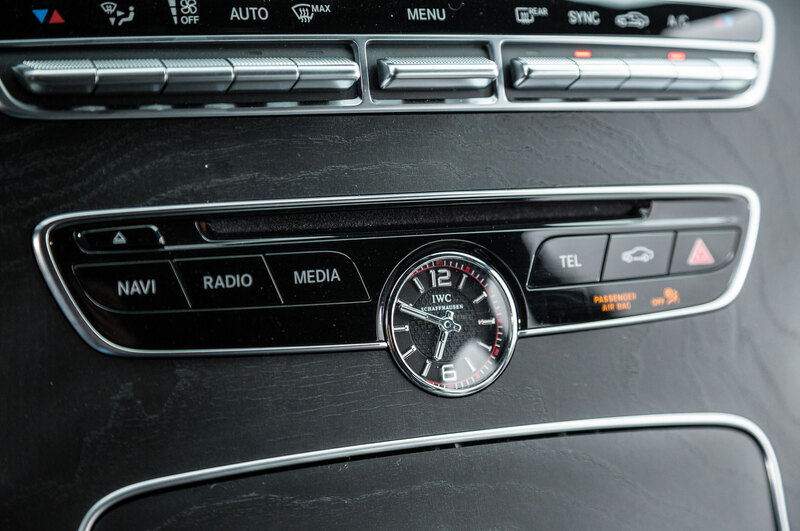 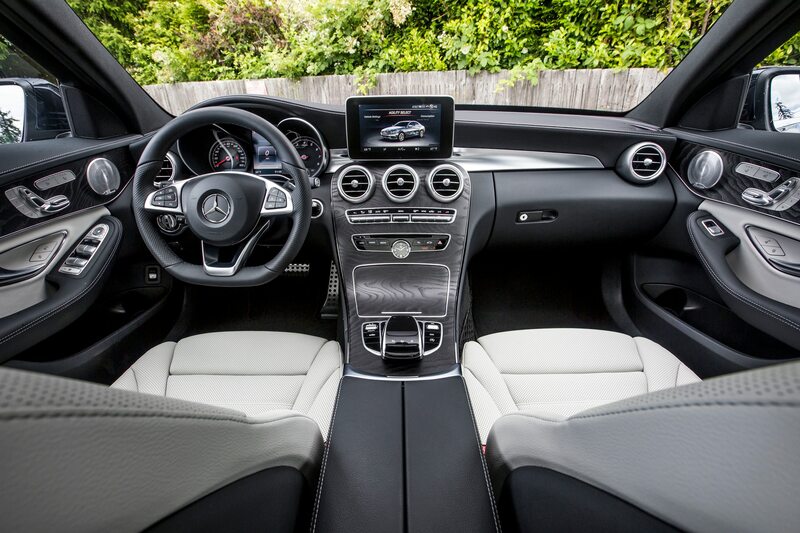 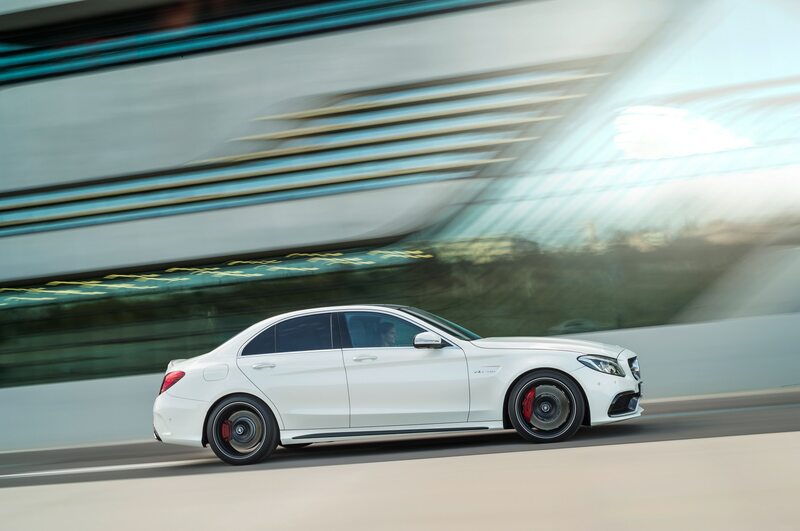 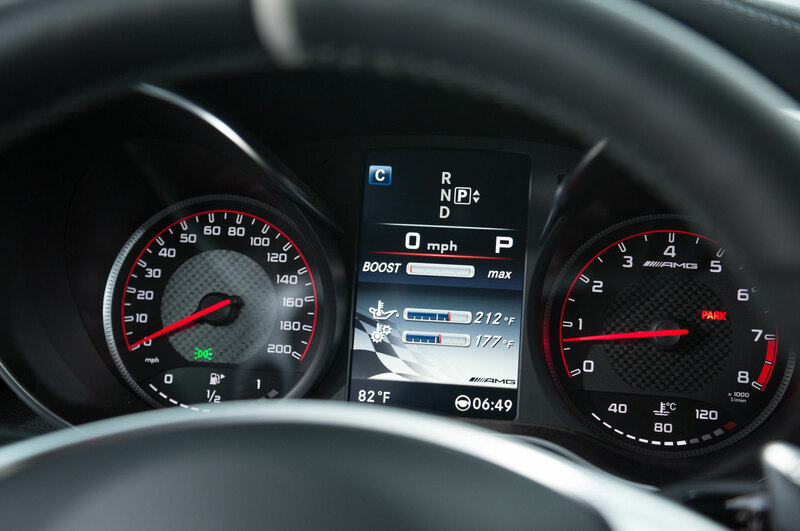 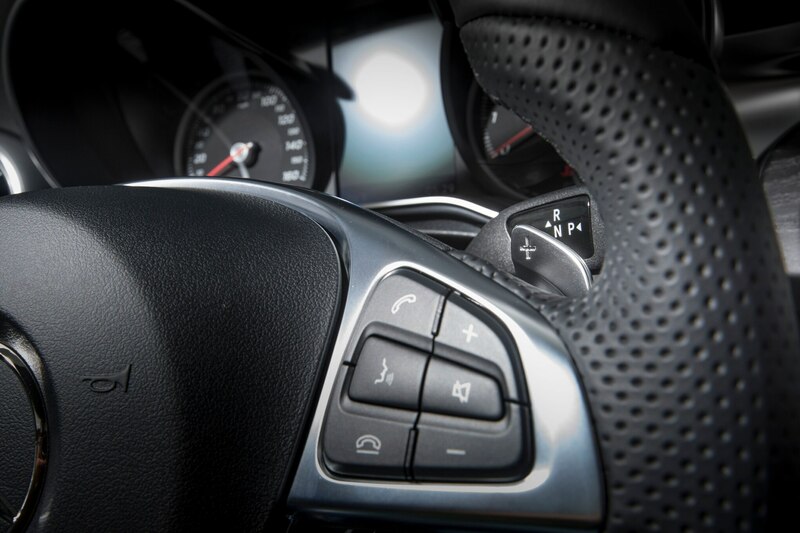 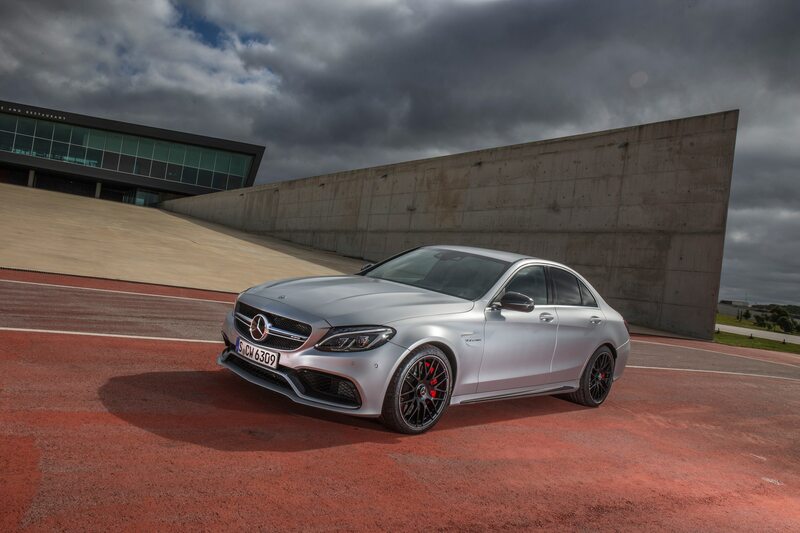 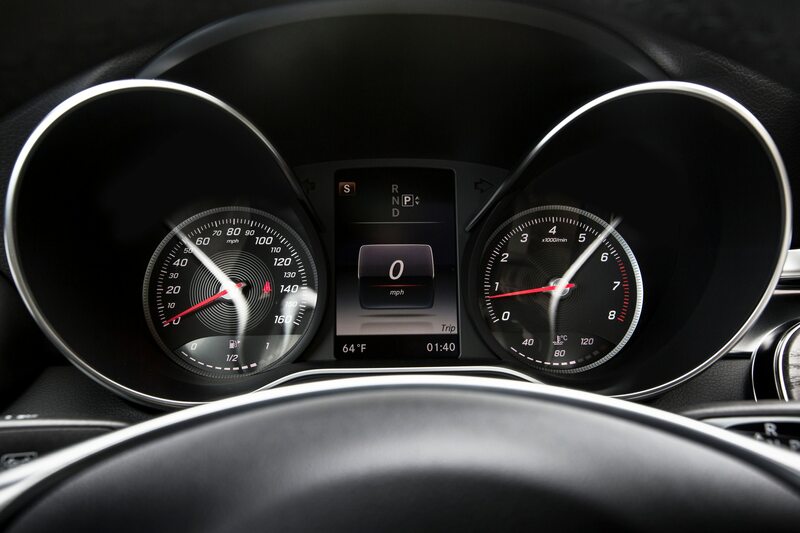 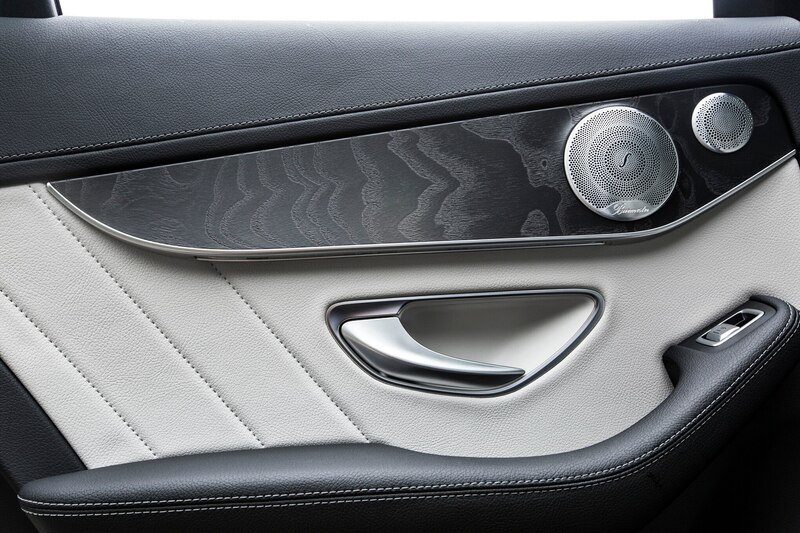 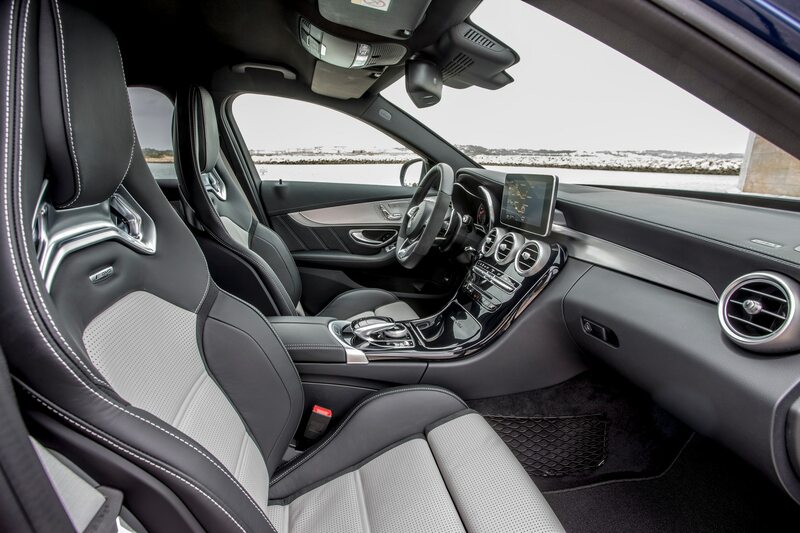 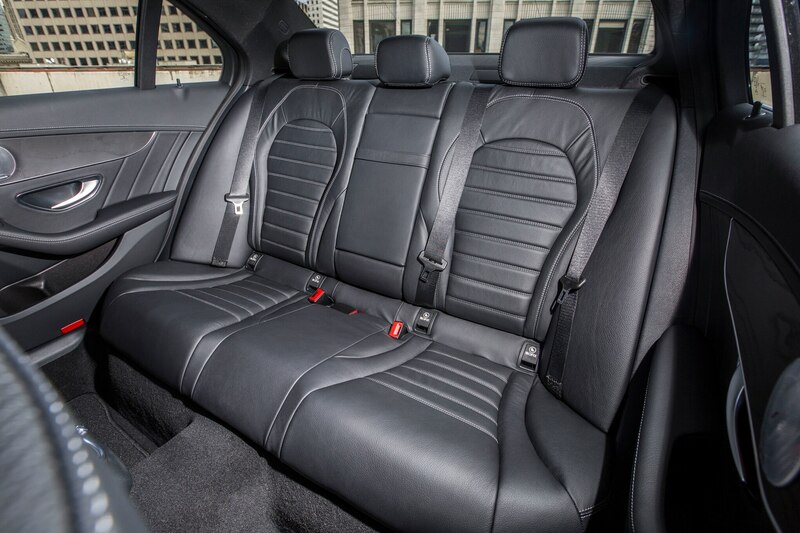 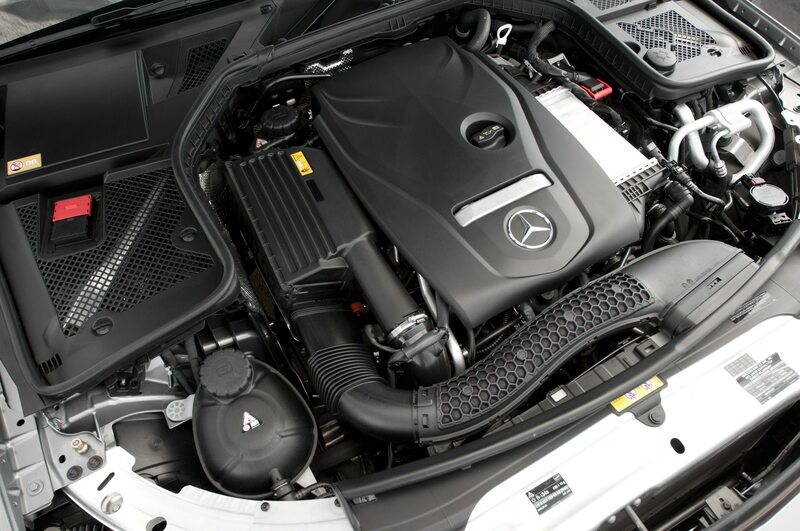 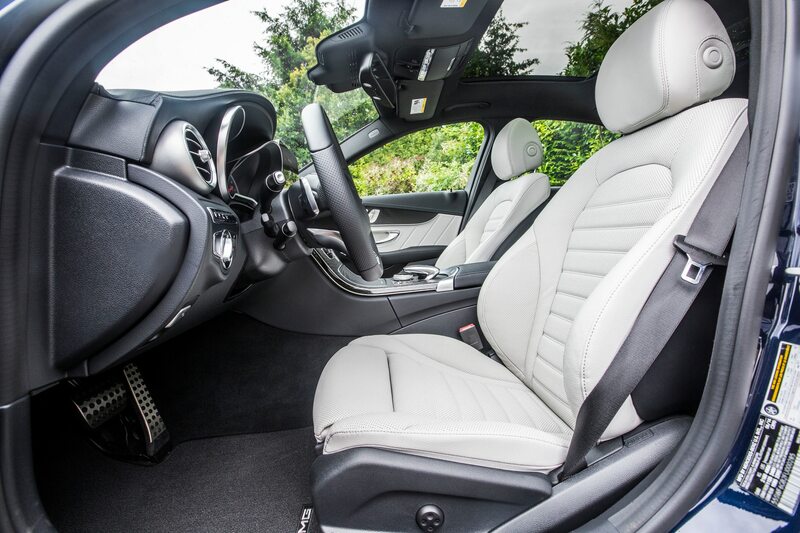 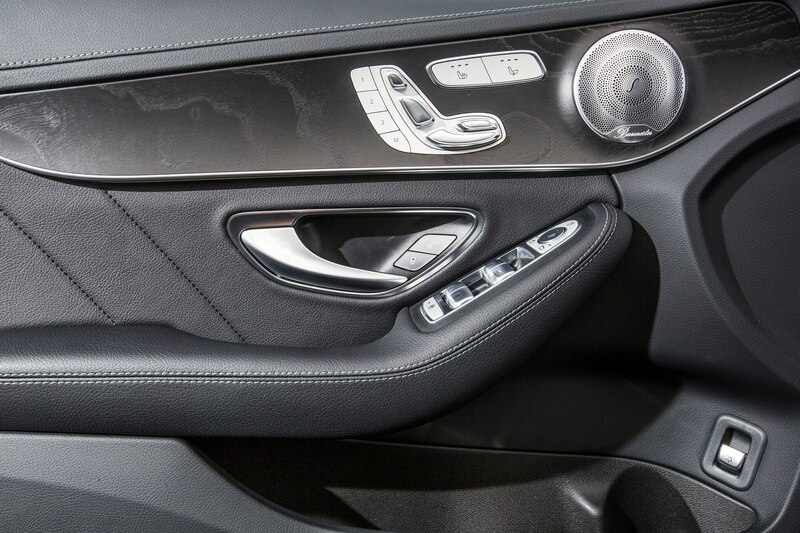 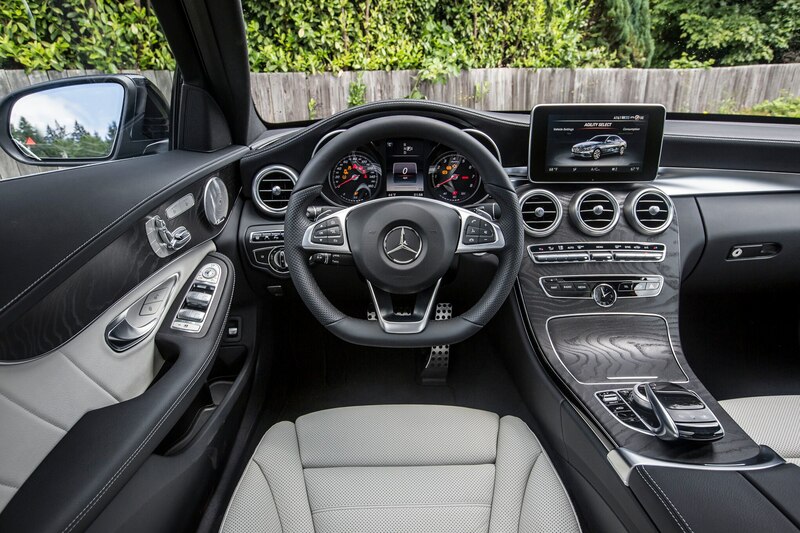 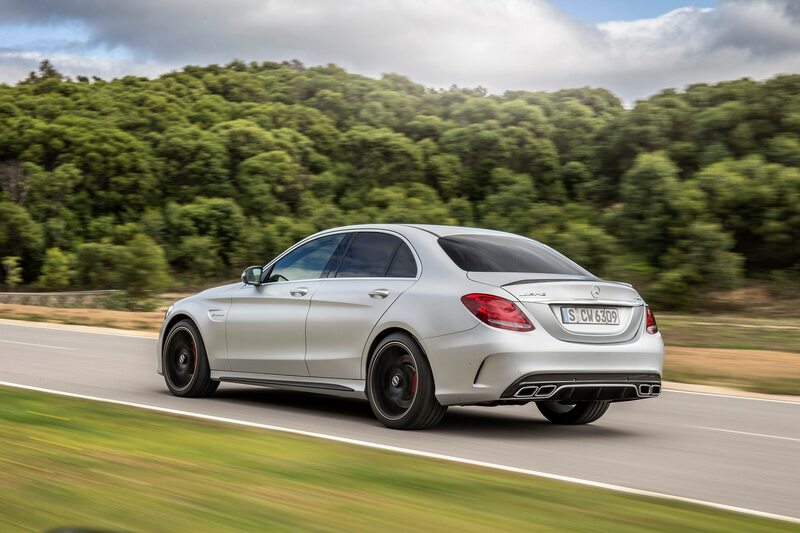 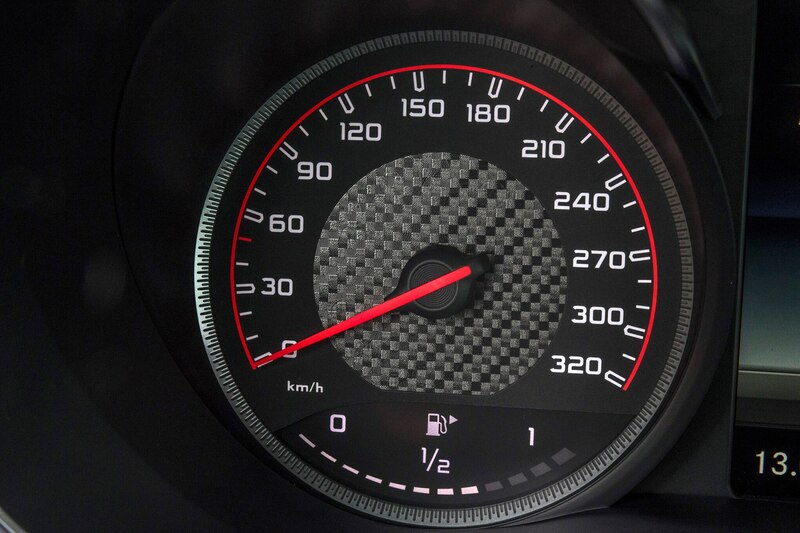 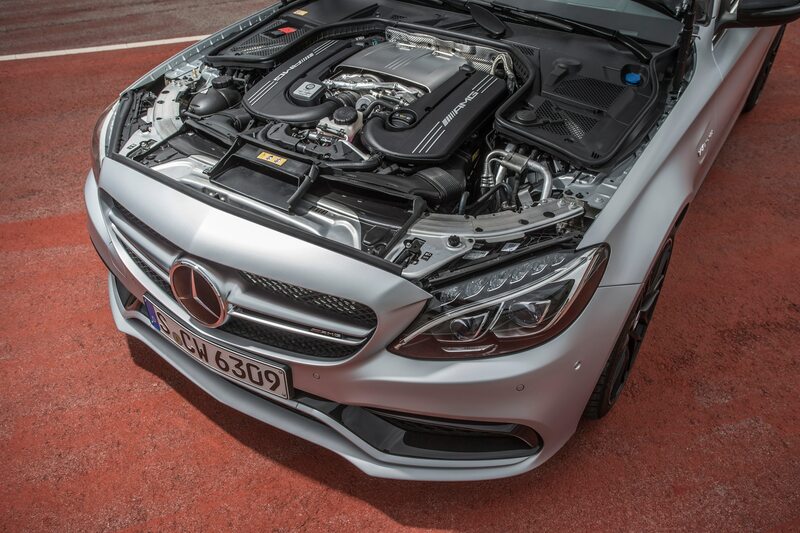 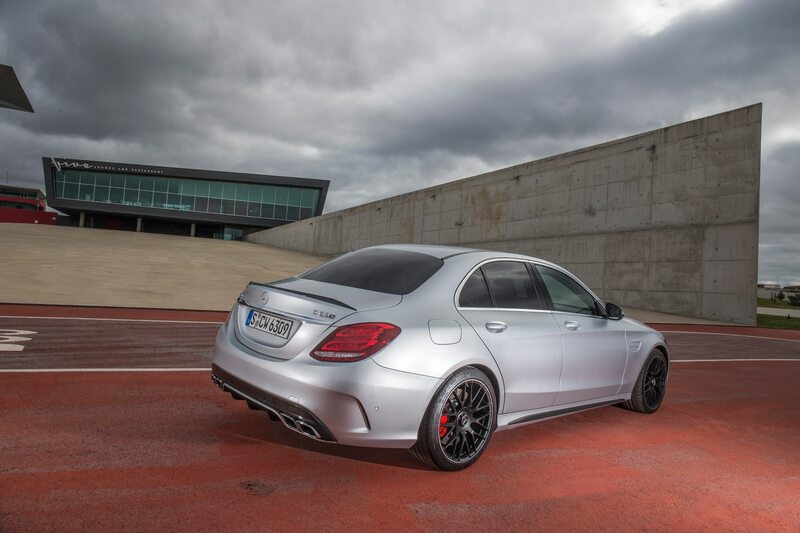 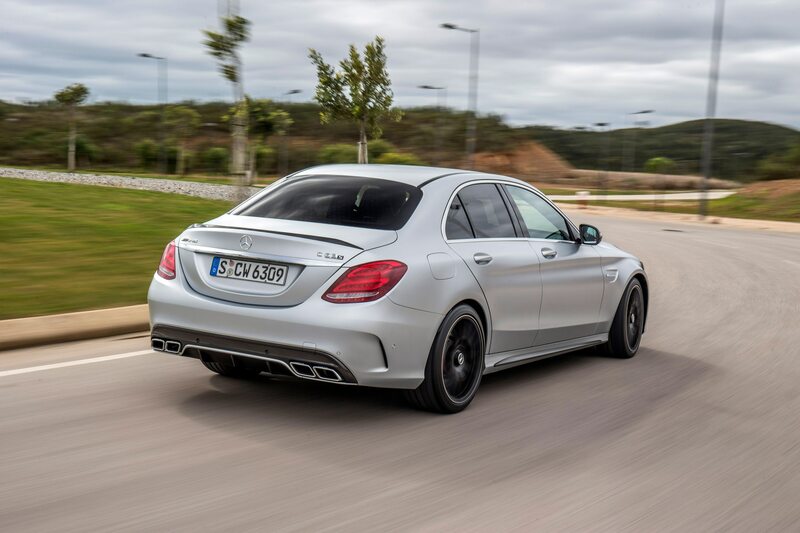 The ’15 C300 has standard equipment that was optional on the old car, including pushbutton start. 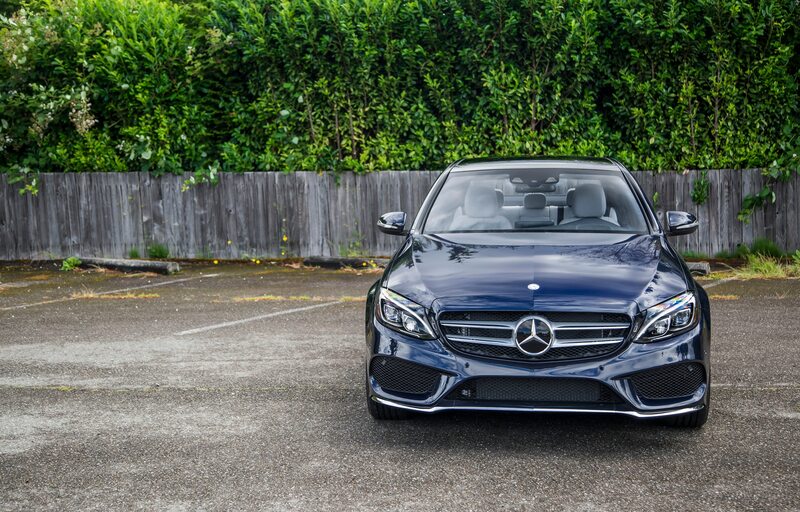 Our first test car, a C300 4Matic, also had the $2500 Sport package with a lower ride height, larger, cross-drilled front brakes, stainless-steel pedals, sportier seats, a flat-bottom steering wheel, and special front grille treatment; plus the $2700 Premium pack with a few goodies otherwise reserved for the C400; and the $2690 Multimedia pack that bundles a backup camera (it’s still not standard!) 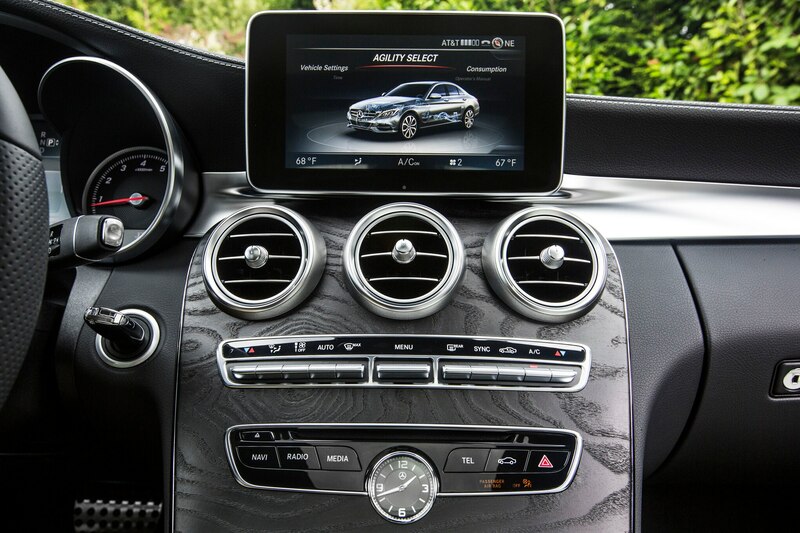 and the COMAND infotainment system. 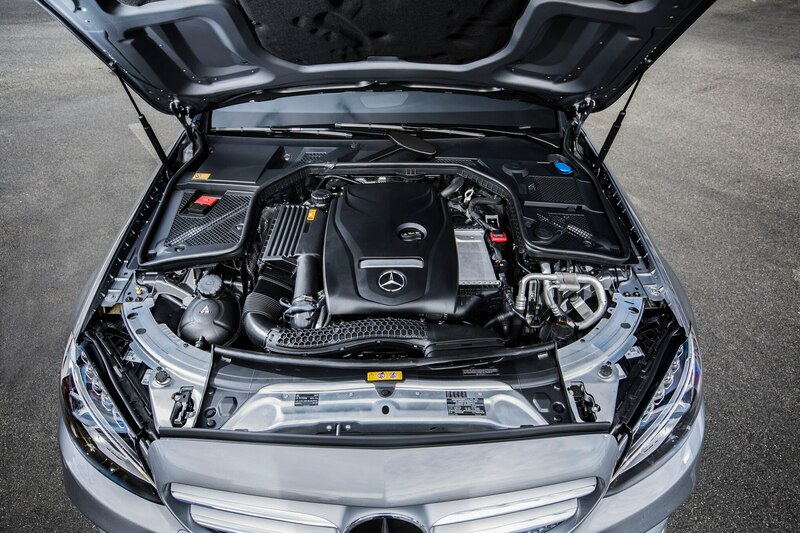 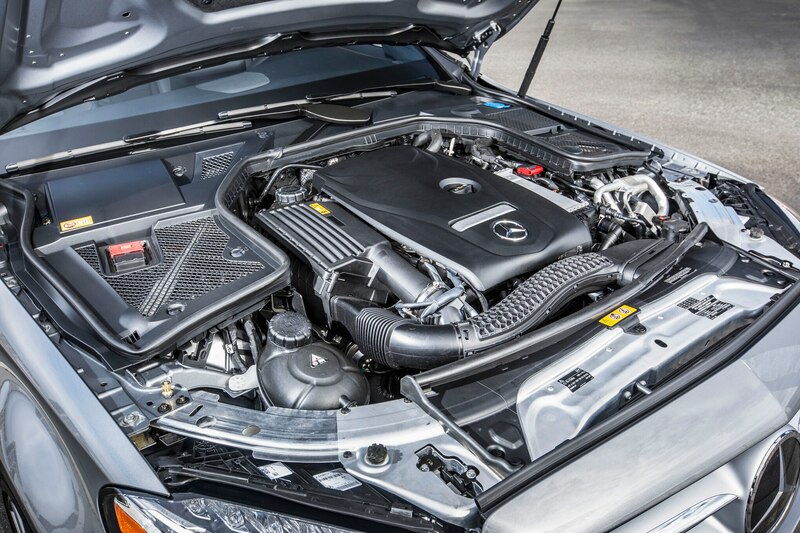 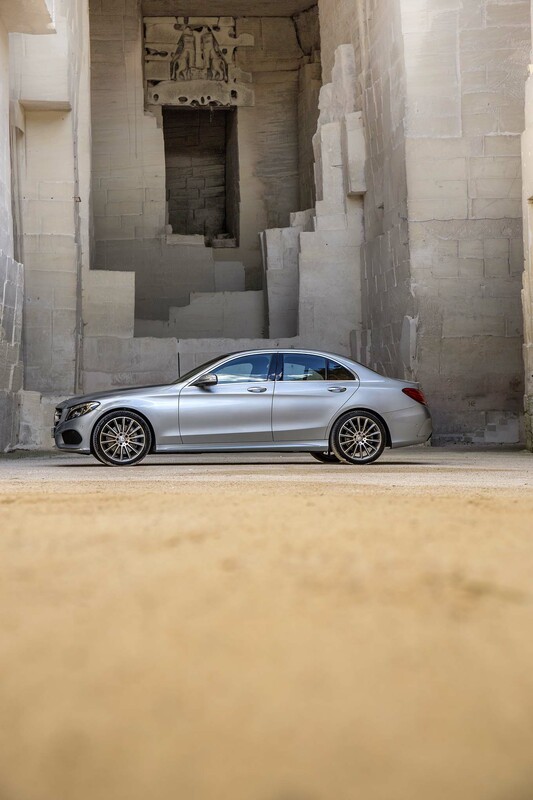 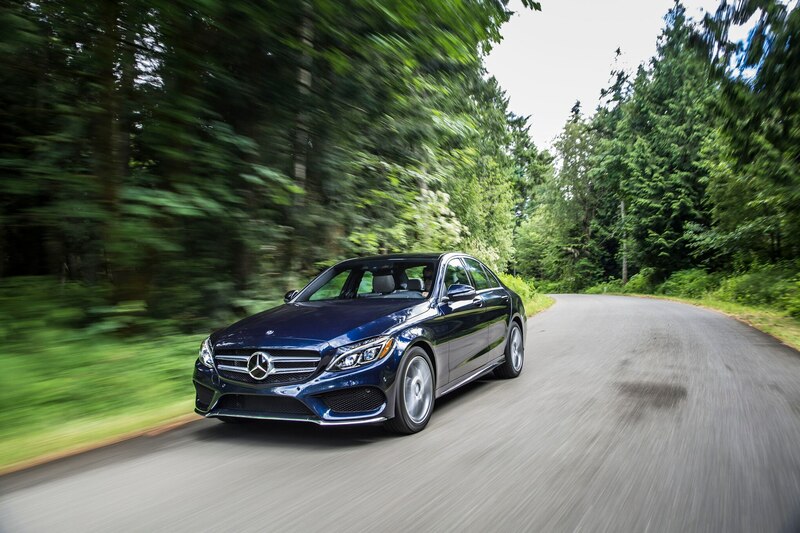 Though the 2015 Mercedes-Benz C-Class grows 3.7 inches in length and 1.5 inches in width, extensive use of aluminum and high-strength steels lowers the curb weight by about 200 pounds, to 3200-3700 pounds, depending on equipment. 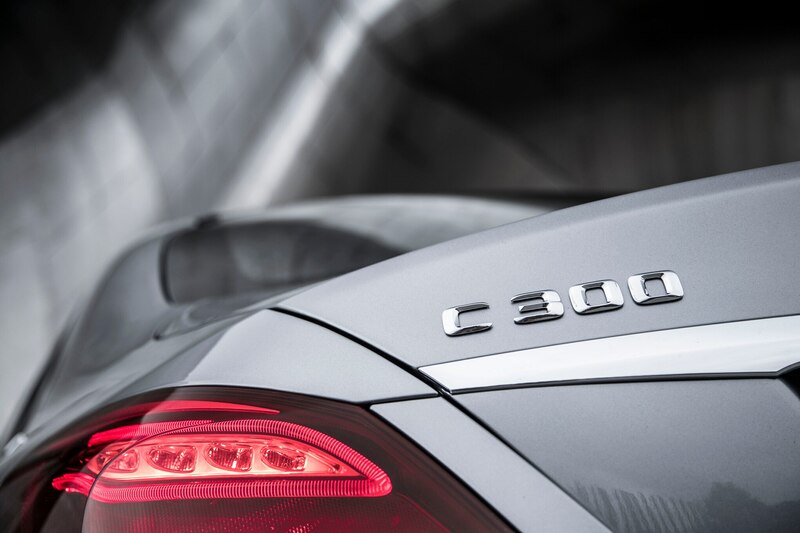 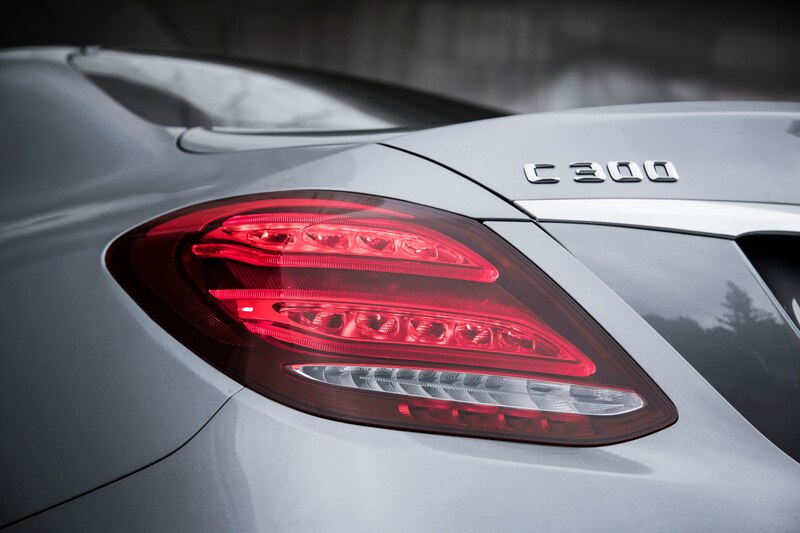 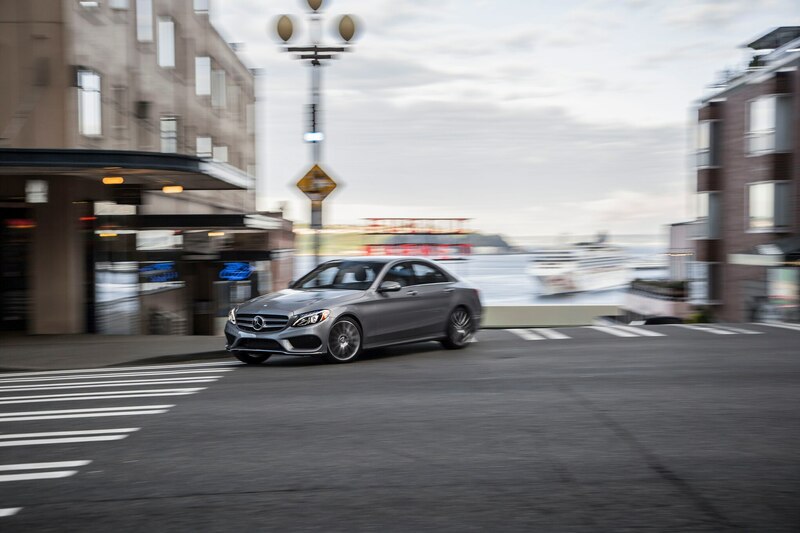 The diet means the C300’s 2.0-liter turbo has more than enough power to deliver lag-free response, even with 4Matic all-wheel drive. 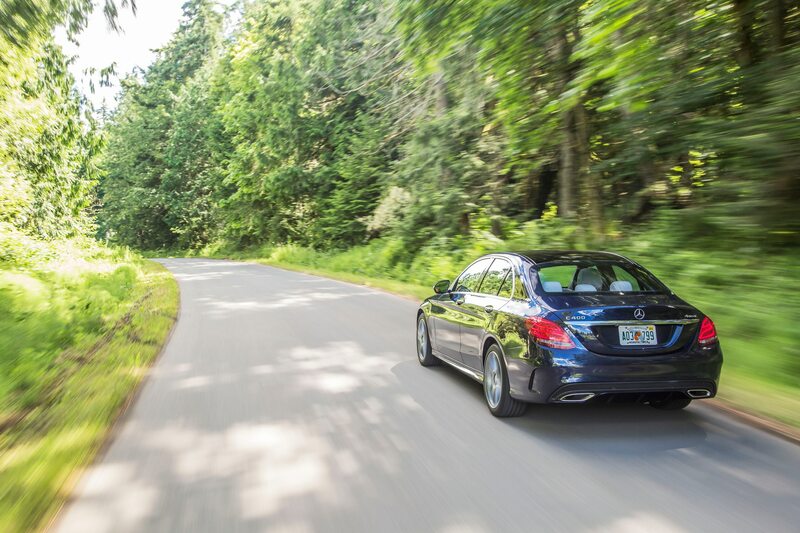 It’s an absolute gem, just as happy to slink around gridlocked streets as to power up steep hills, then wake up and quickly pass, say, a Subaru Forester trundling down a two-lane road. 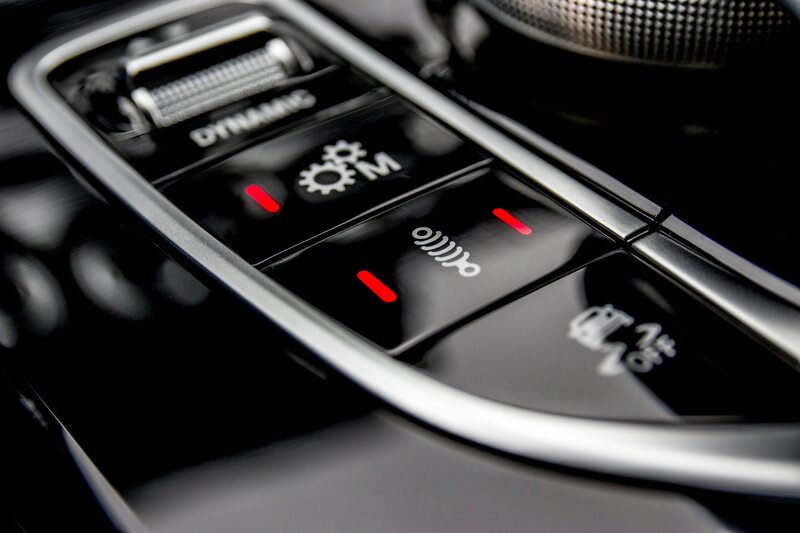 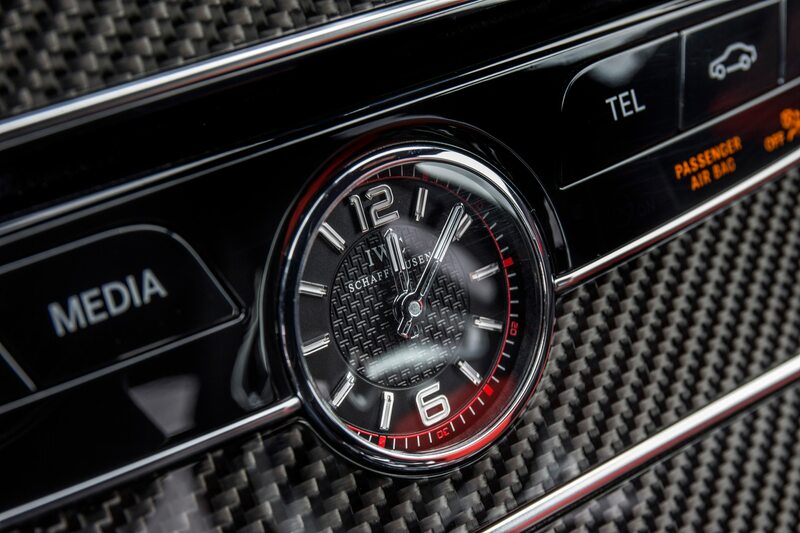 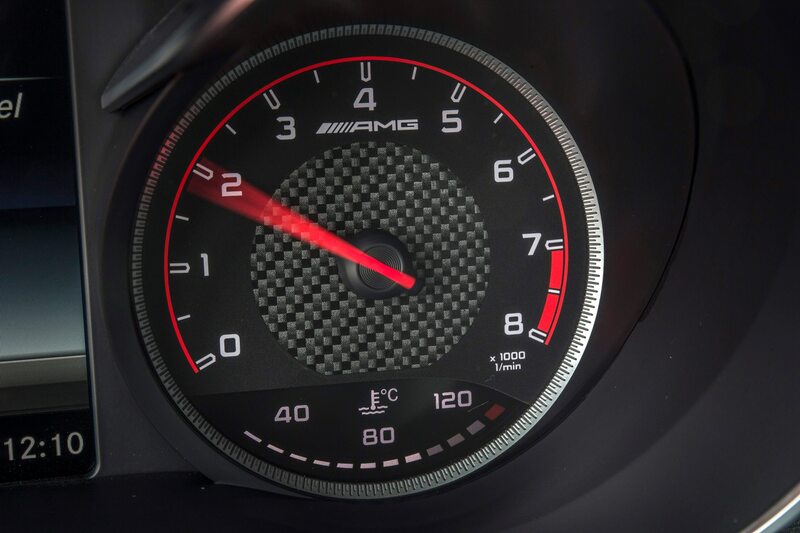 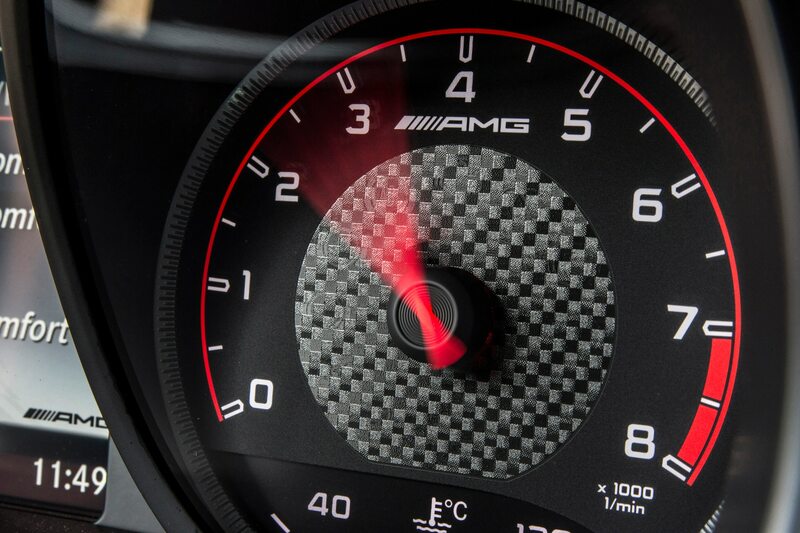 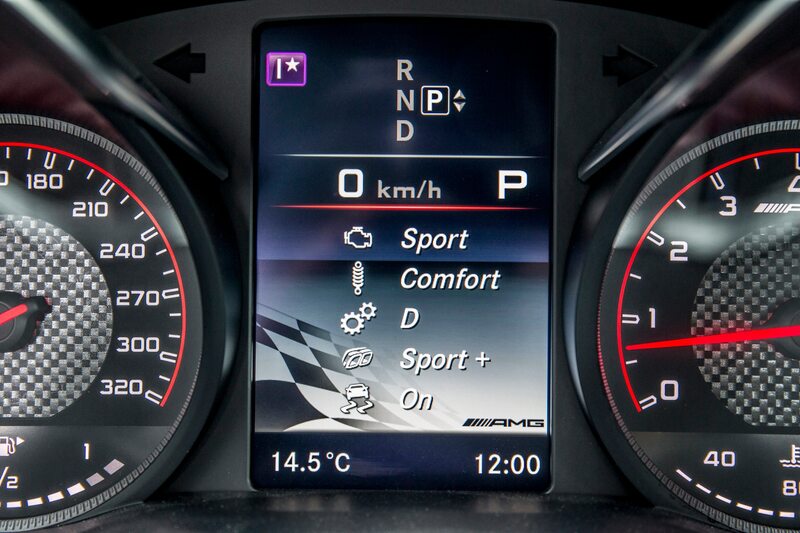 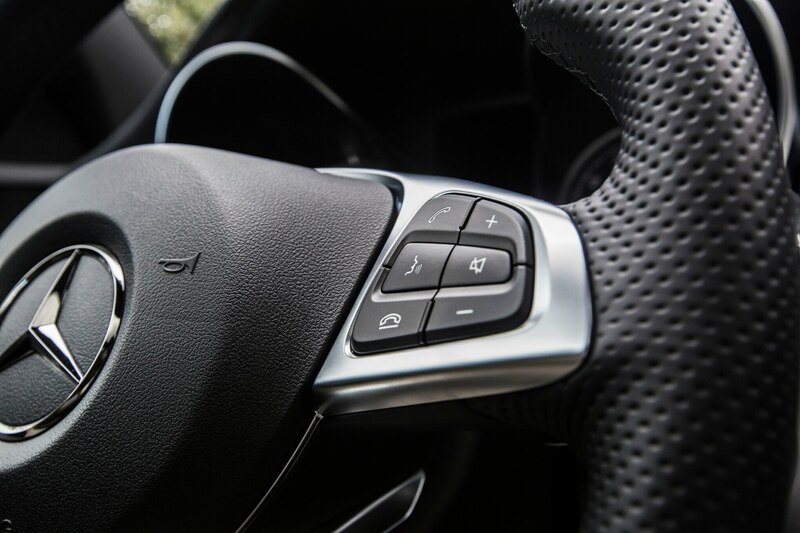 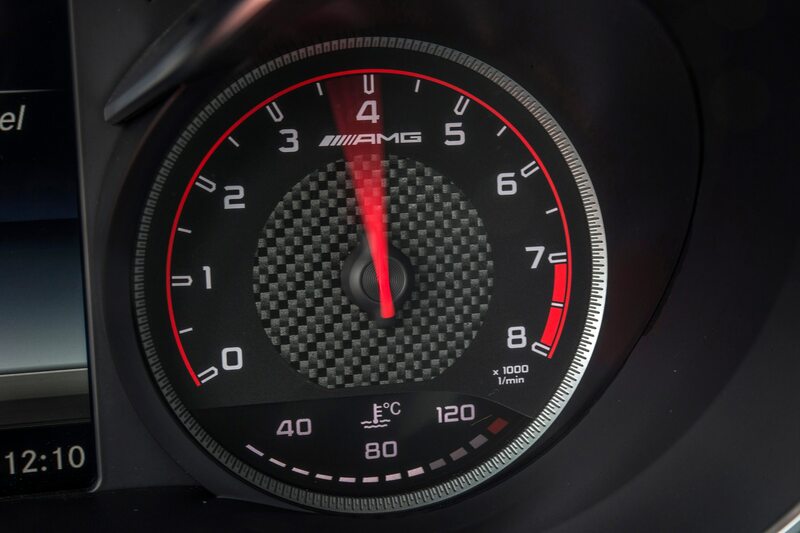 The seven-speed automatic nicely accompanies throttle tip-in. 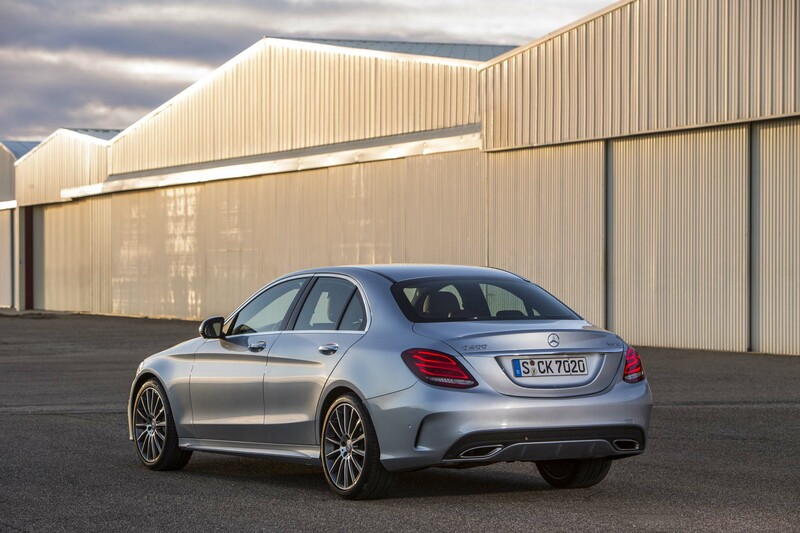 While Mercedes expects the C300 4Matic to be the volume variant, it will offer a slightly cheaper, rear-drive-only C300 in the U.S. starting next spring. 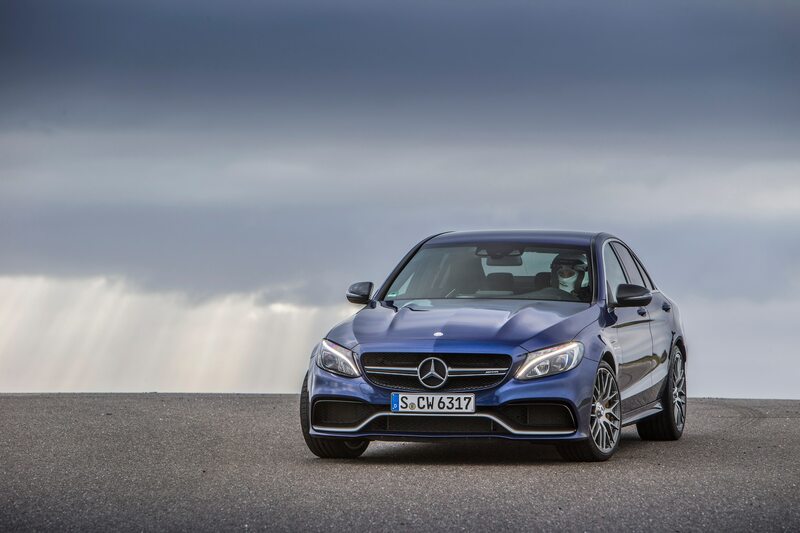 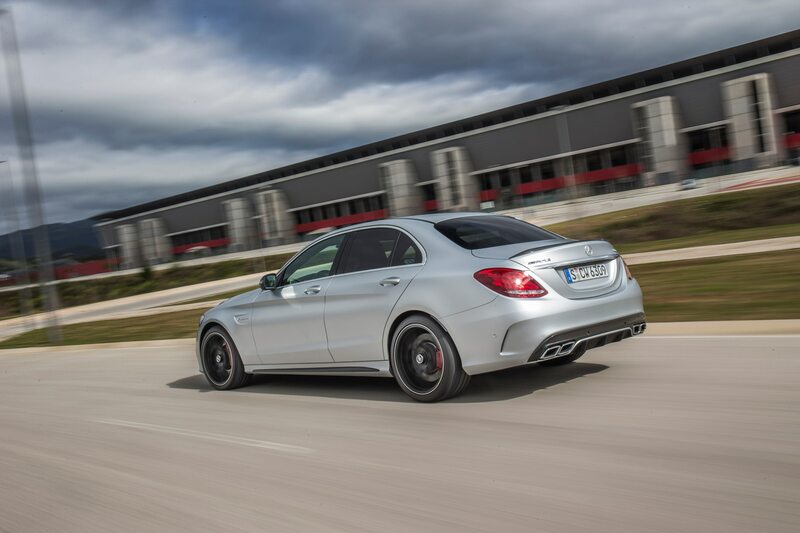 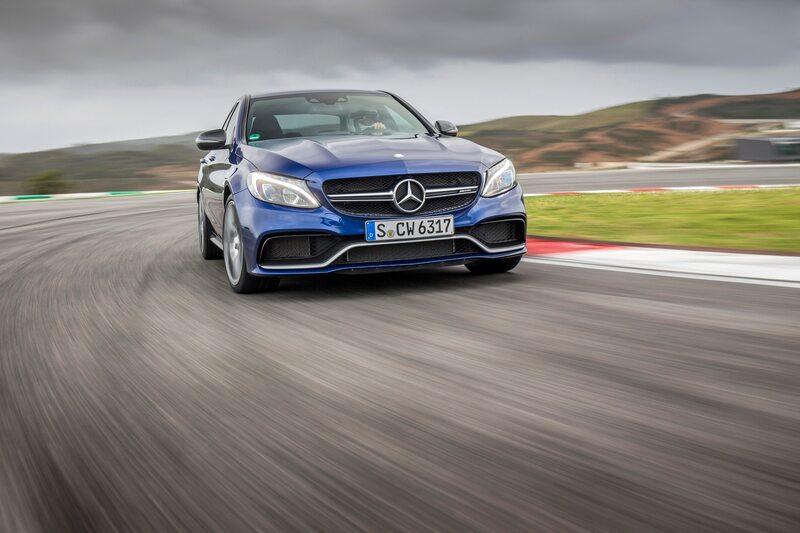 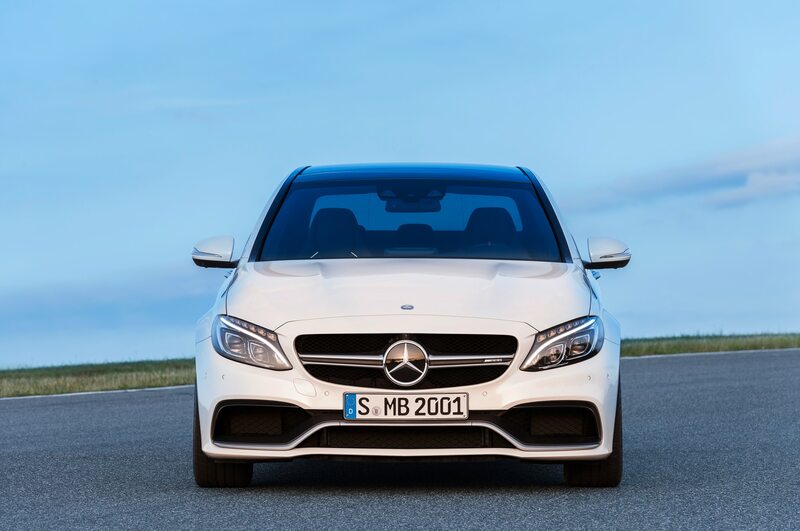 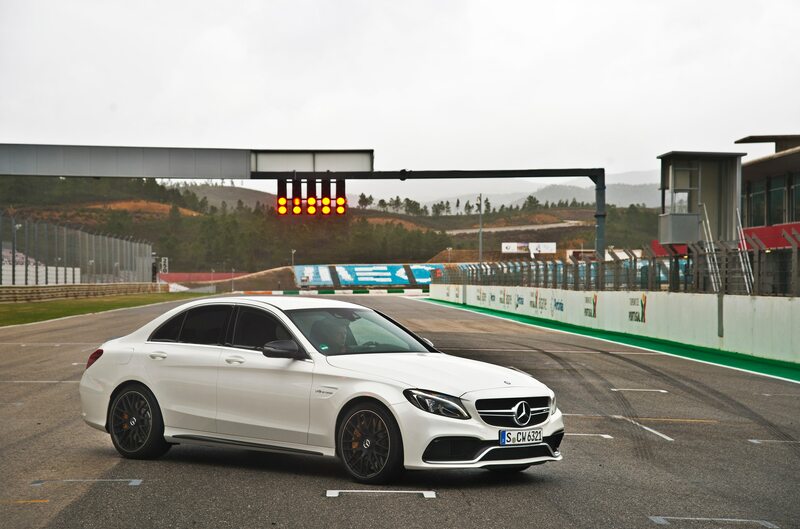 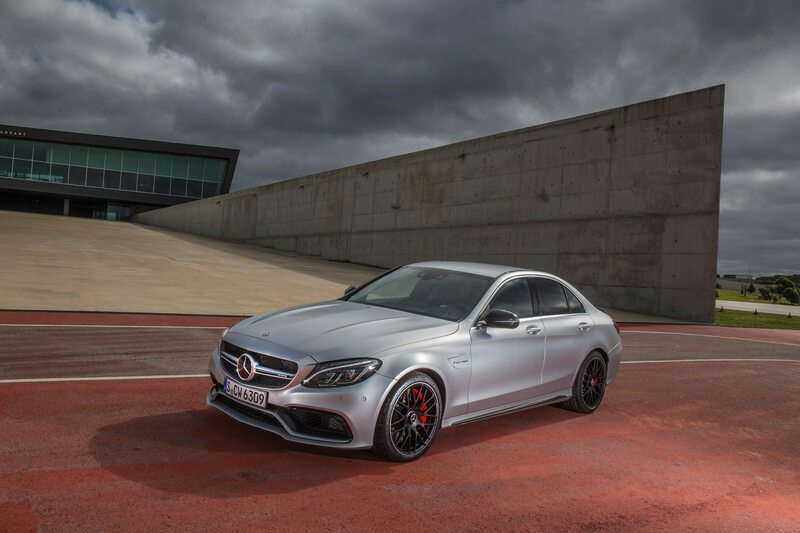 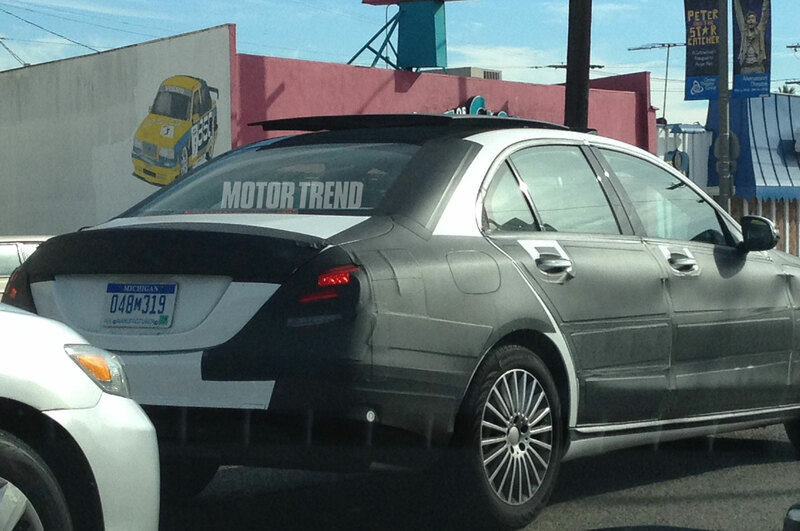 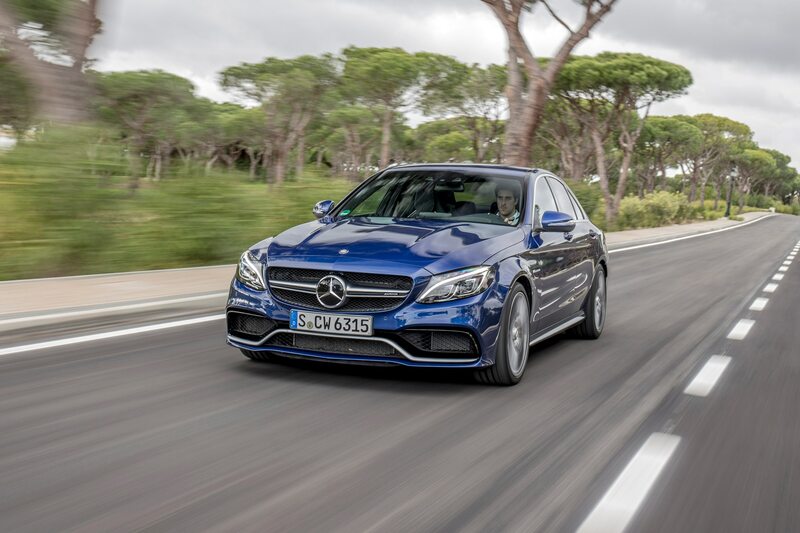 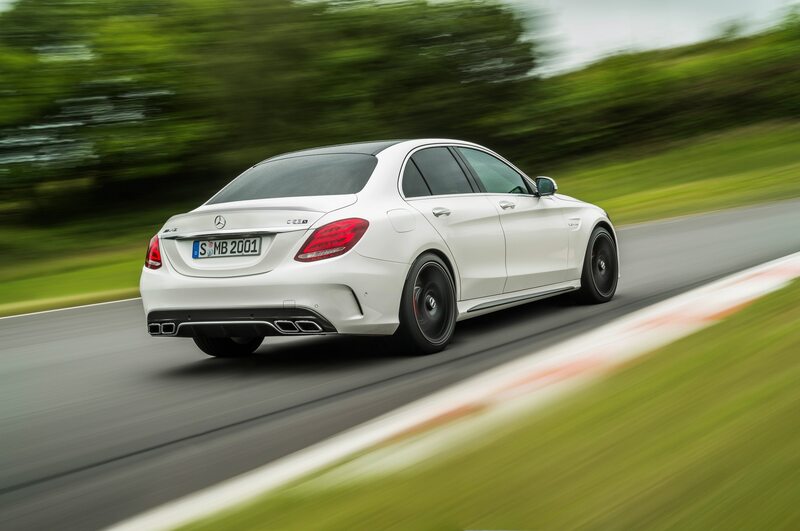 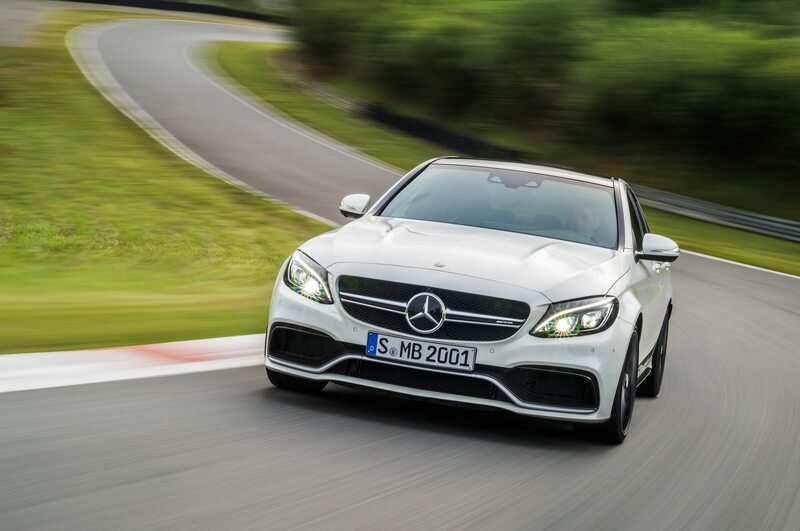 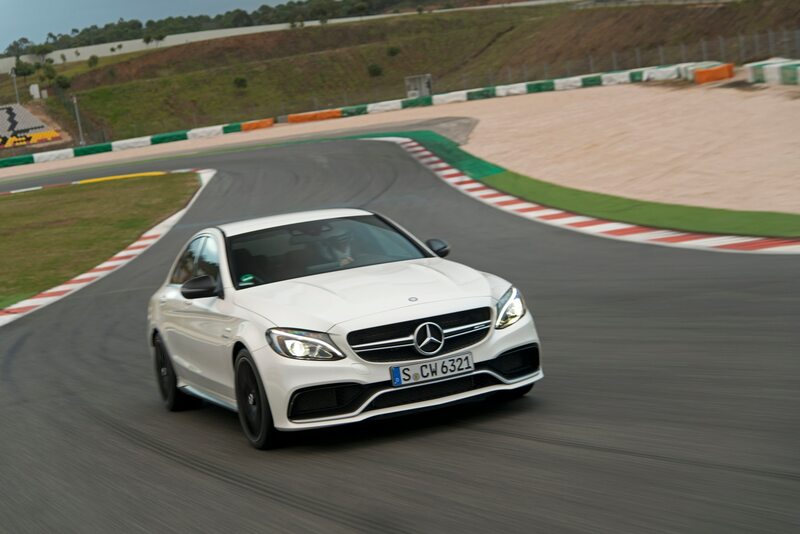 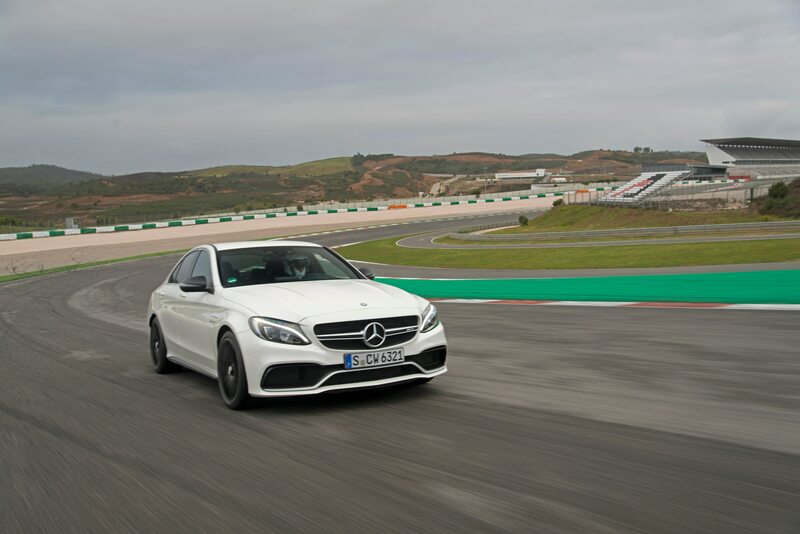 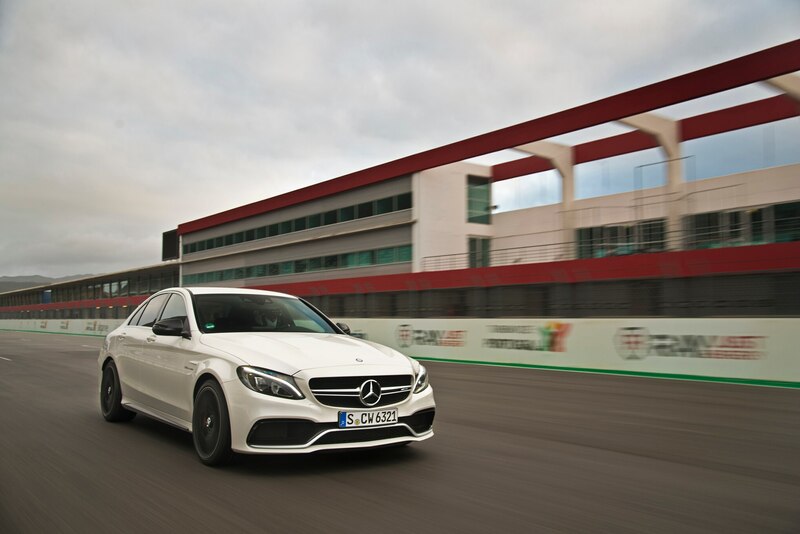 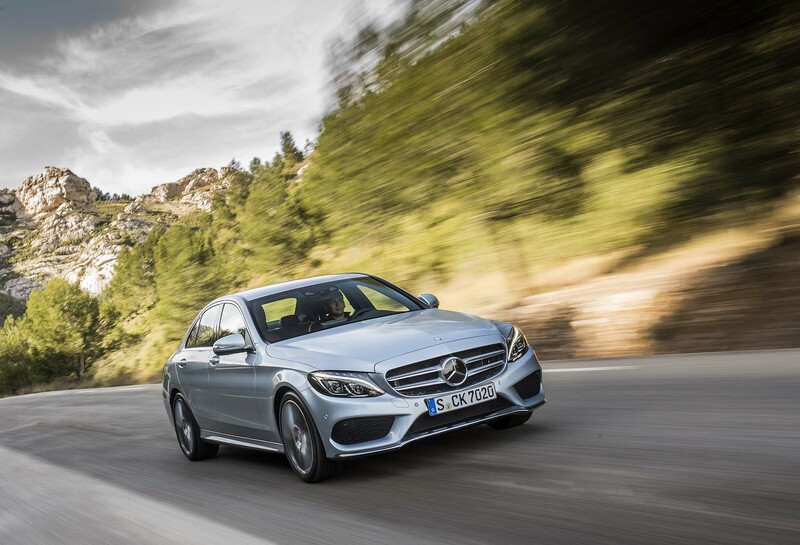 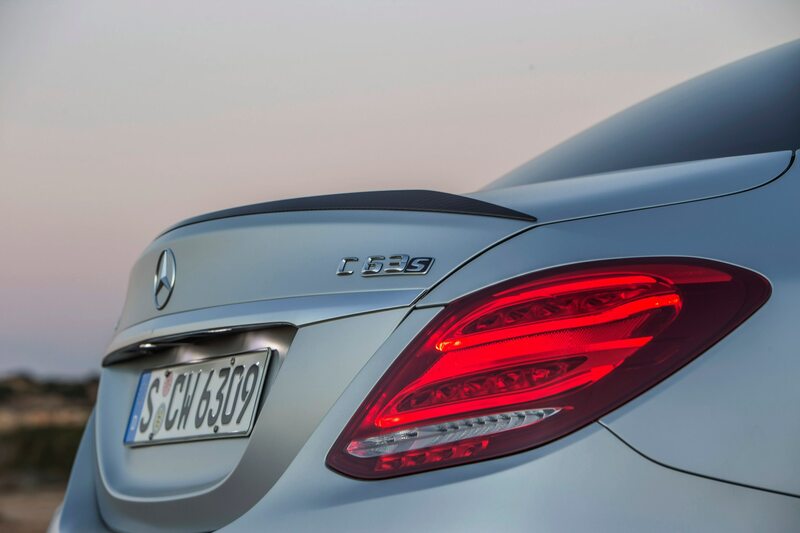 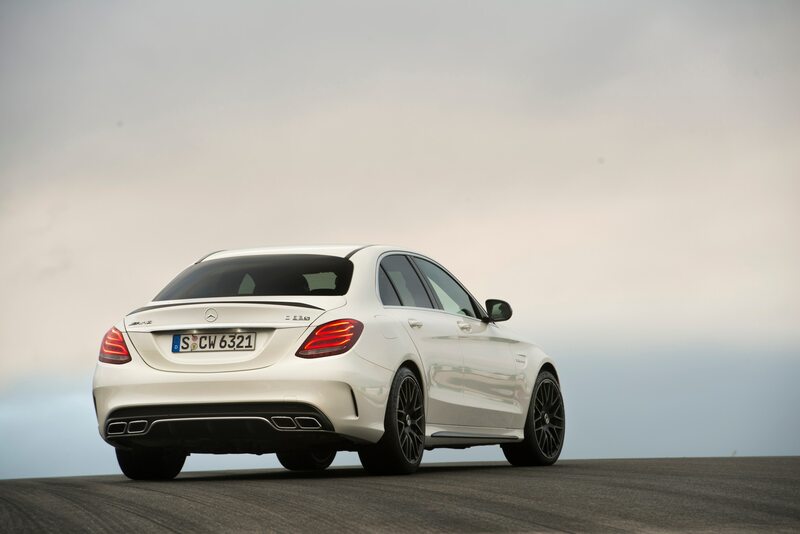 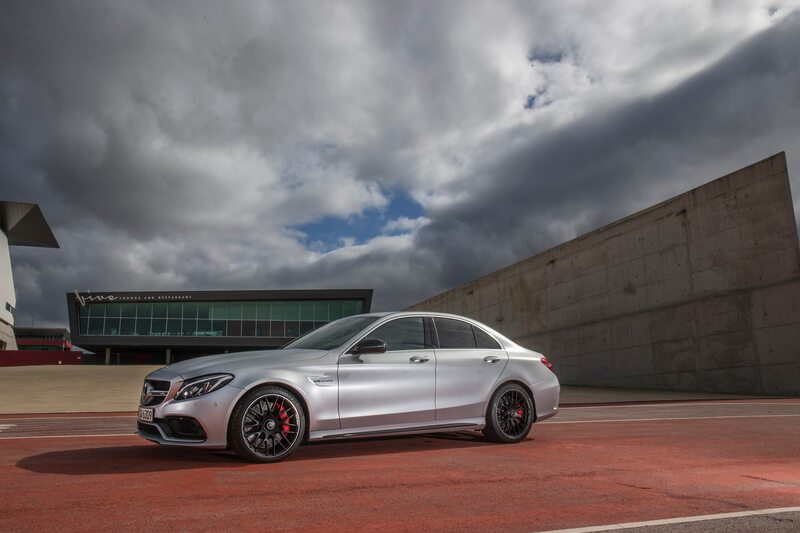 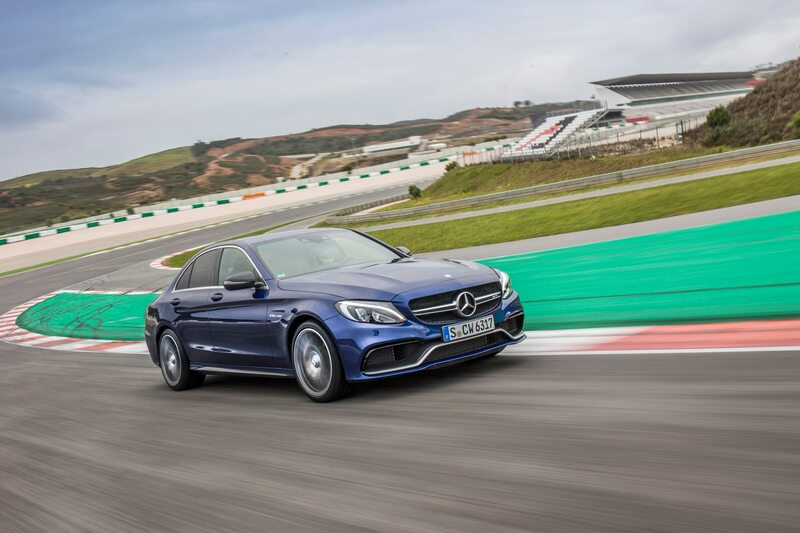 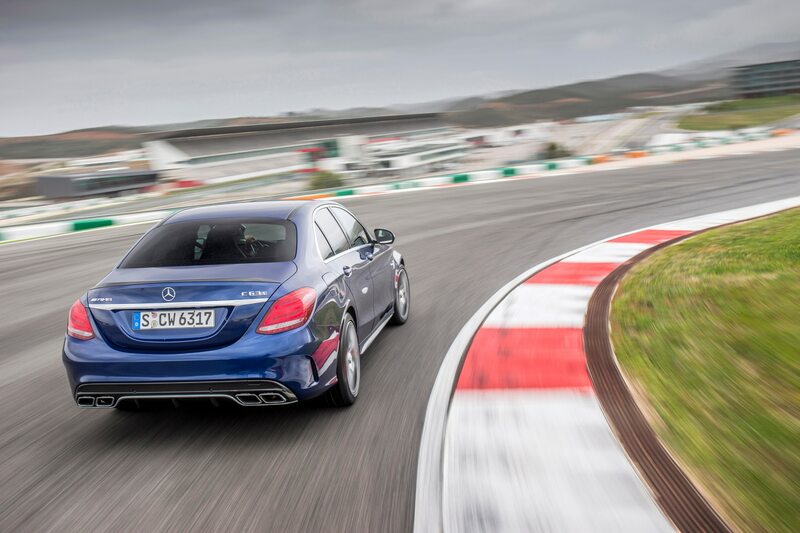 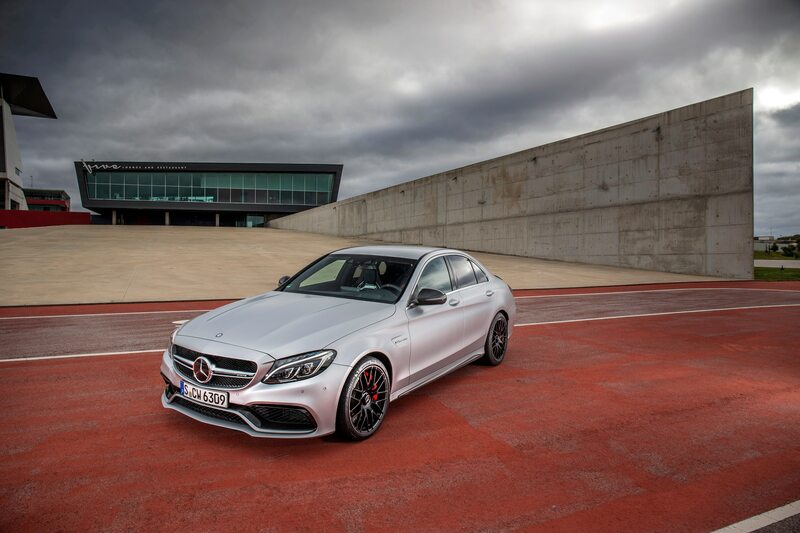 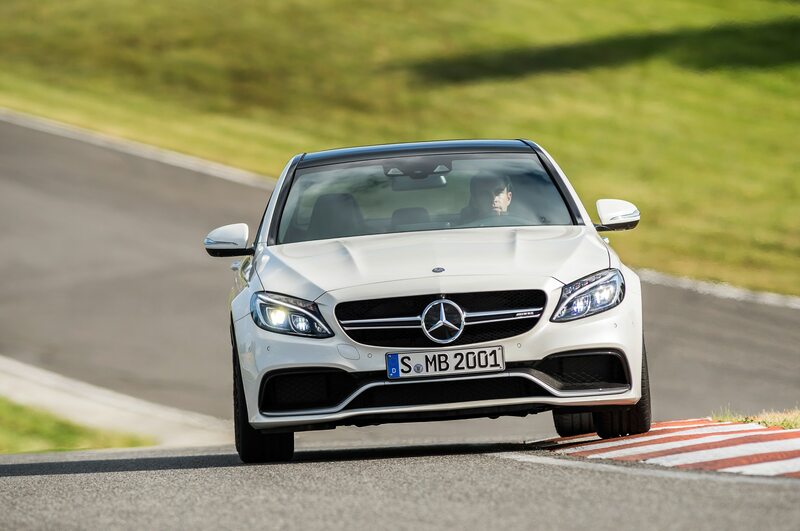 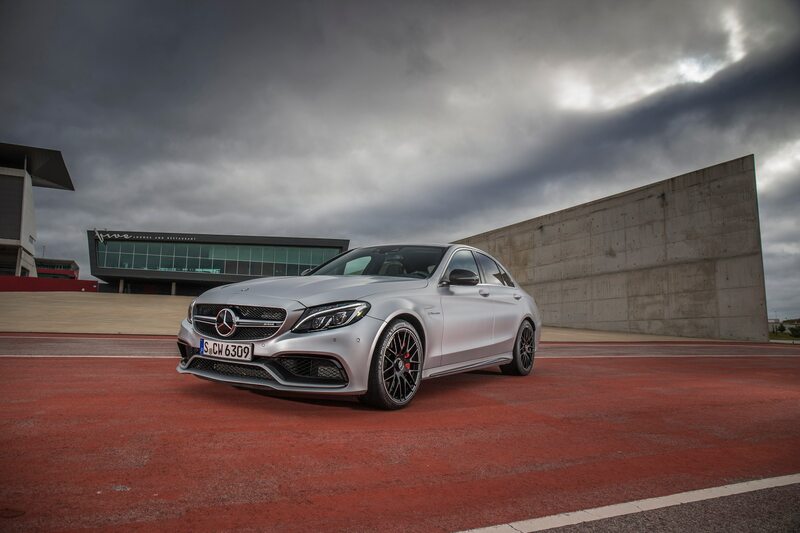 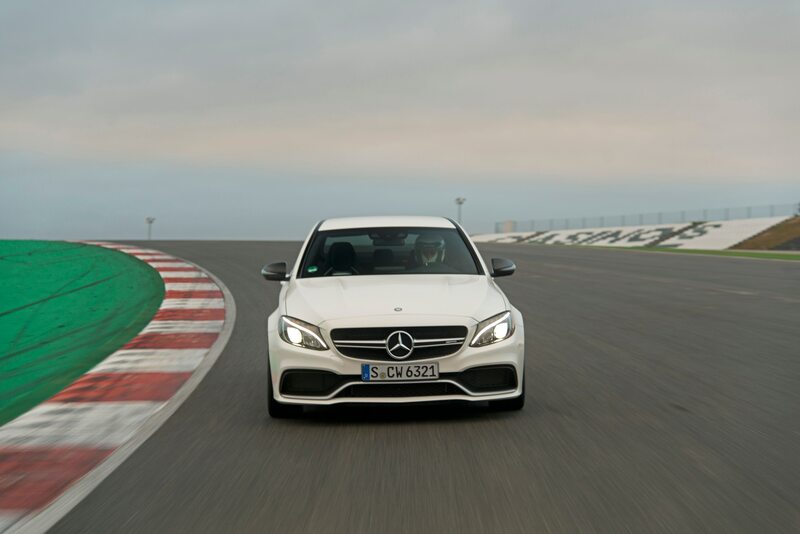 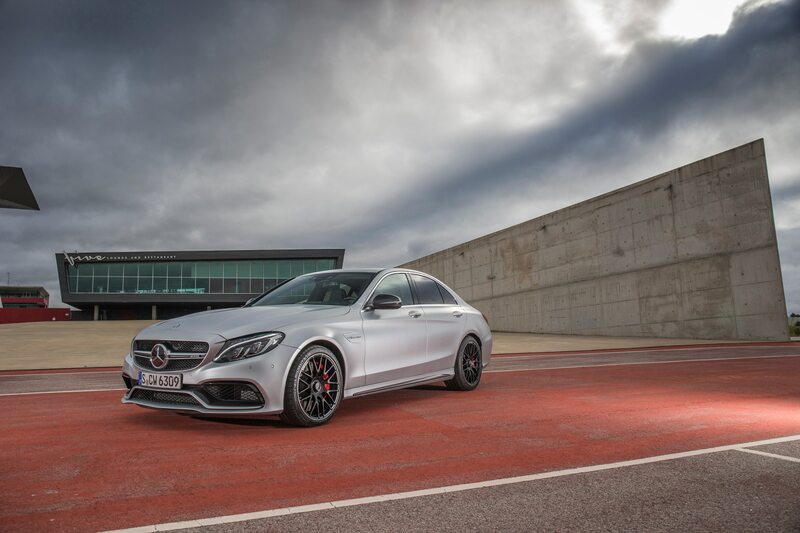 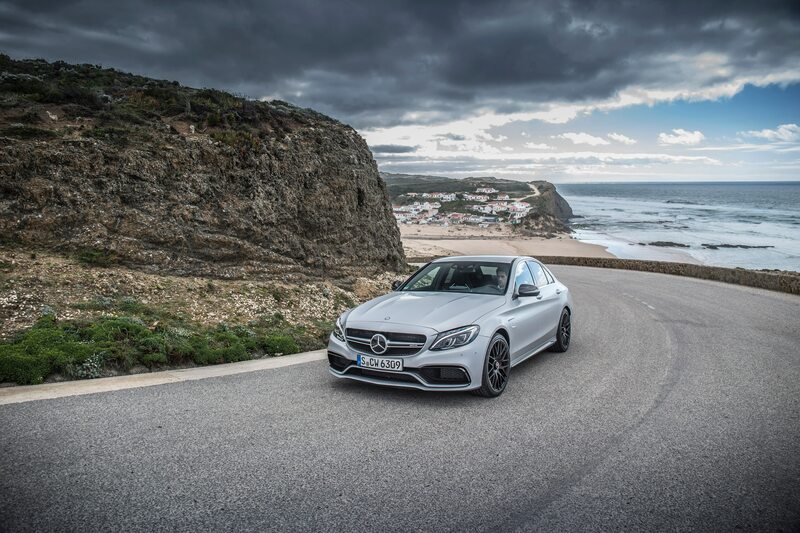 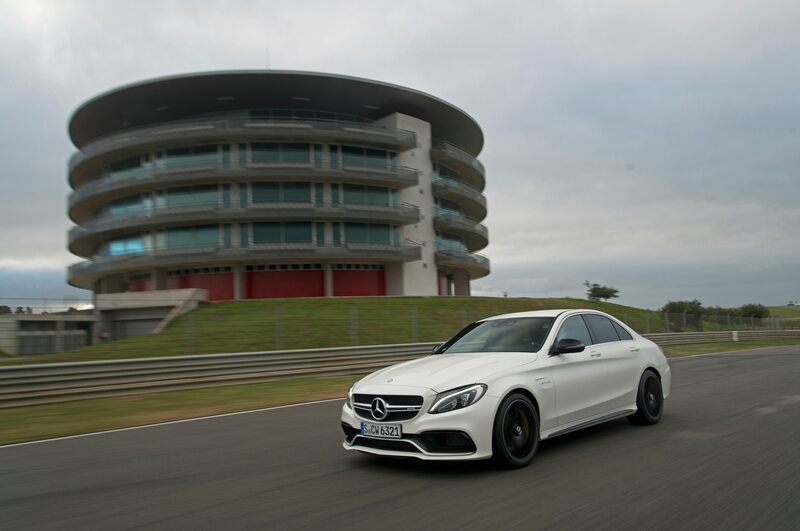 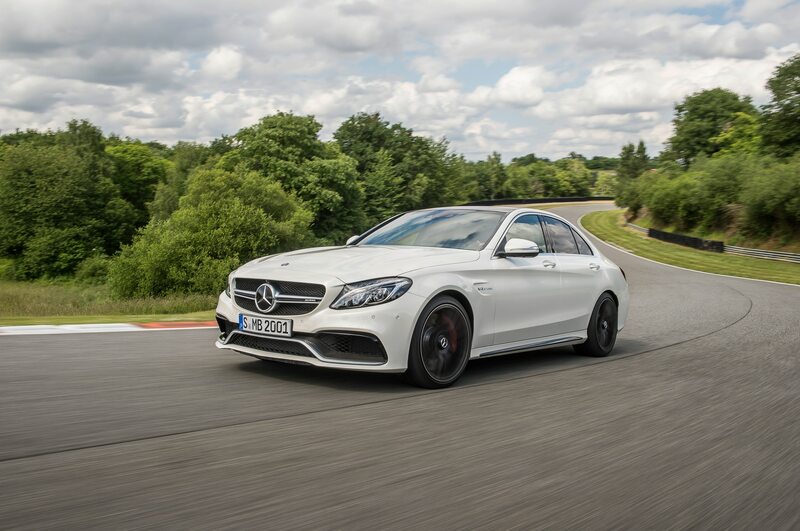 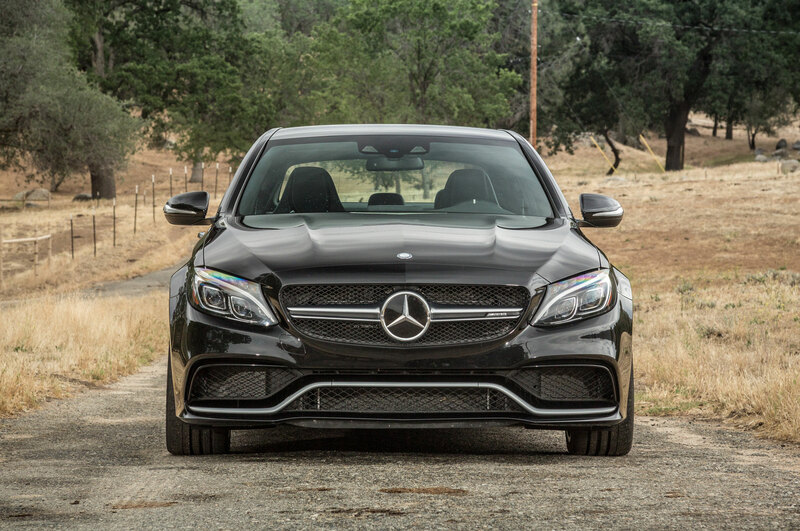 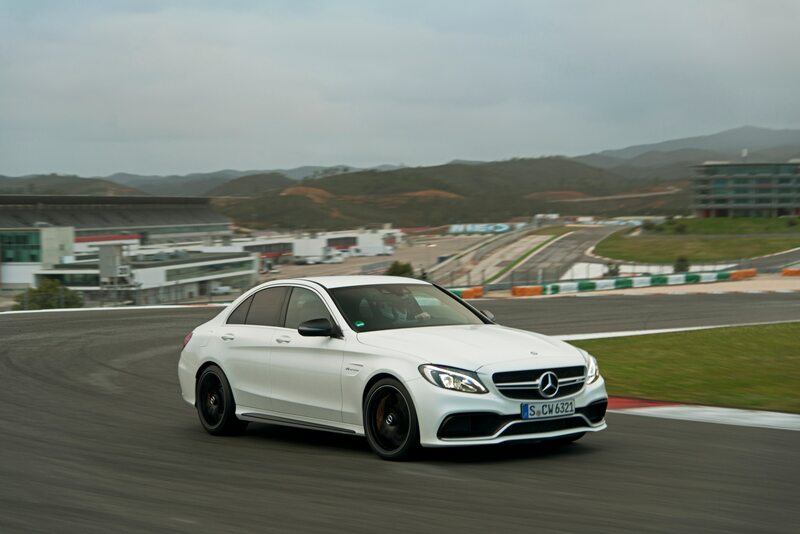 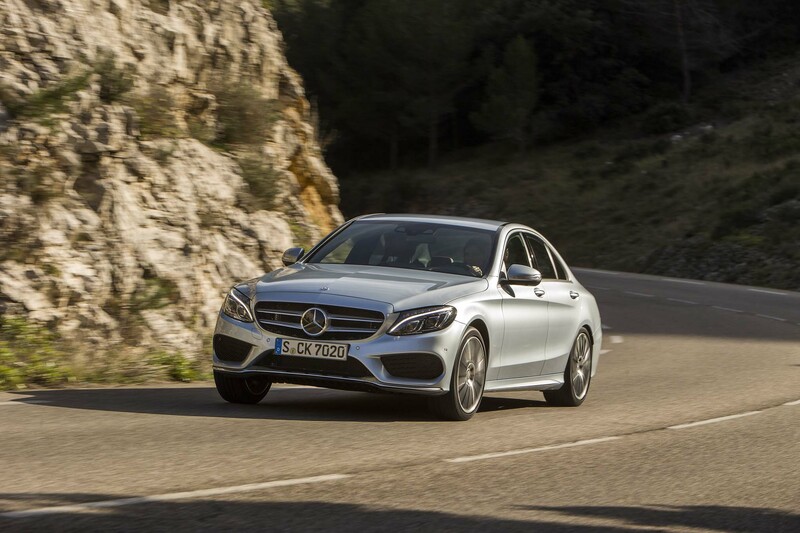 [We didn’t get to sample the C300 4Matic for our first review.] 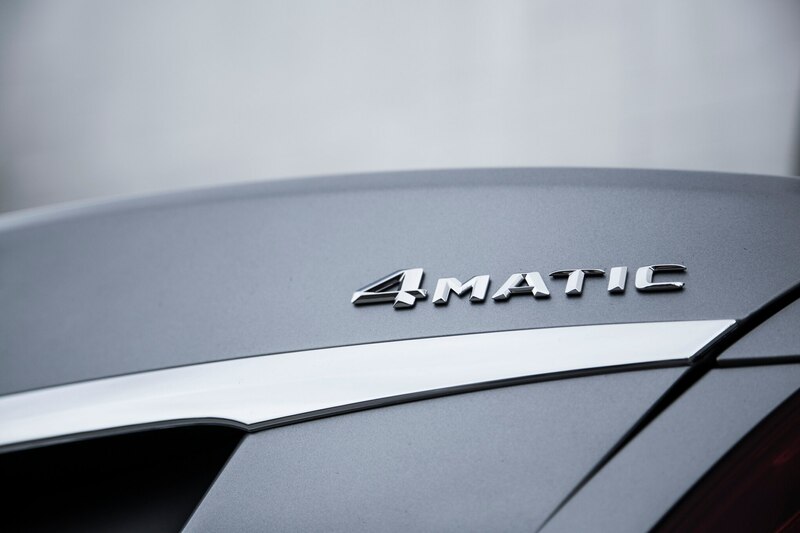 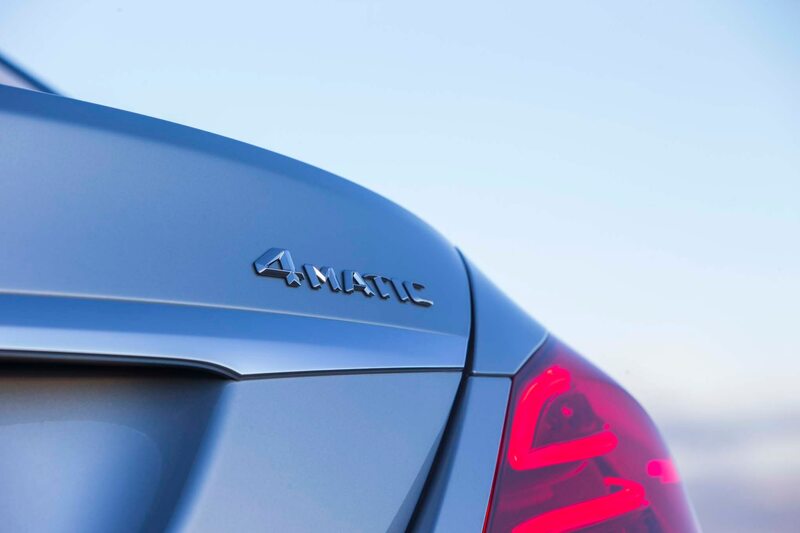 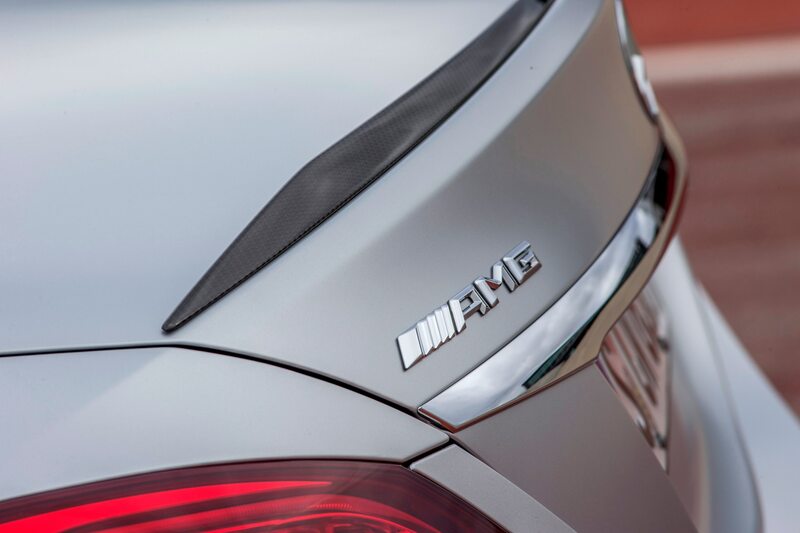 Launching with 4Matic all-wheel drive late this summer will help juice sales in Northern states. 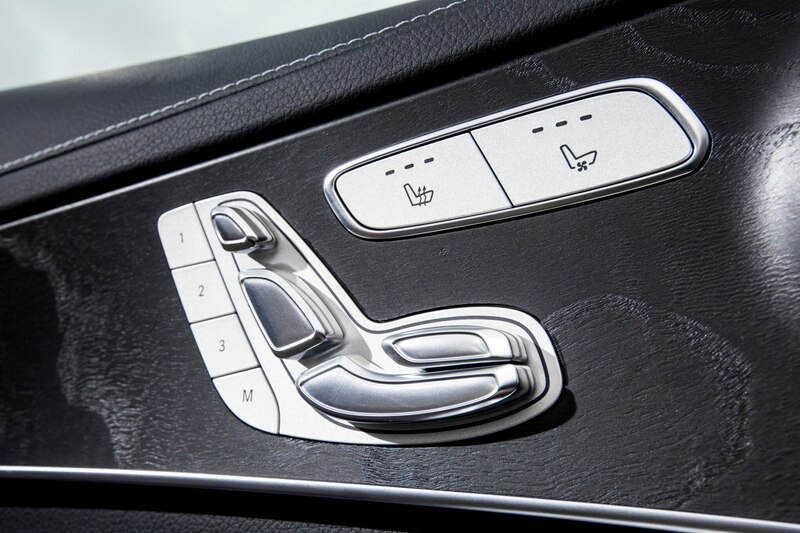 Mercedes’ newly renamed driving-mode switch, Agility Select, offers a choice of lazy Eco, the Comfort default, the fun Sport and overly aggressive Sport+, as well as the fully adjustable Individual. 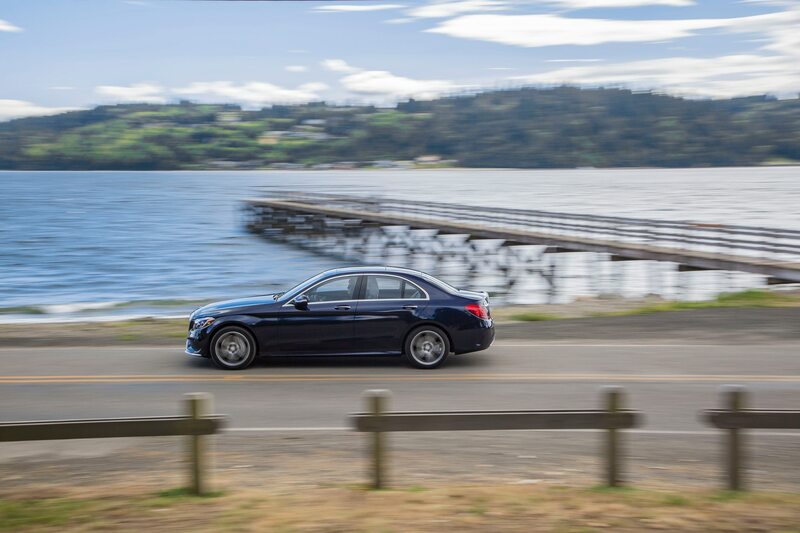 You can feel a marked difference between the settings, with Comfort ideal about 80 percent of the time and Sport useful for the other 20 percent, adding enough extra steering weight to engage drivers without making steering a chore. 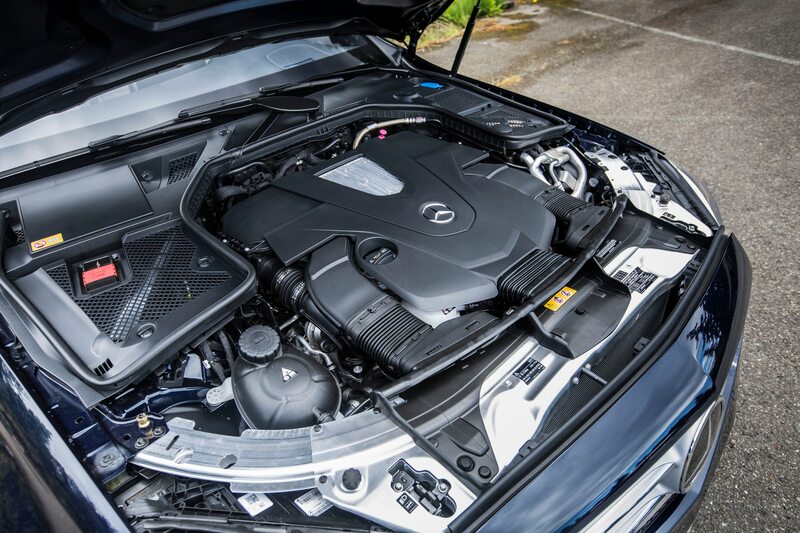 Eco’s dull throttle response feels like a 50-hp cut in the engine’s performance; diehard eco-warriors should wait for the C-Class diesel and plug-in hybrid models promised within a couple of years. 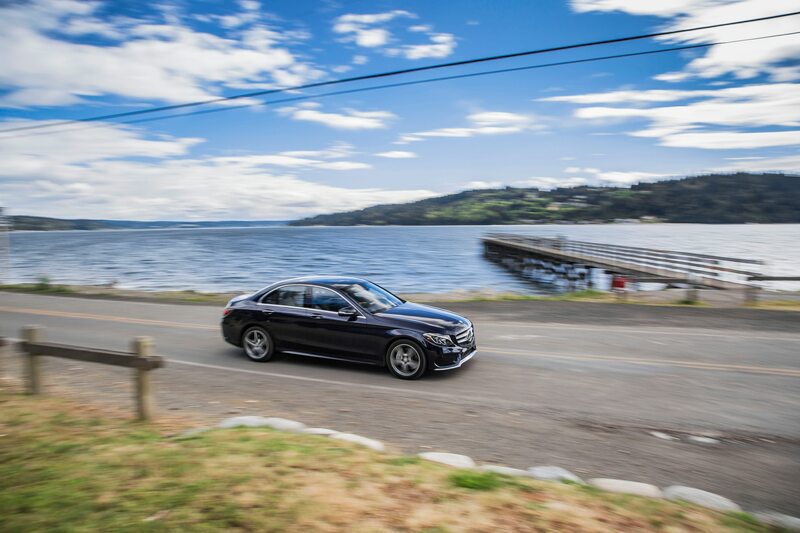 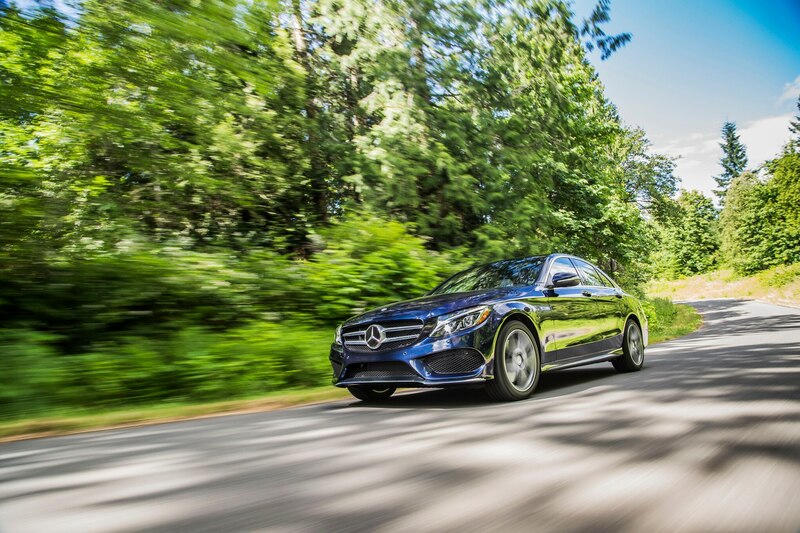 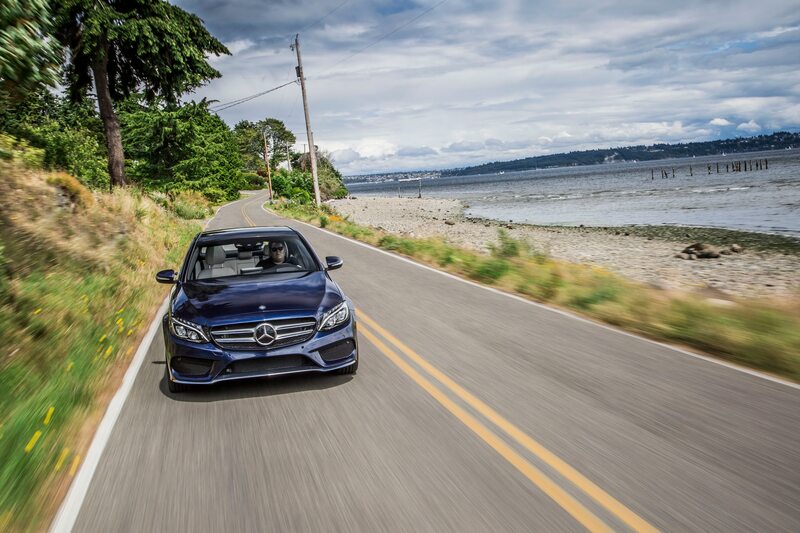 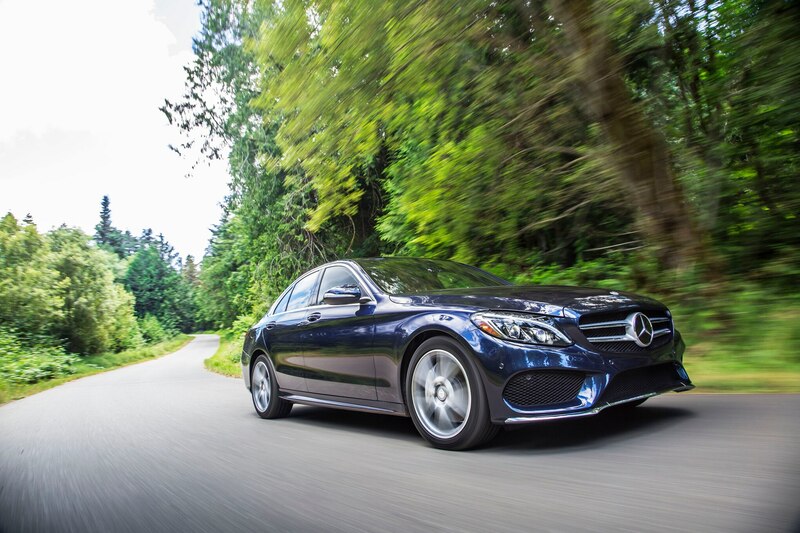 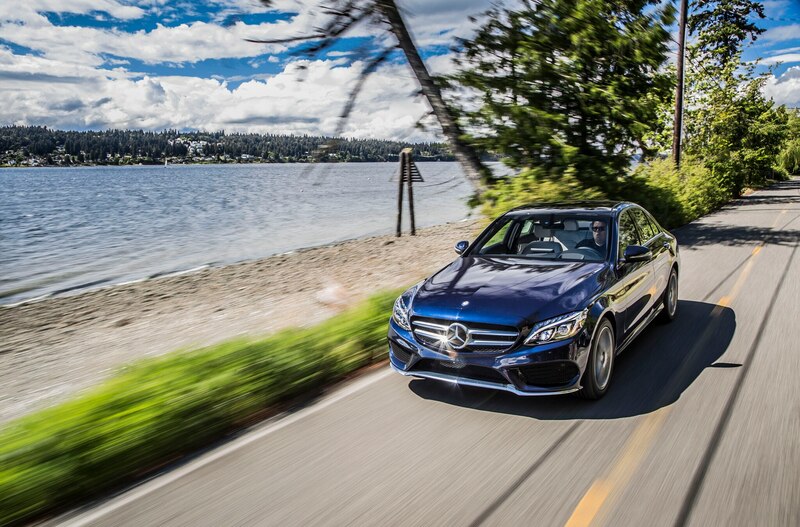 The C300 4Matic never puts a foot wrong on the twisting, hilly roads outside Tacoma. 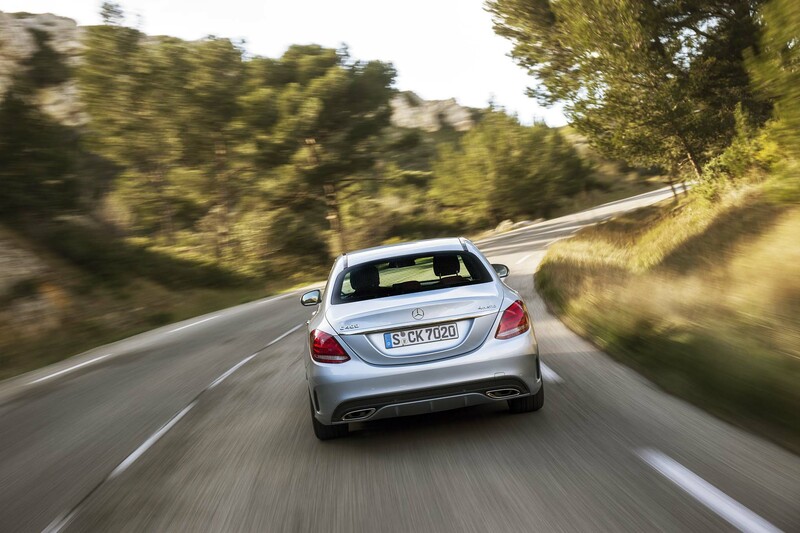 Variable ratio steering provides excellent freeway stability, but turns in quickly on the switchbacks. 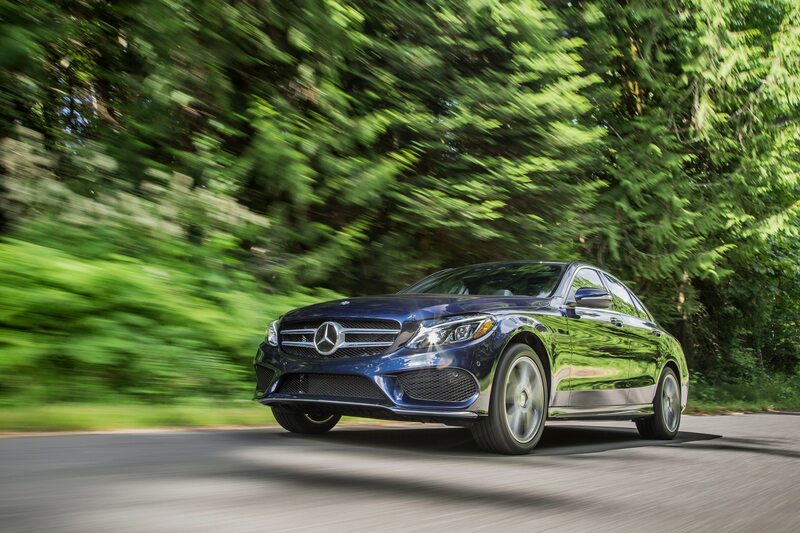 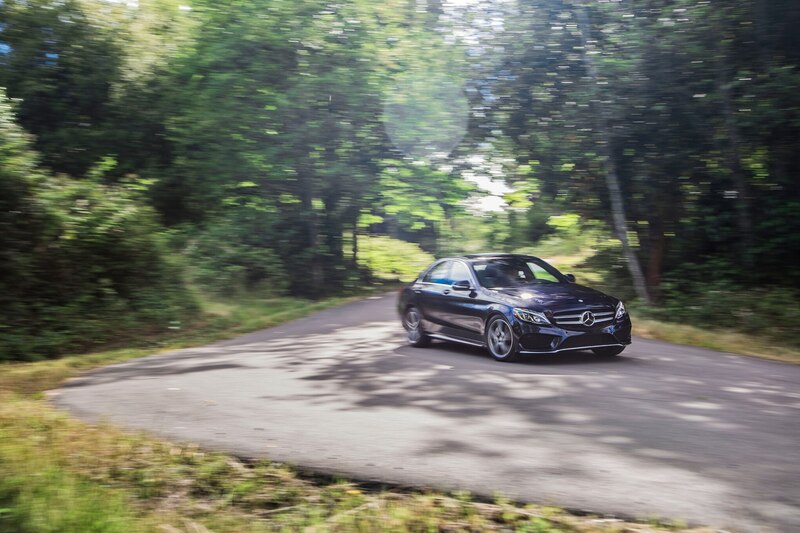 It may not win awards for its feedback, but the C-Class’ electric power steering weights up in a natural, progressive manner that we wish more of its rivals could manage. BMW 3 Series, take note of how much we’re smiling. 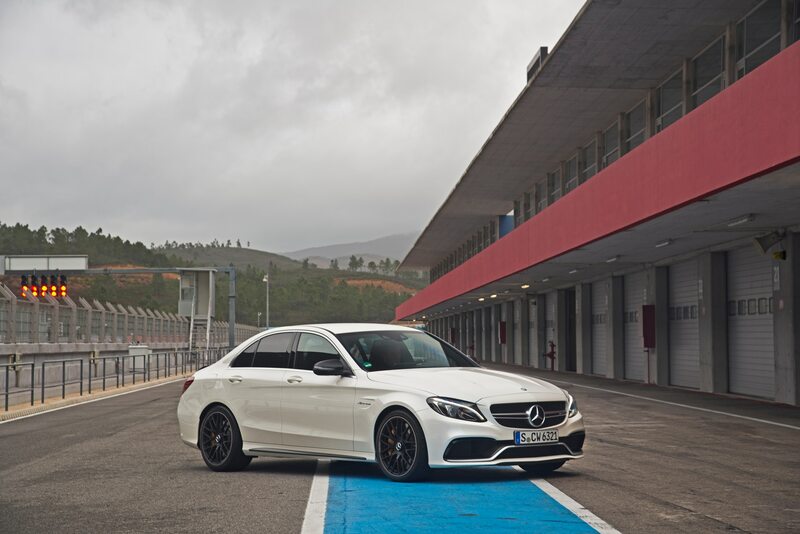 The chassis stays taut and settles through bends, the turbo-four dispenses a healthy chunk of torque to fire you down a straight, and progressive brake feel helps you scrub speed precisely before the next turn. 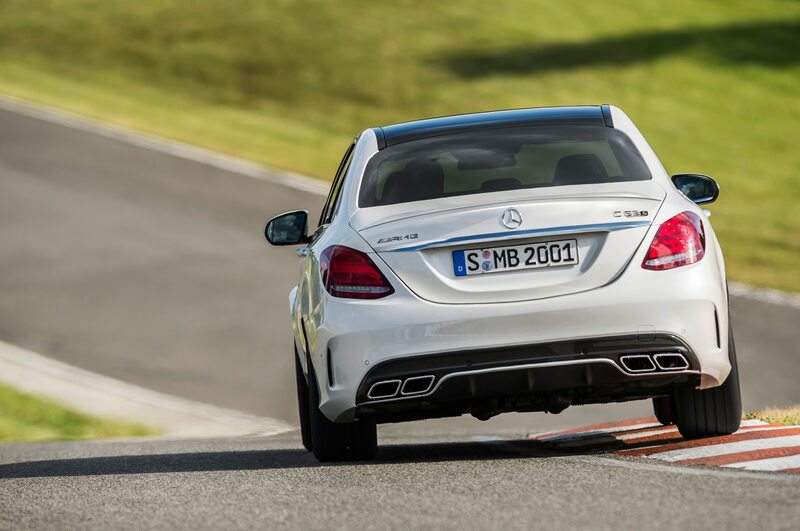 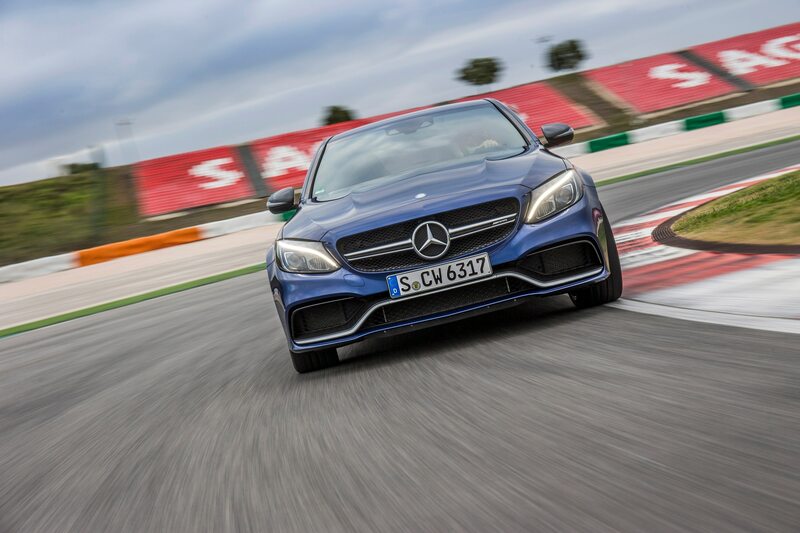 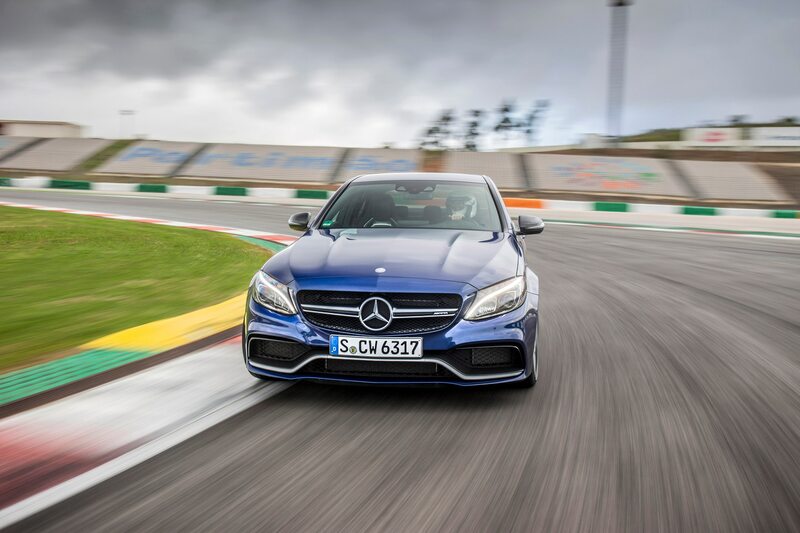 And yet, though the C-Class is supremely stable, whatever handling gains were won by cutting 200 pounds off the curb weight are negated by the car’s increased size. 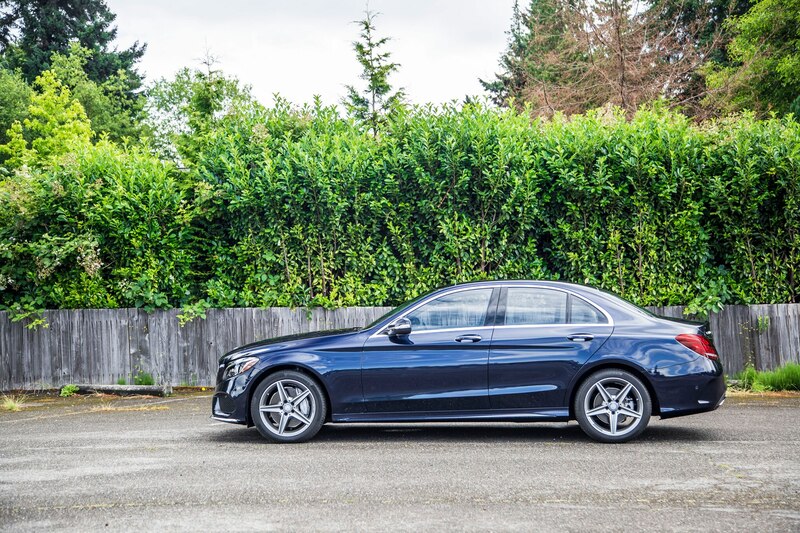 The C-Class is now nearly as wide as an E-Class, and that chastens us into dialing back our enthusiasm on narrow lanes and blind corners. 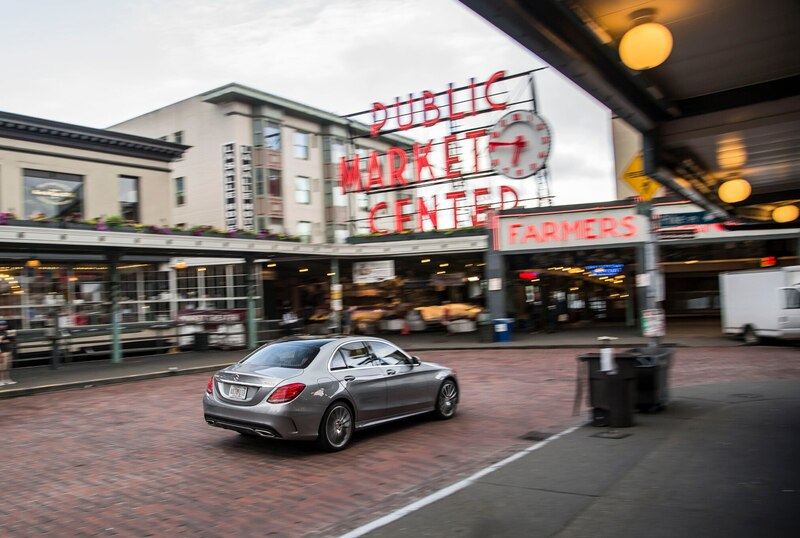 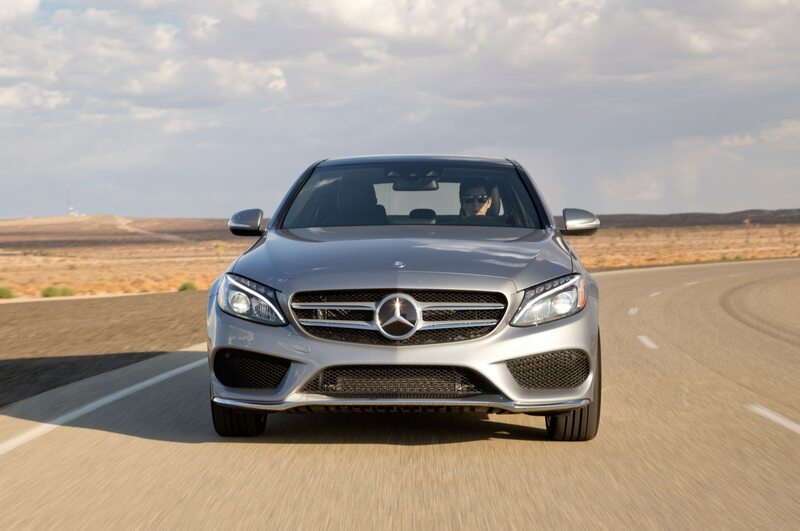 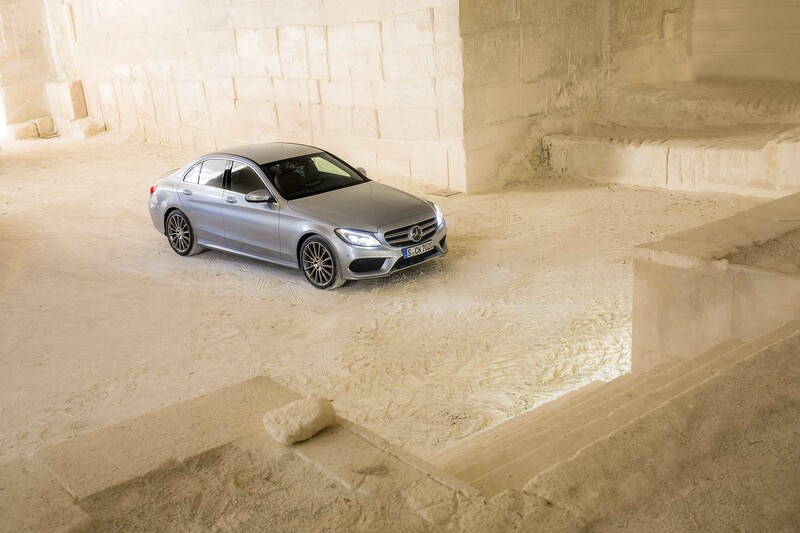 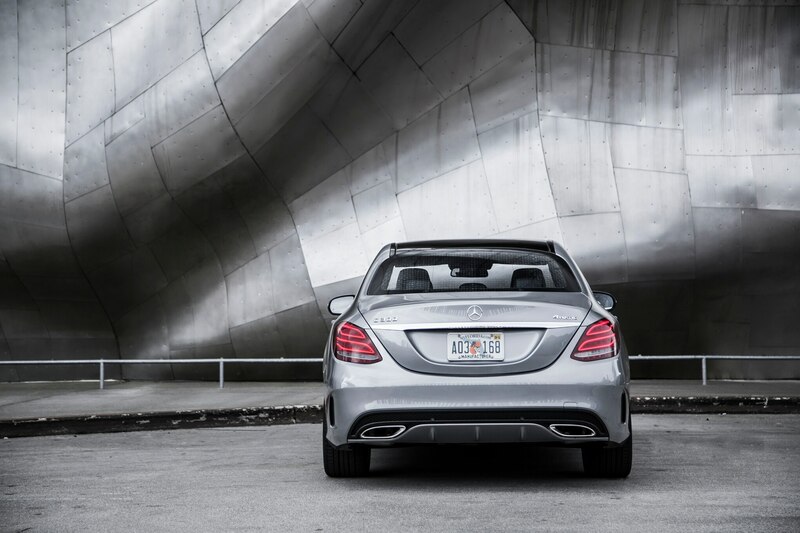 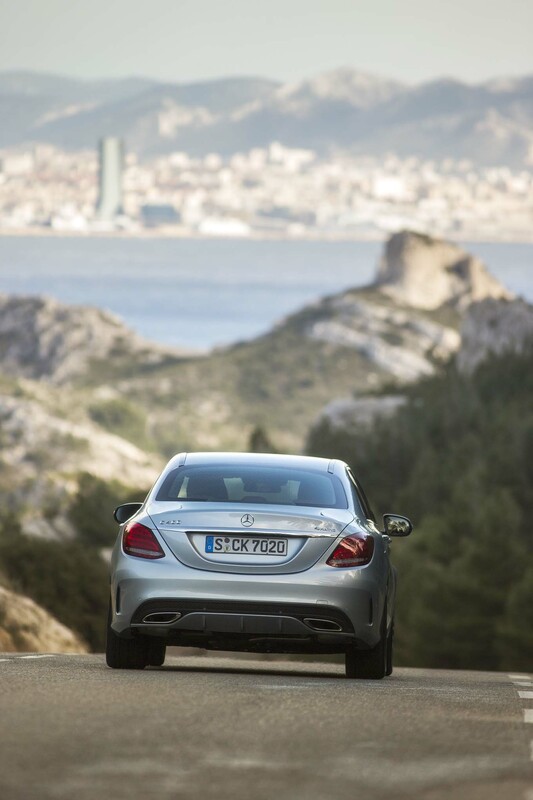 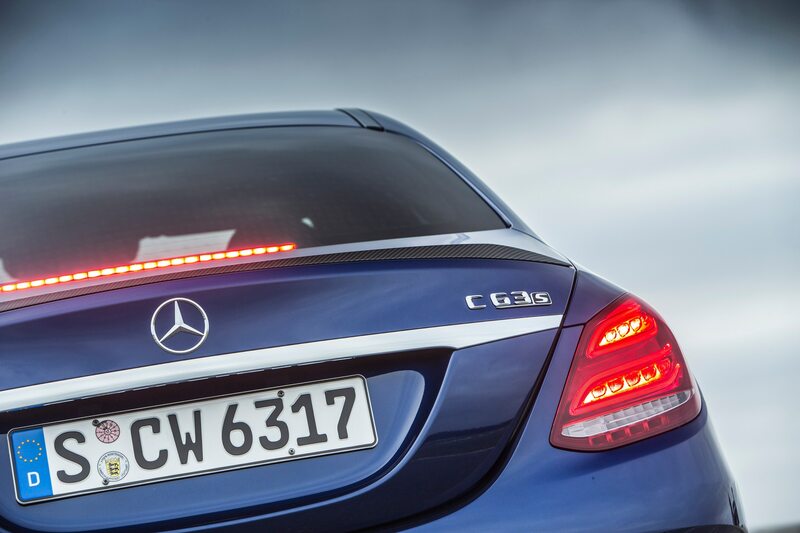 The C300 4Matic feels most at home on the highway. 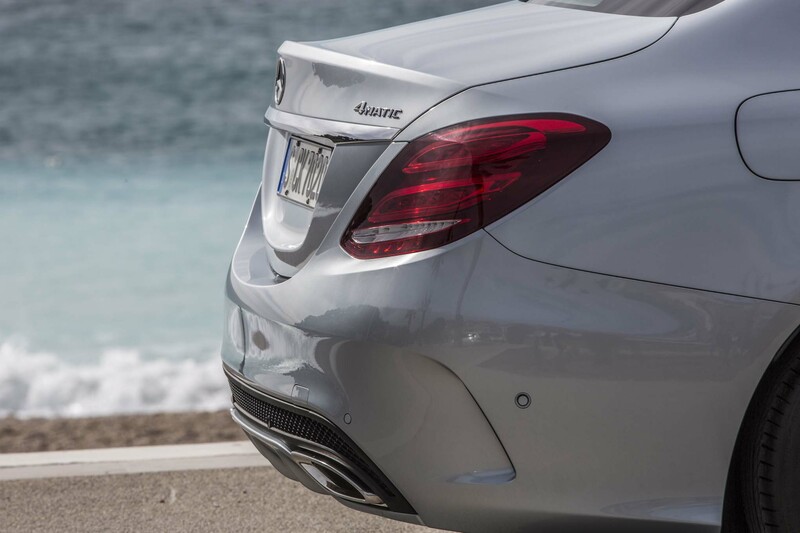 The engine settles into a low purr and the chassis has impeccable stability that makes the active lane-keeping system seem superfluous. 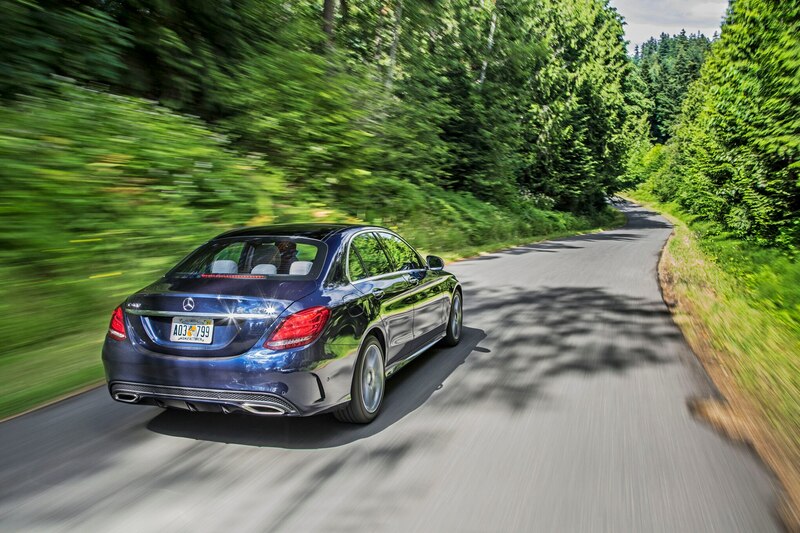 The car is barely stressed at Washington’s sleepy 60-mph speed limit, with practically no excess noise or jostling to speak of. 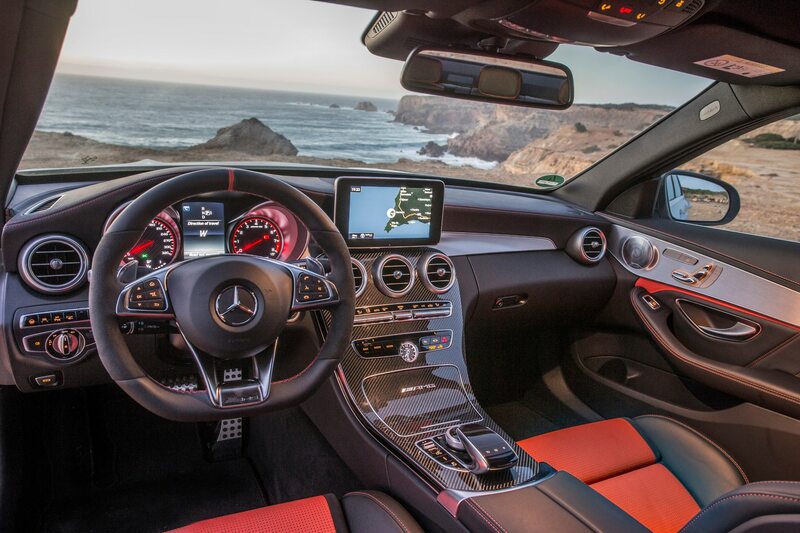 Devouring mile markers is relaxed and thoroughly uneventful. 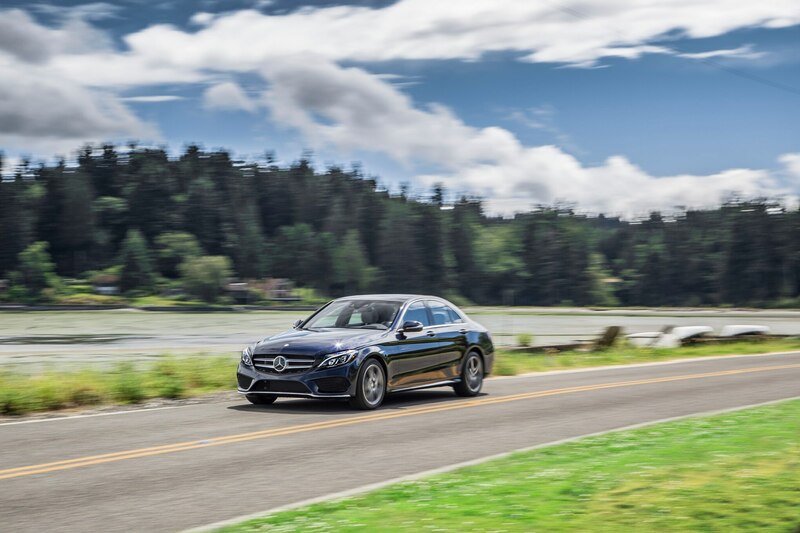 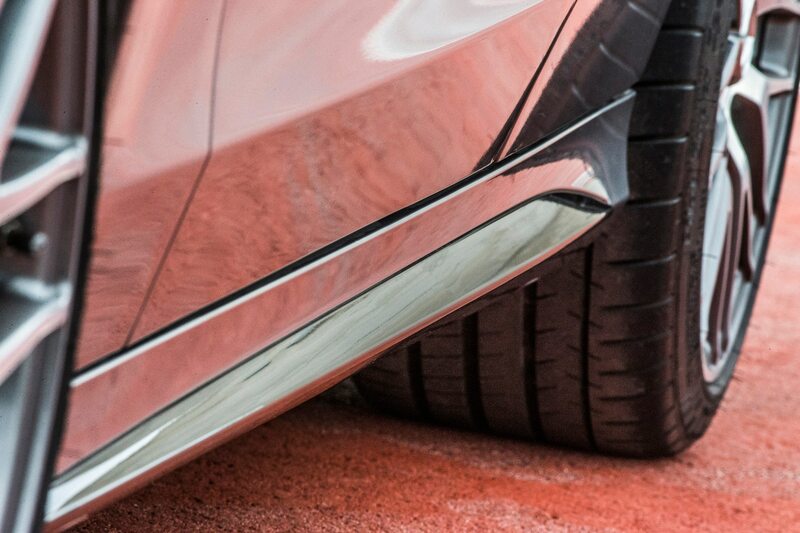 Excellent suspension damping quickly brings body motions under control after dips and crests, and the car hugs the road with enough suspension compliance to handle potholes and rough roads. 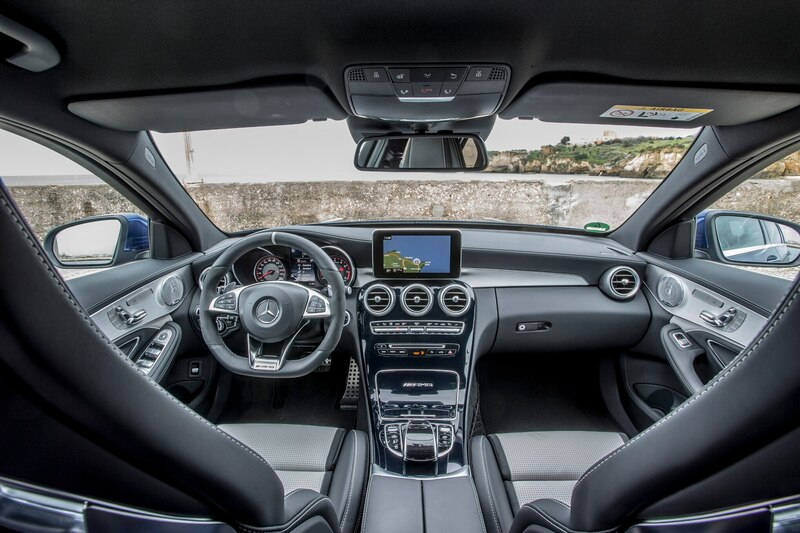 The ride-handling balance is just right. 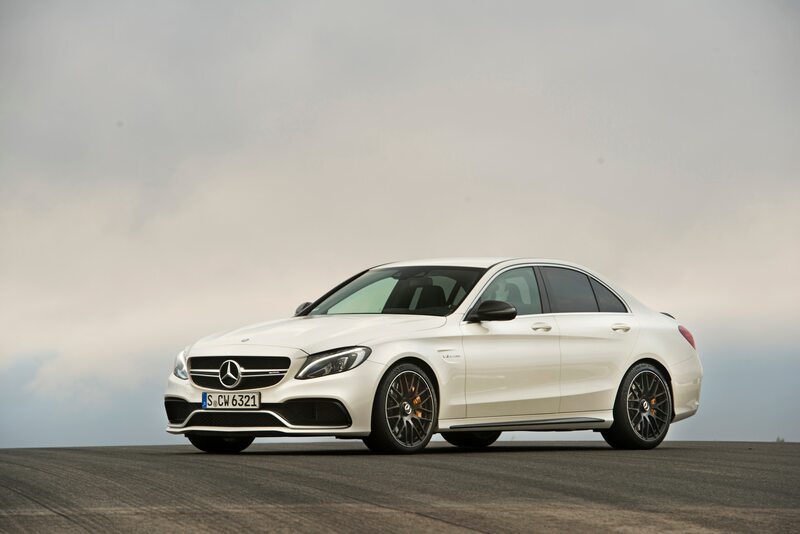 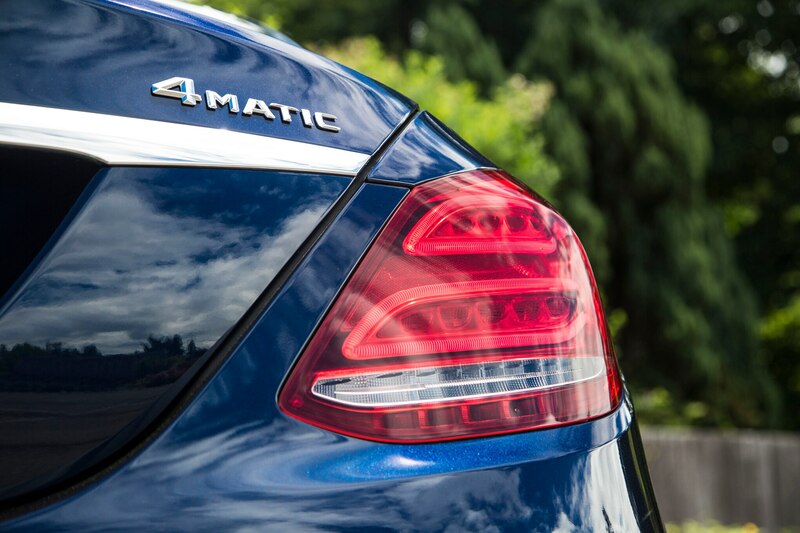 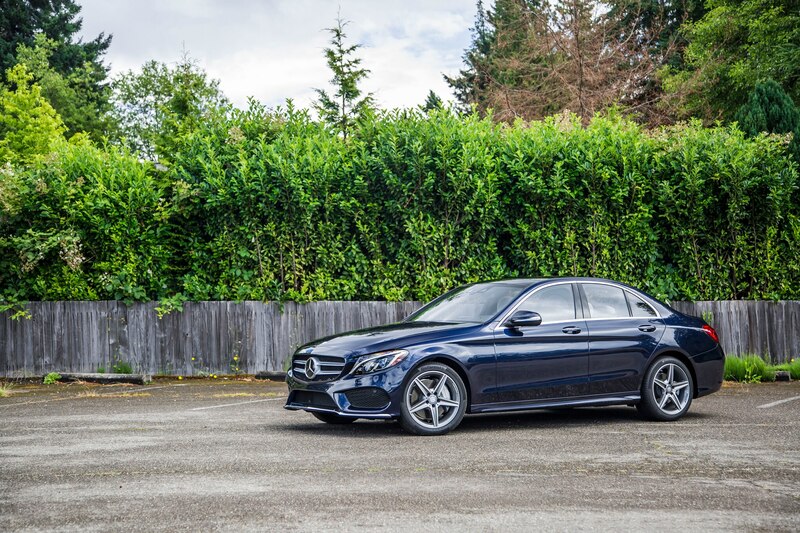 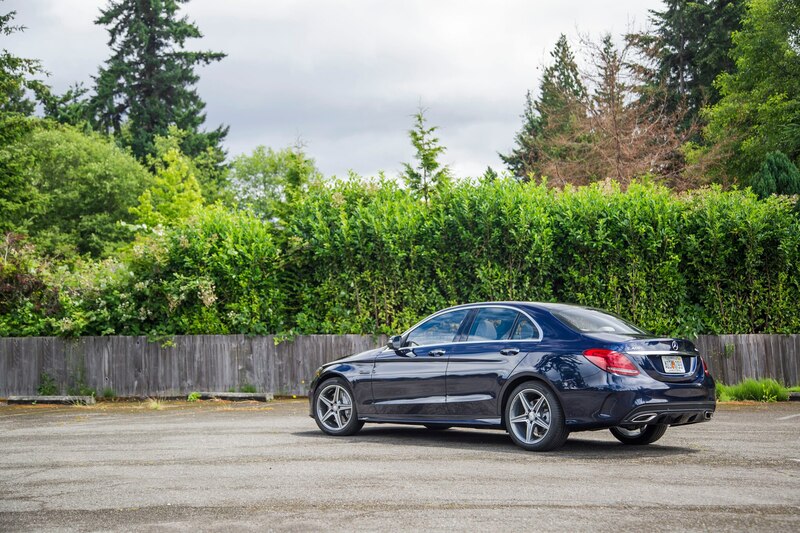 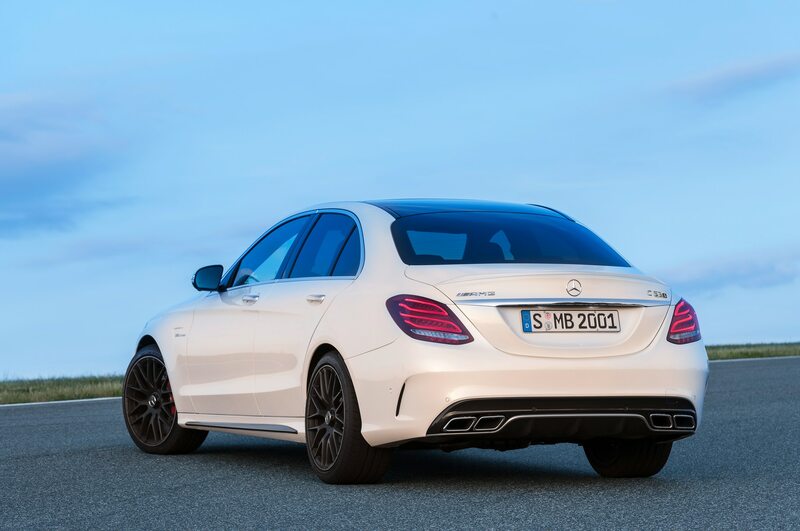 In comparison, the 2015 Mercedes-Benz C400 4Matic we drove was let down by its Airmatic suspension, an $1190 option. 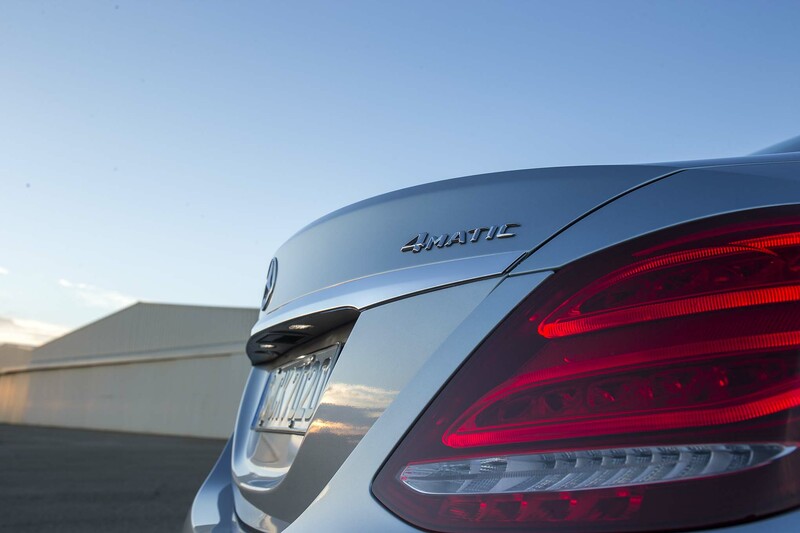 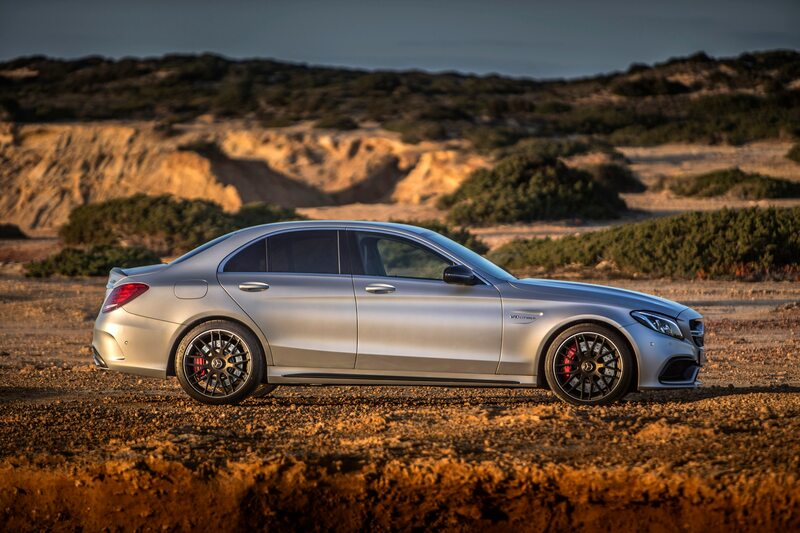 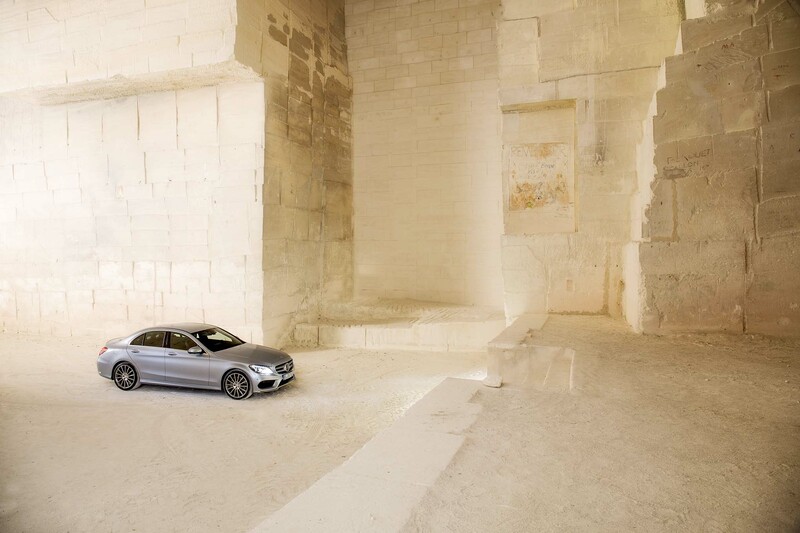 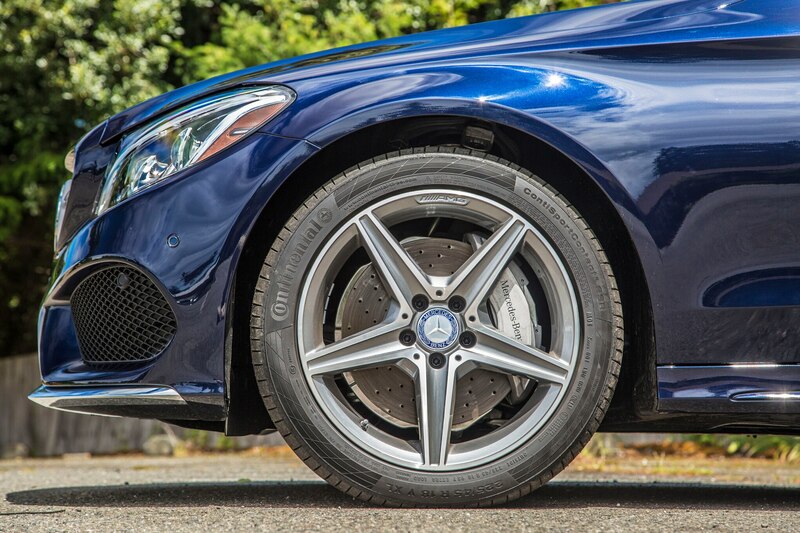 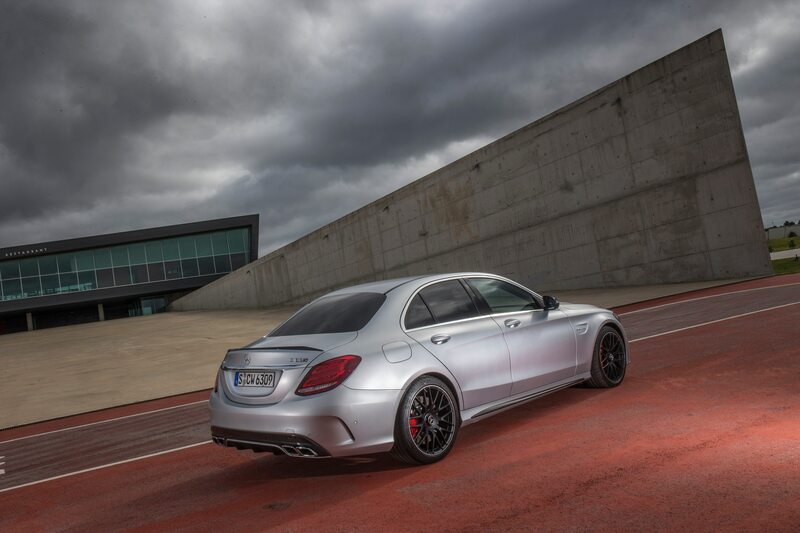 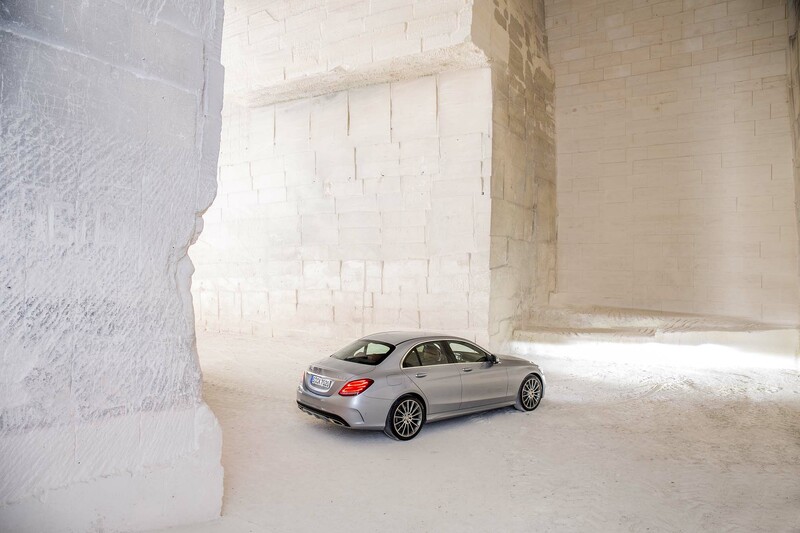 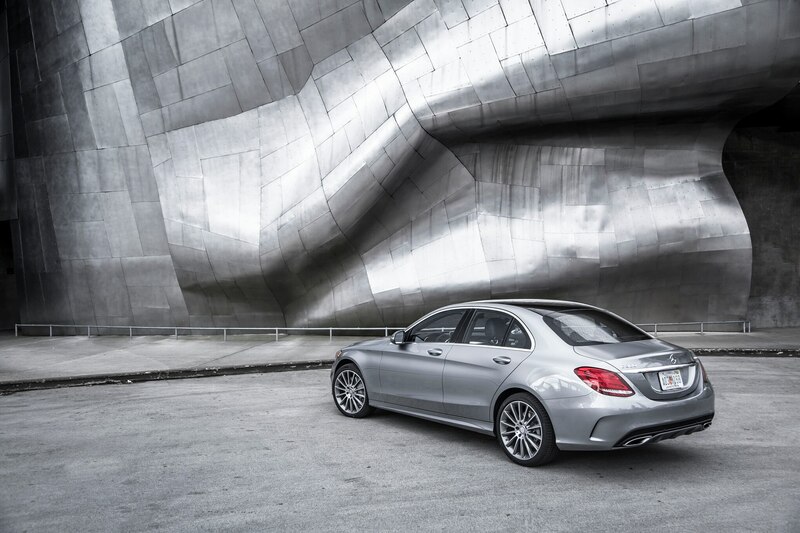 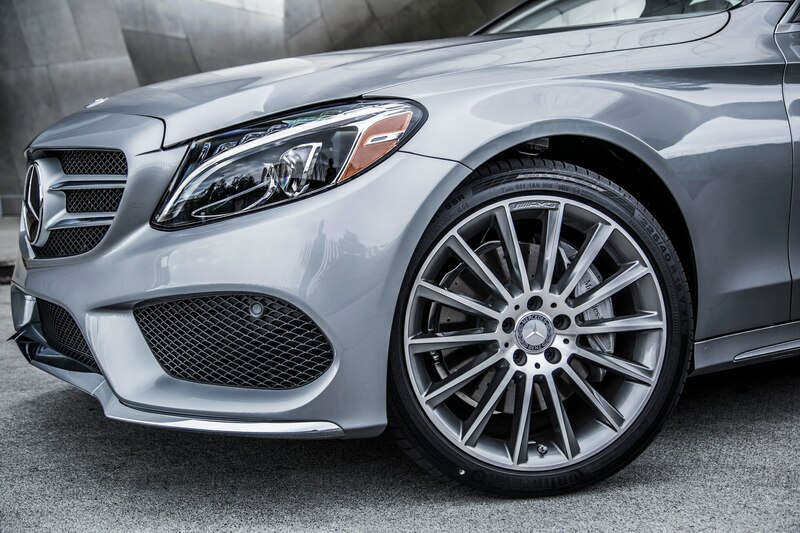 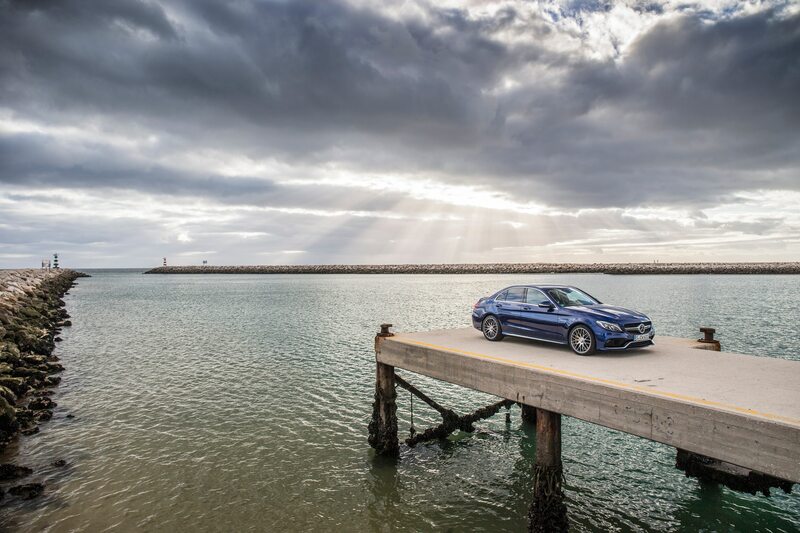 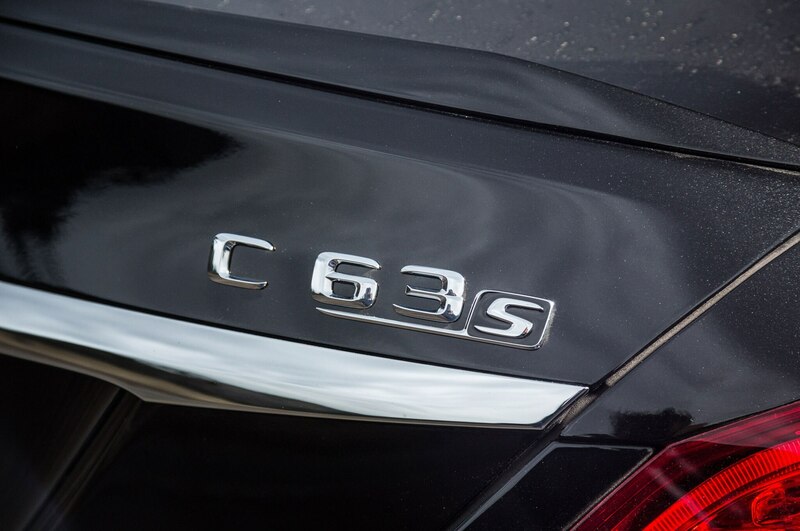 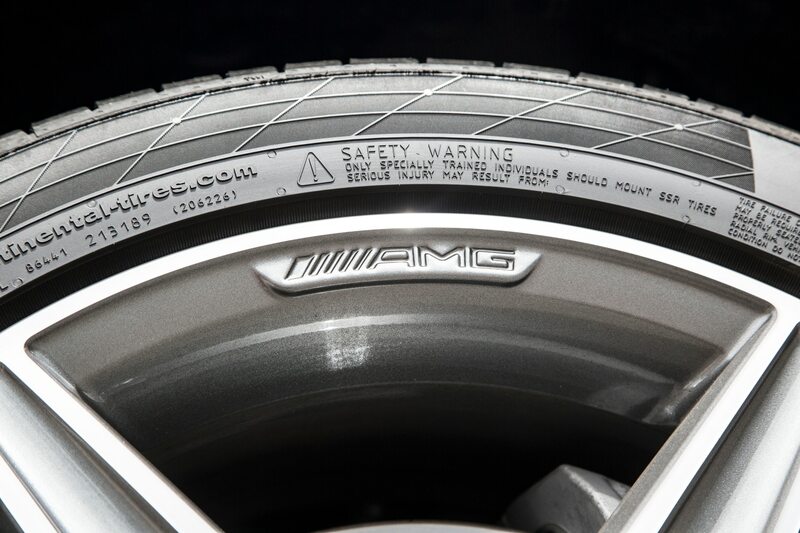 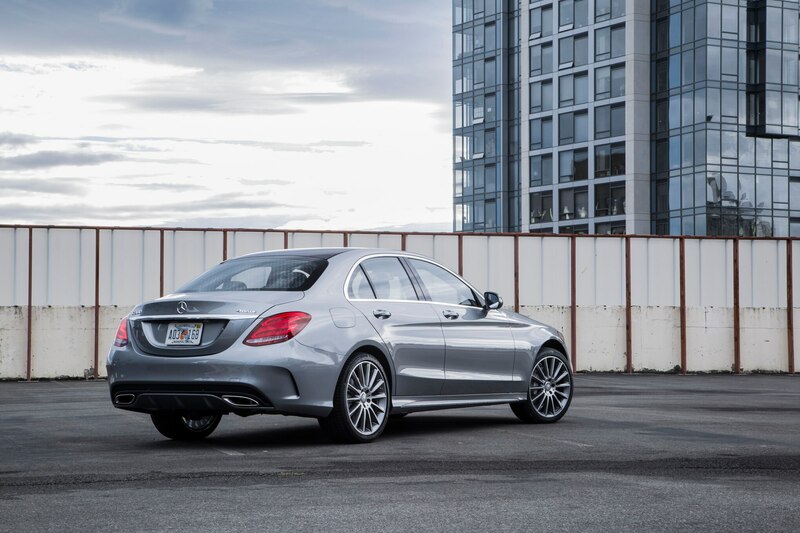 In Comfort, it floats and wallows far more than our steel-sprung C300 4Matic. 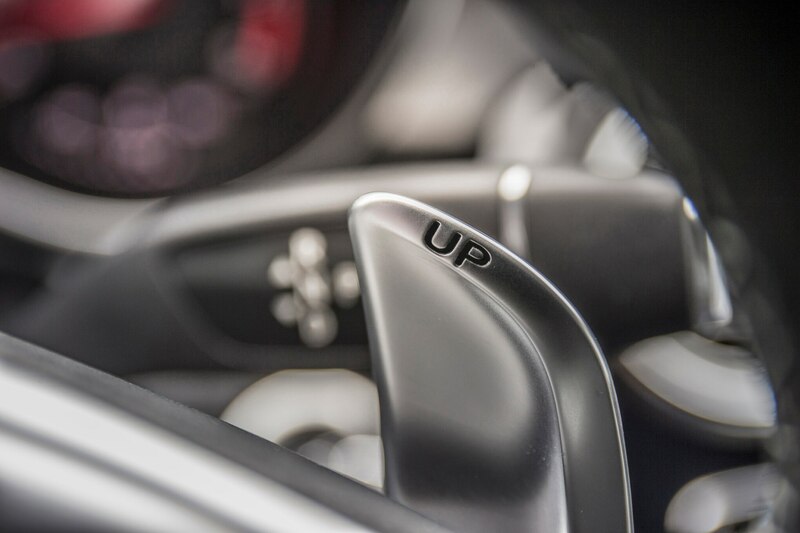 Move to Sport and the ride is just a tad too stiff, while Sport+ produces head bobbing. 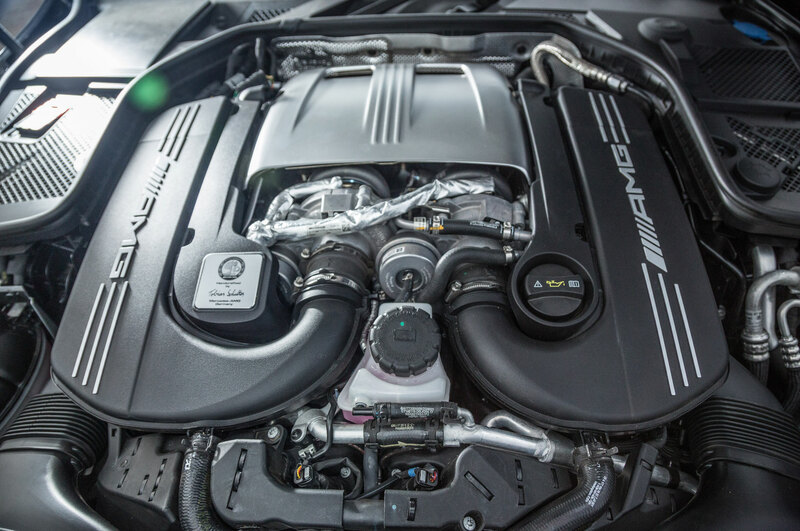 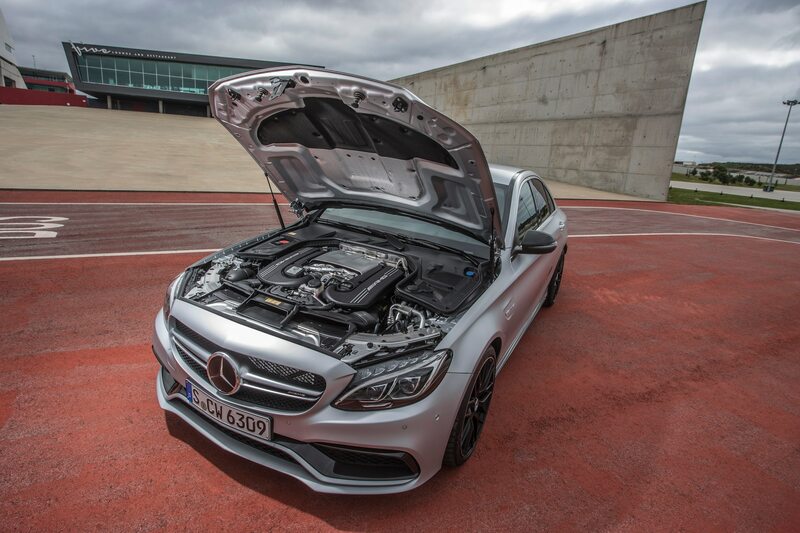 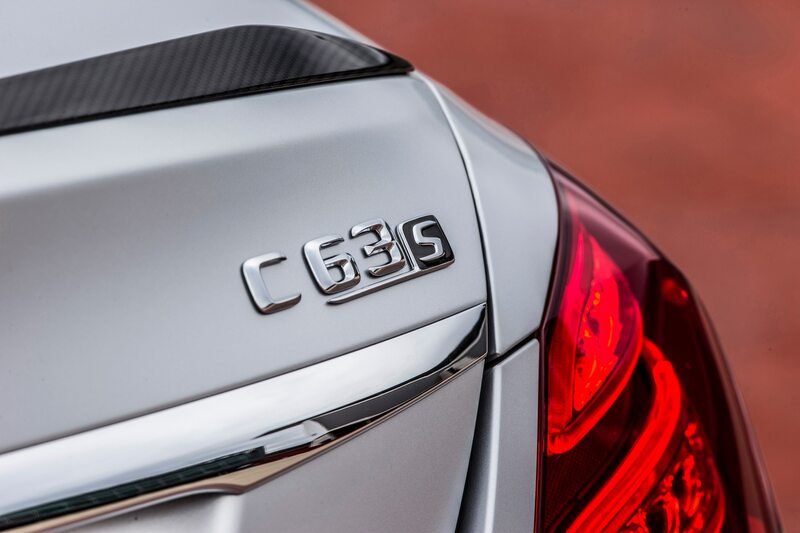 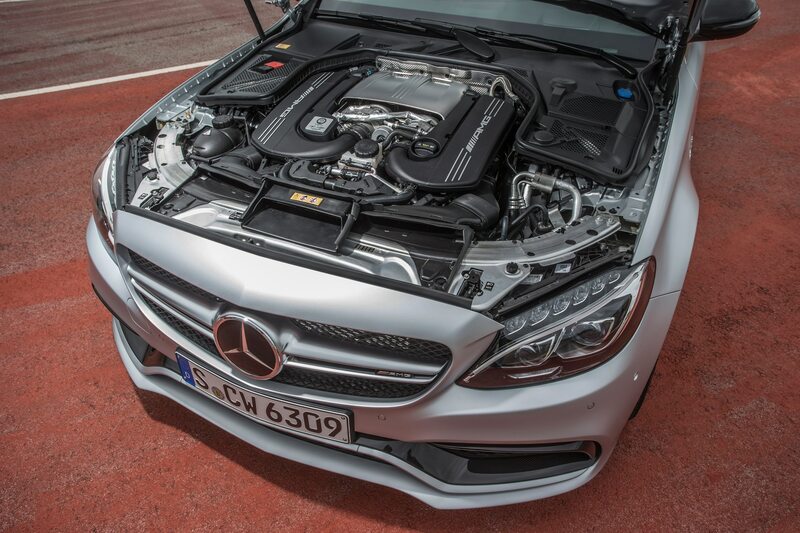 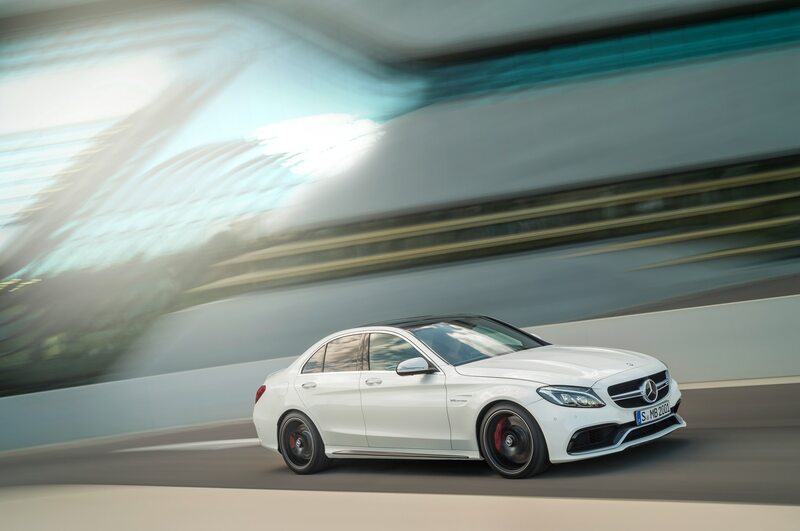 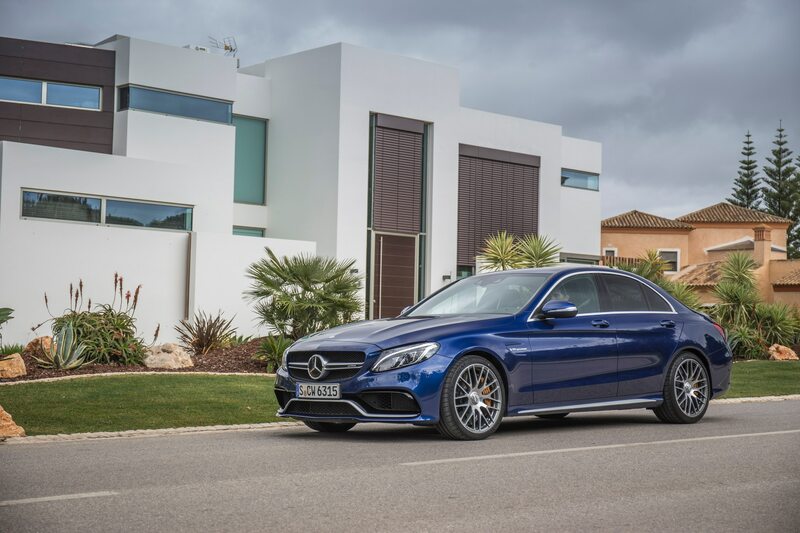 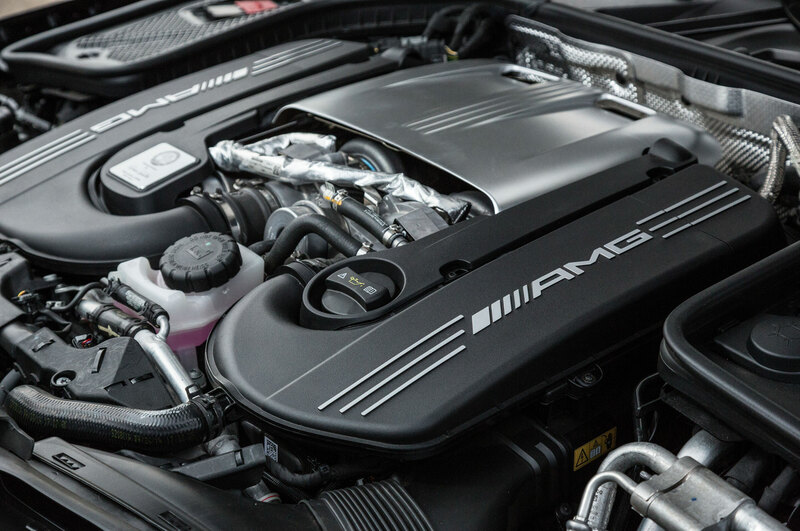 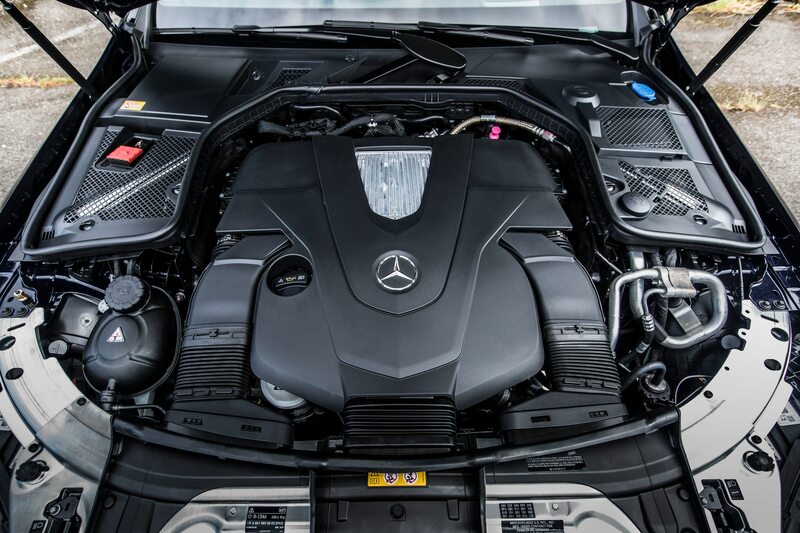 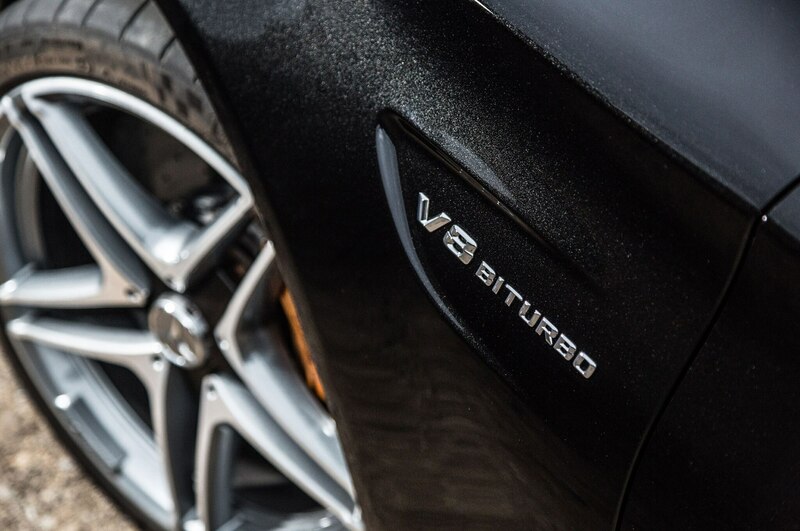 The C400’s 3.0-liter twin-turbo V-6 boasts an additional 88 hp and 81 lb-ft. (It also has more standard equipment than the C300.) 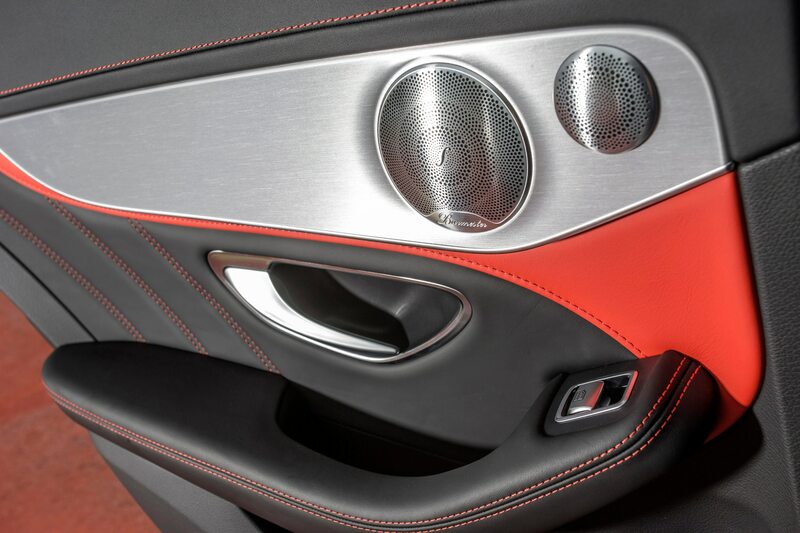 Anyone expecting more vocals from the upgrade mill will be disappointed. 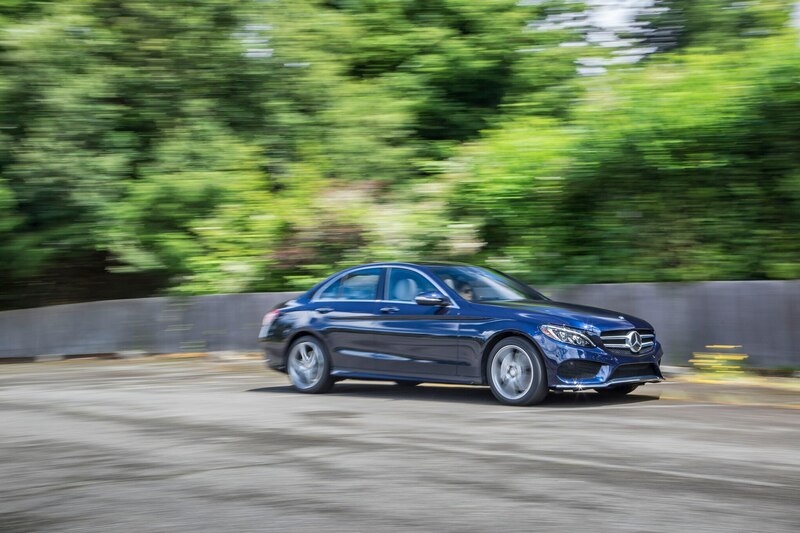 It’s just as restrained and polite under full throttle as the C300, but with punchier acceleration. 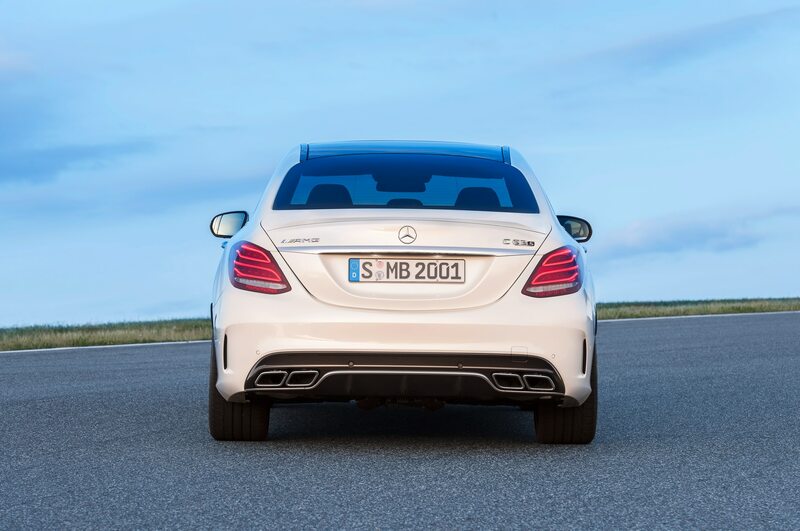 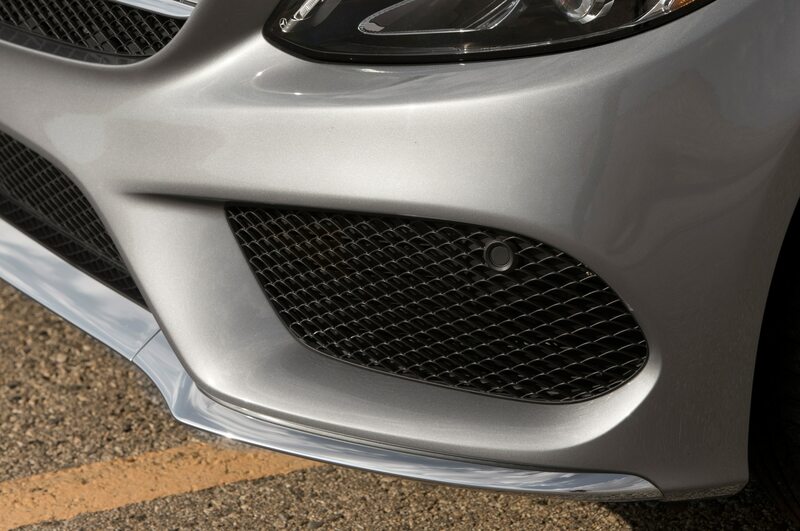 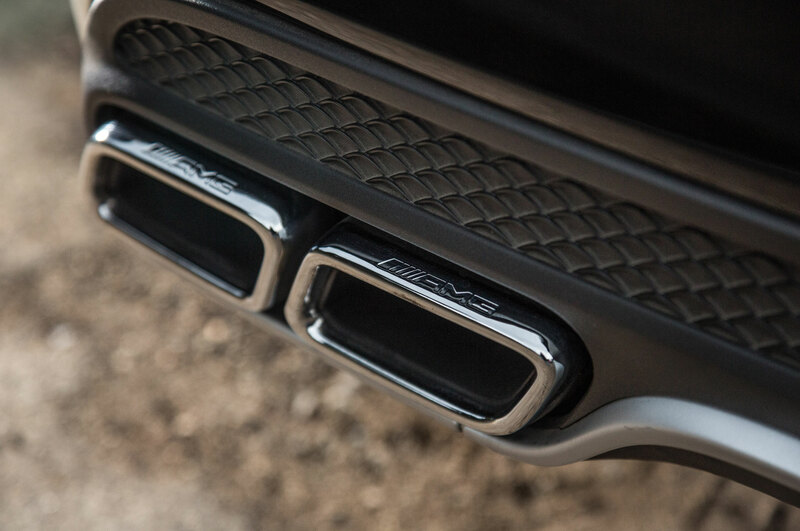 We prefer the 2.0-liter’s peppier, more instantaneous responses. 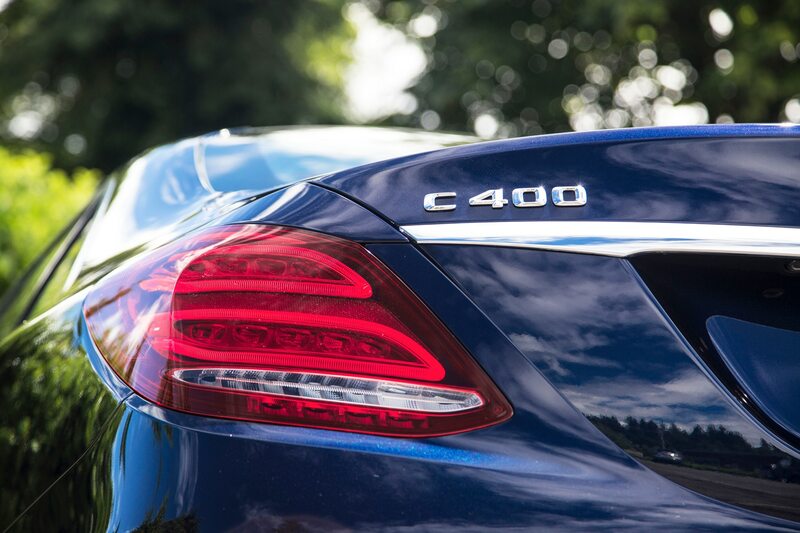 The C400 is significantly faster, but in the real world, the C300 has a more useful character because it has slightly less lag. 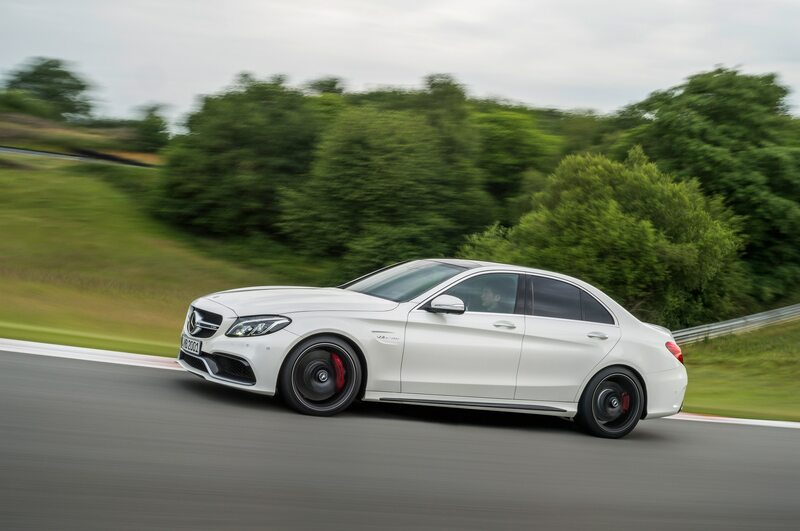 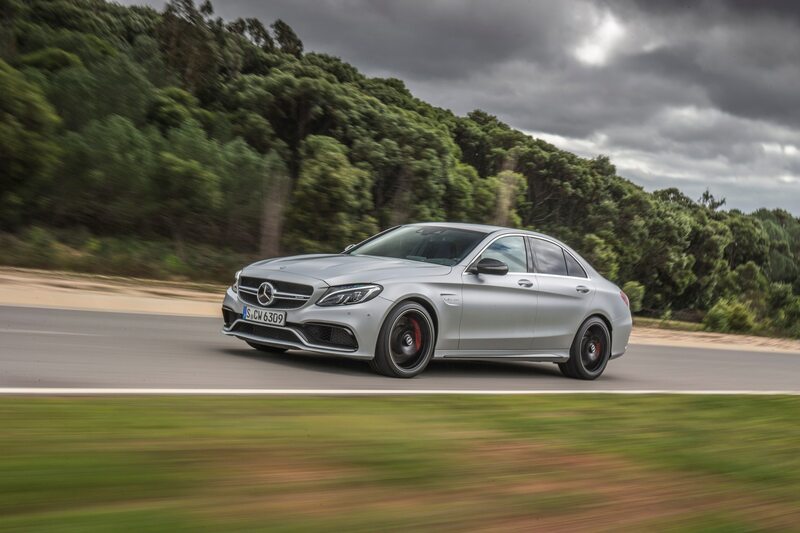 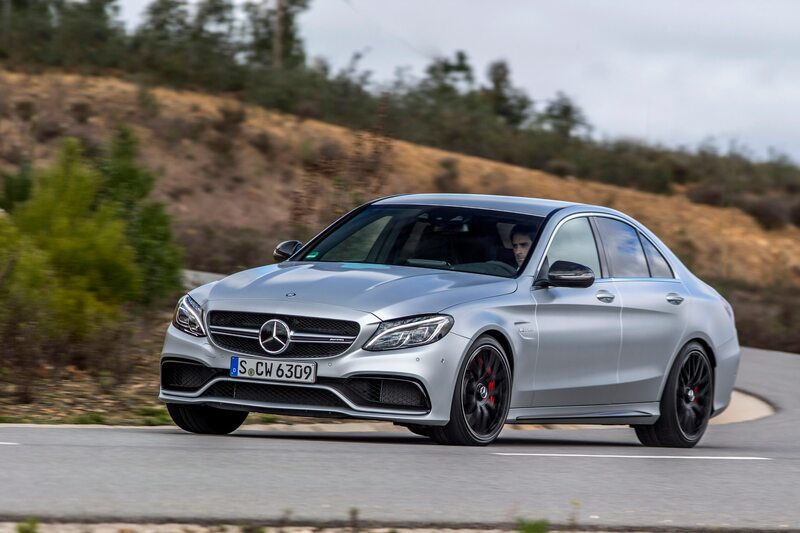 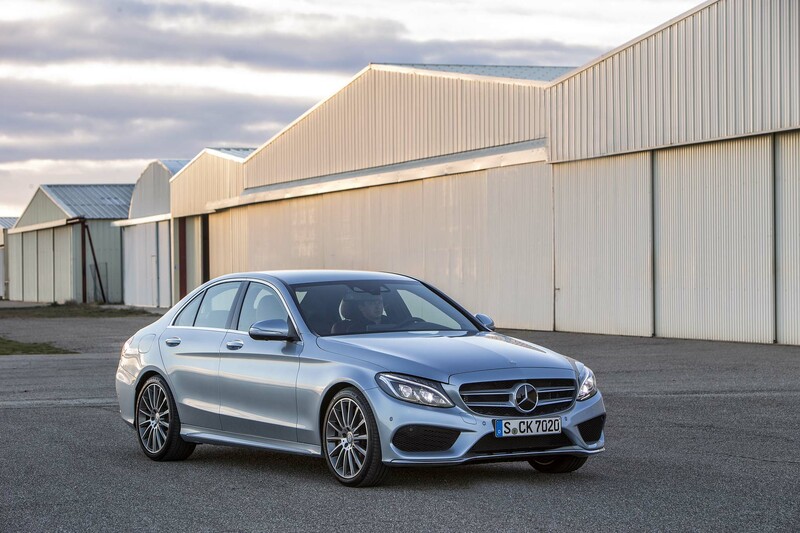 Couple that with the C400 4Matic’s increased price and fuel consumption, and we are not surprised Mercedes expects fewer than 20 percent of shoppers to elect it over the C300. 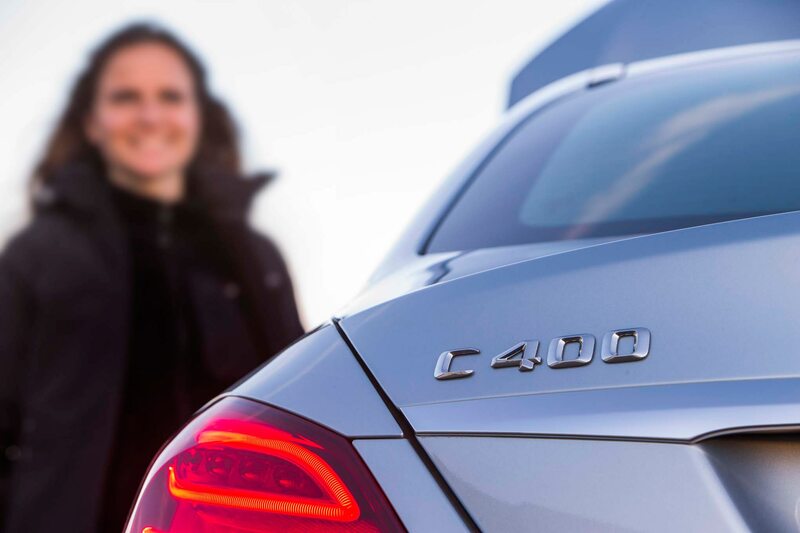 No rear-wheel-drive C400 is planned for U.S. import. 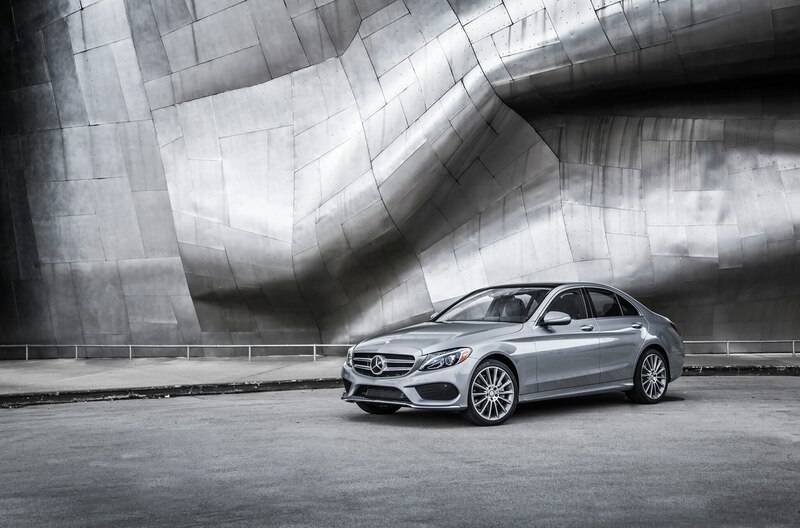 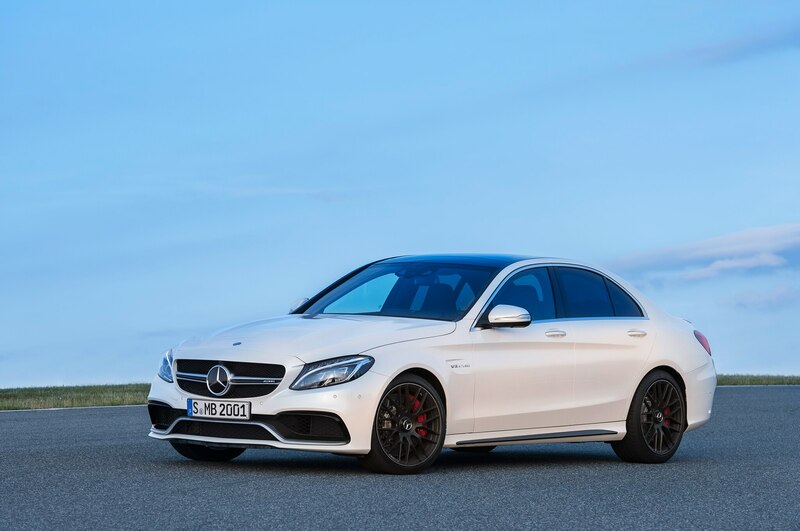 With 55 percent of the 4Matic’s power sent to the rear wheels anyway, there’s no need to fear a front-heavy feel, and having more 4Matic cars is a clear nod to dealers and owners in states with four seasons. 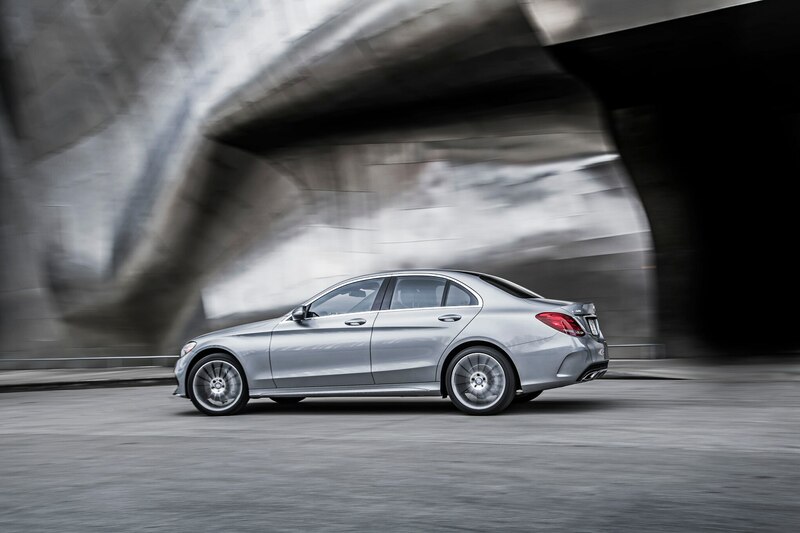 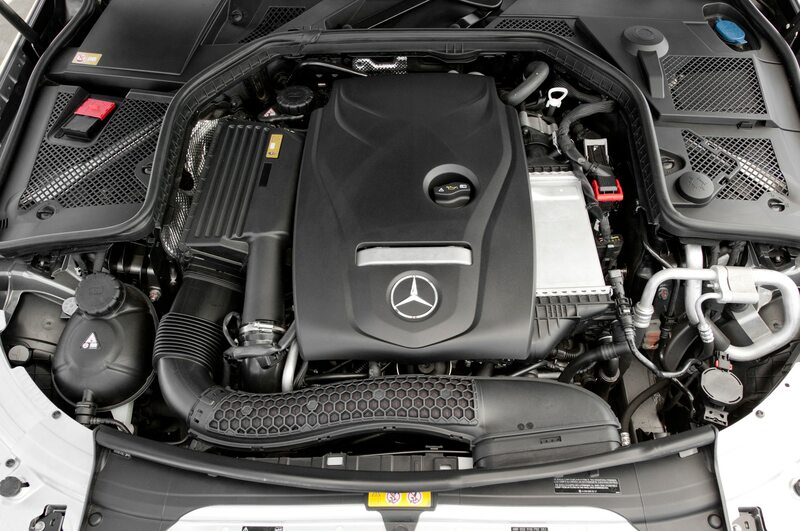 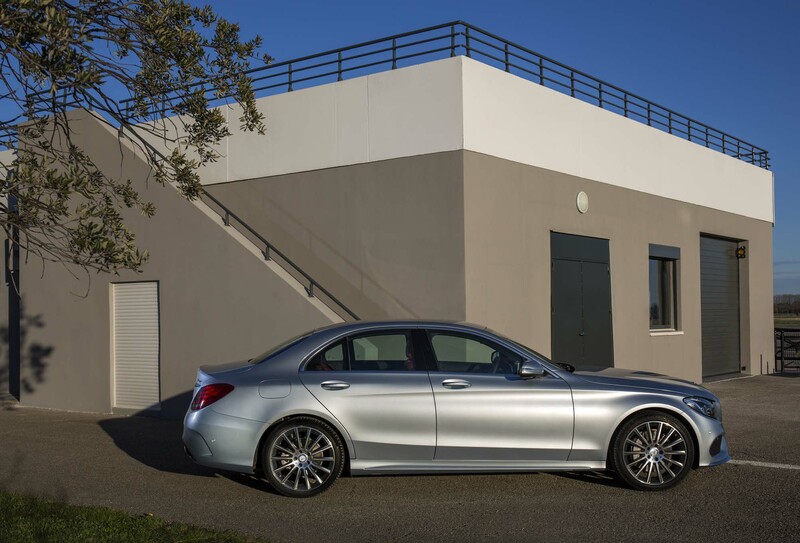 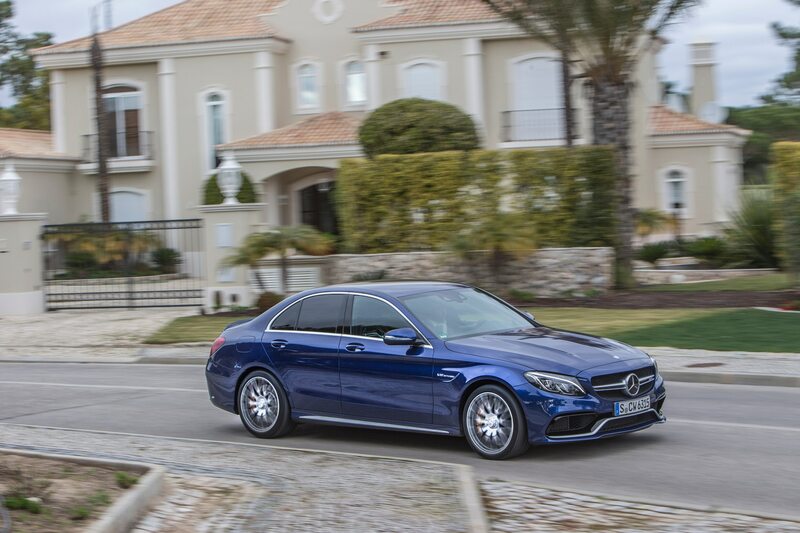 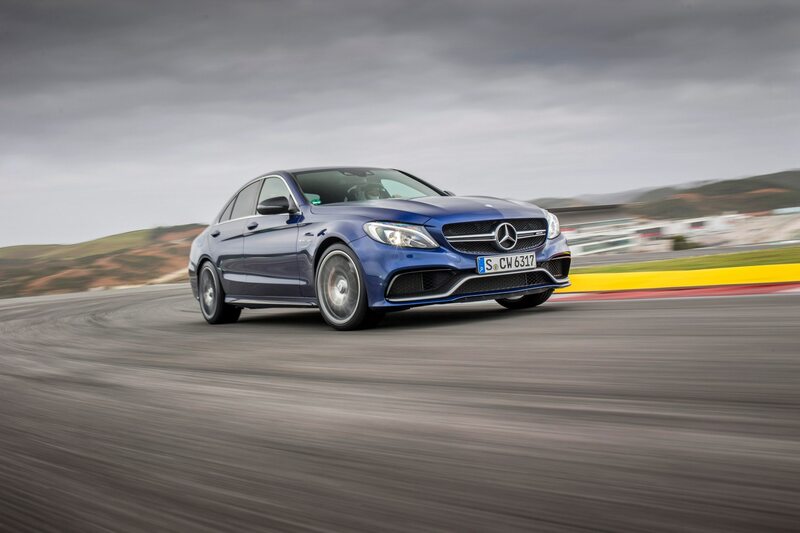 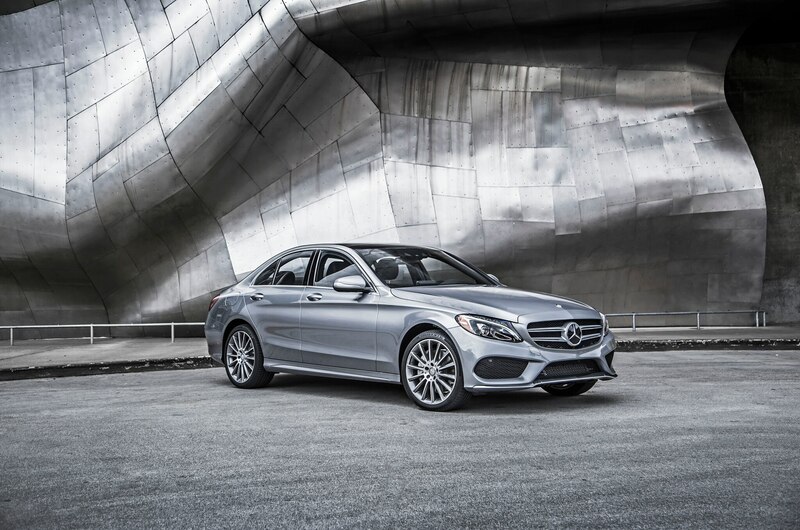 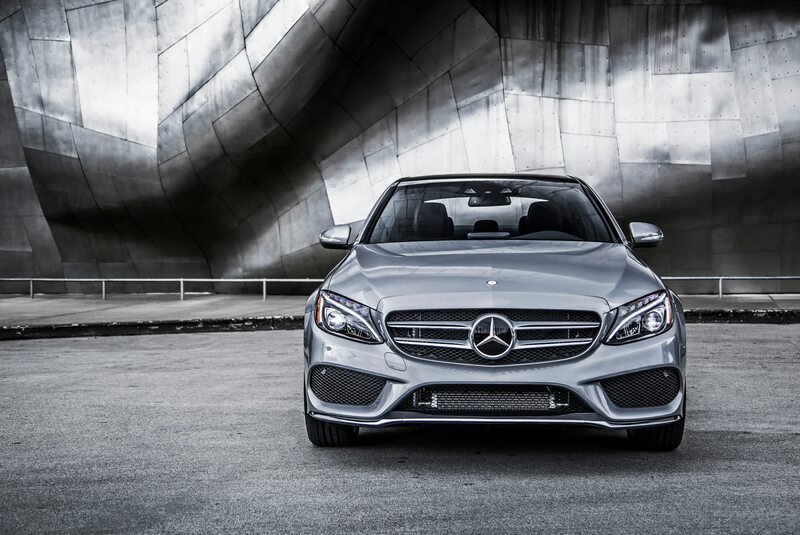 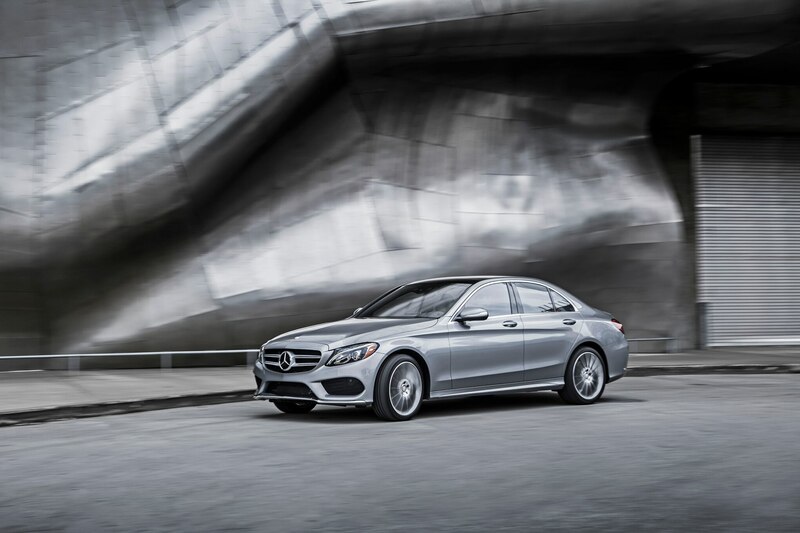 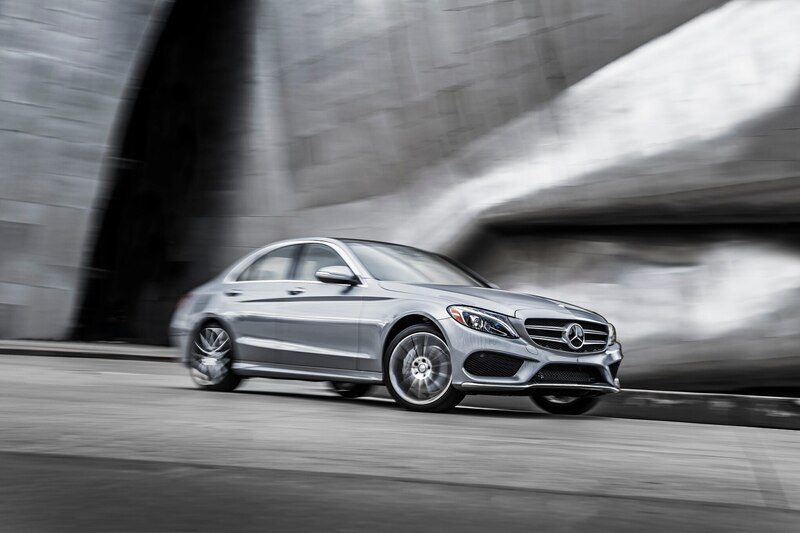 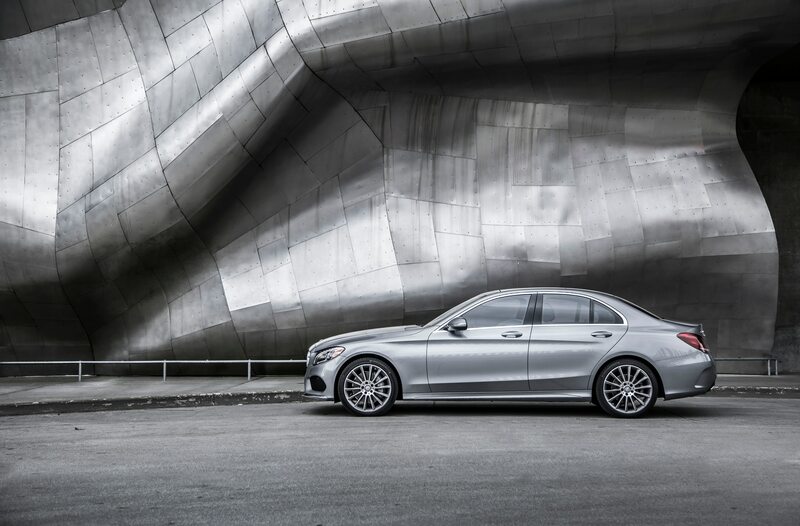 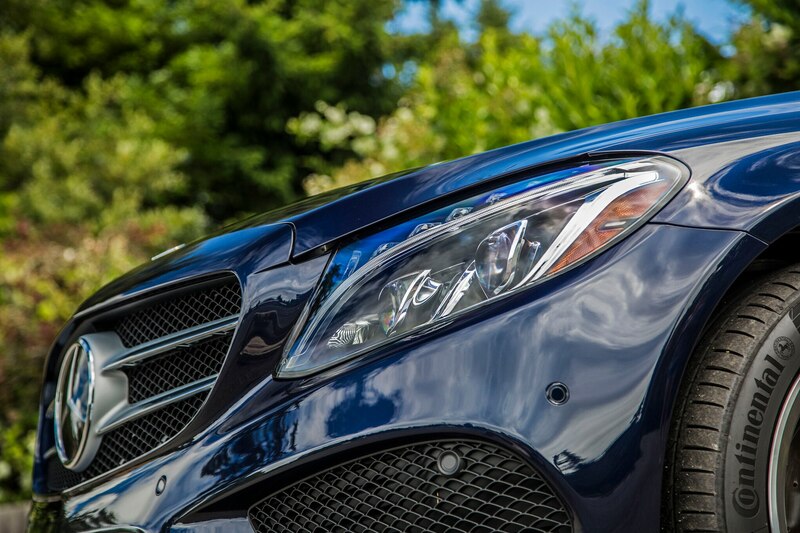 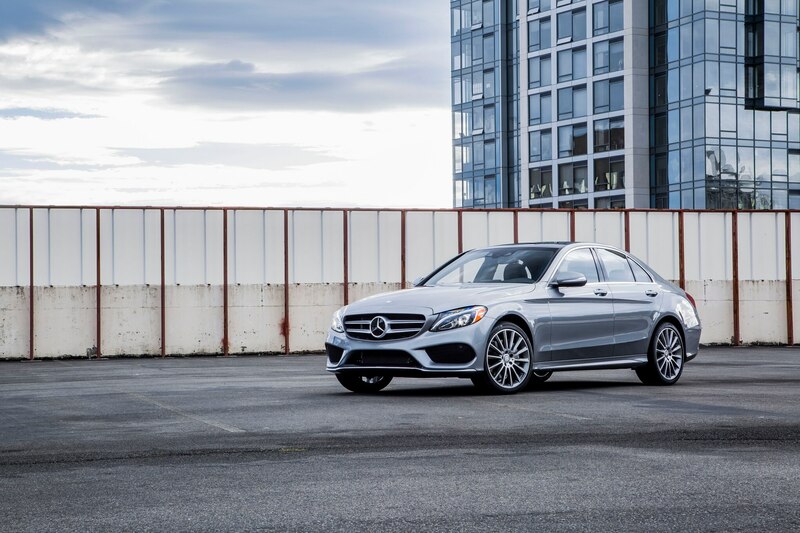 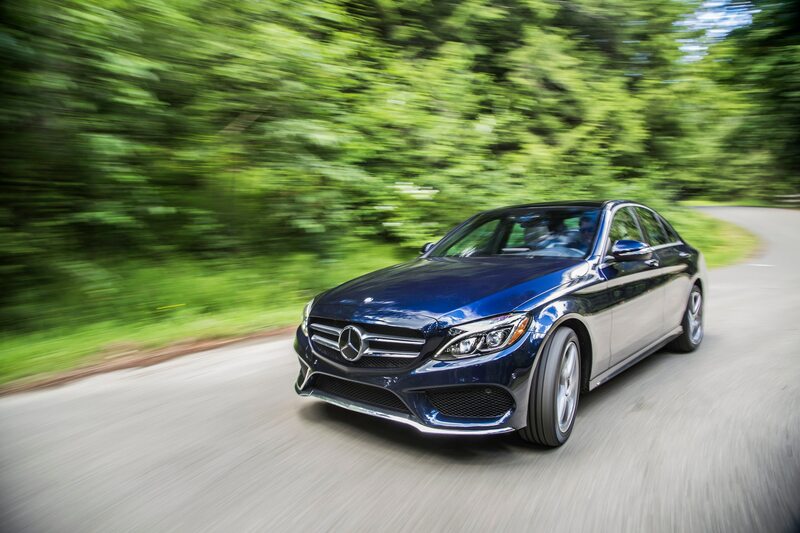 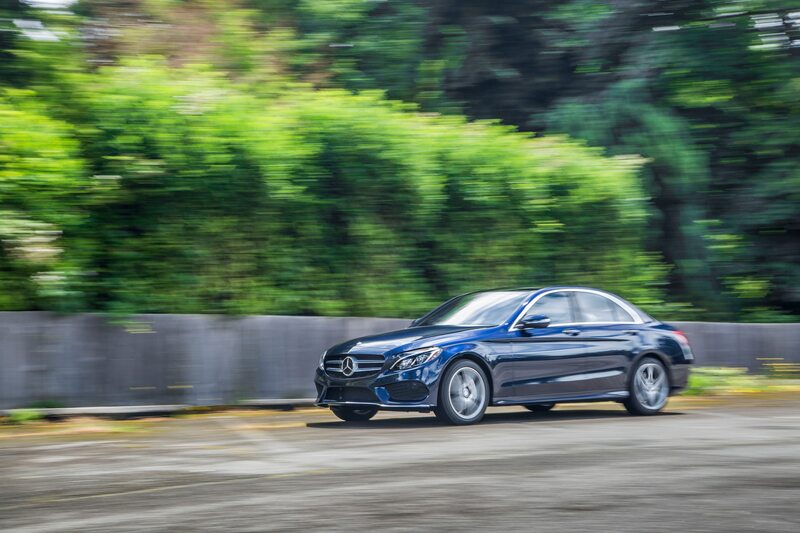 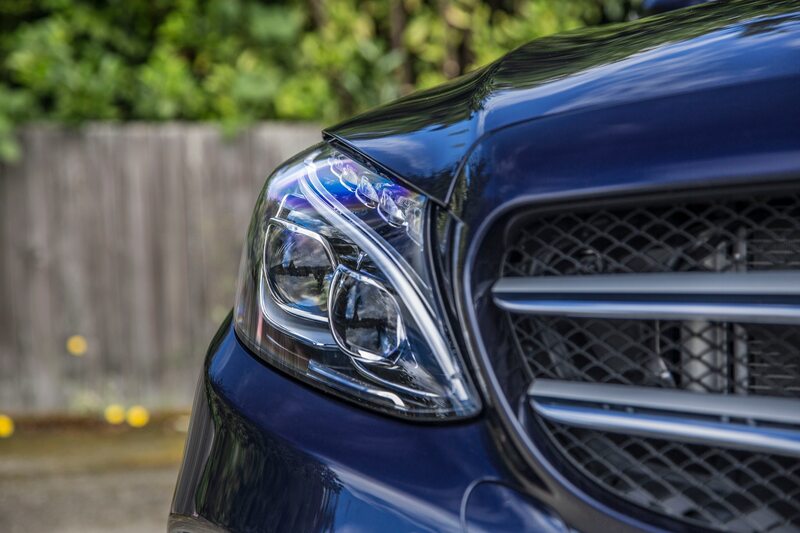 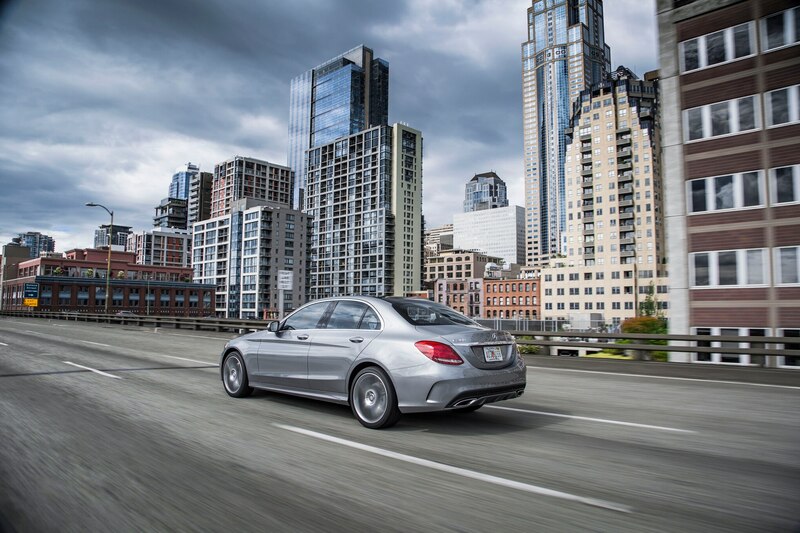 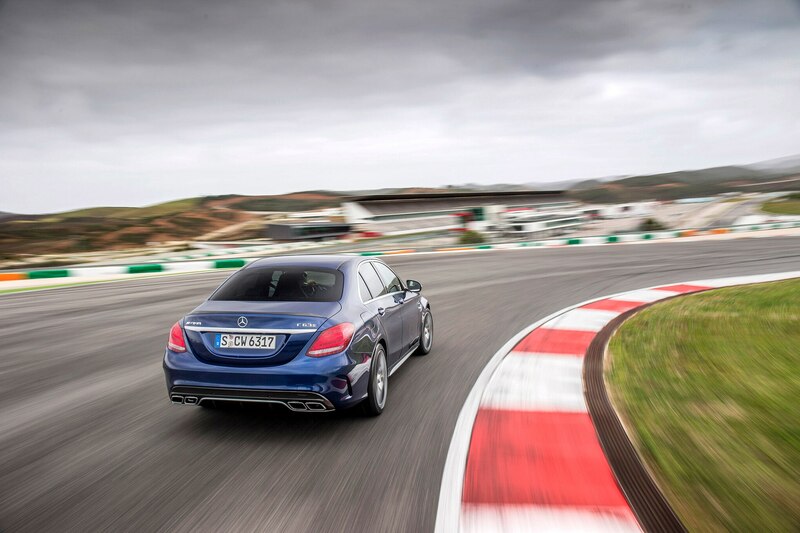 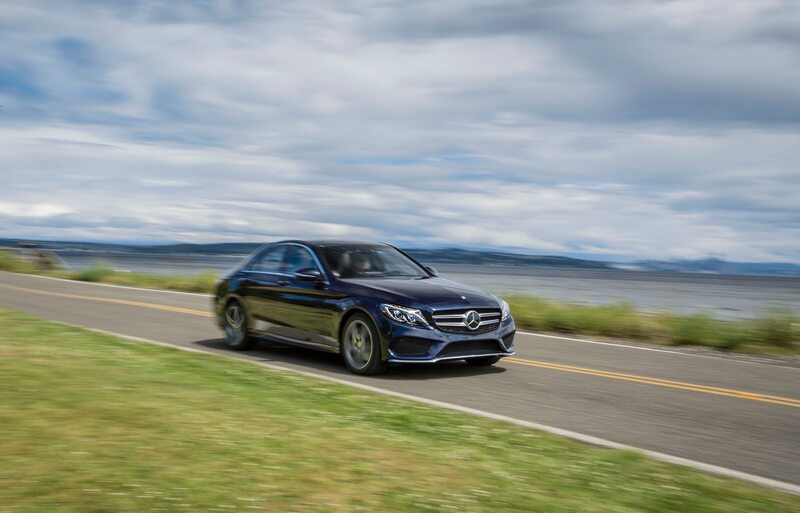 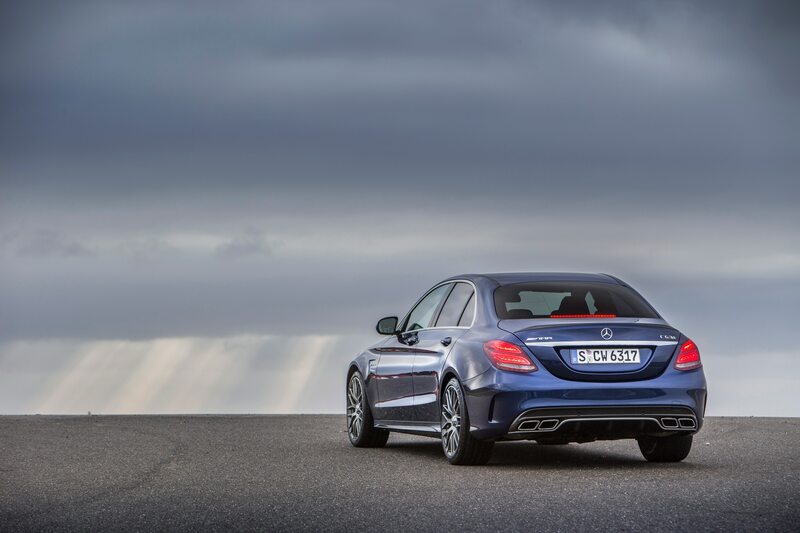 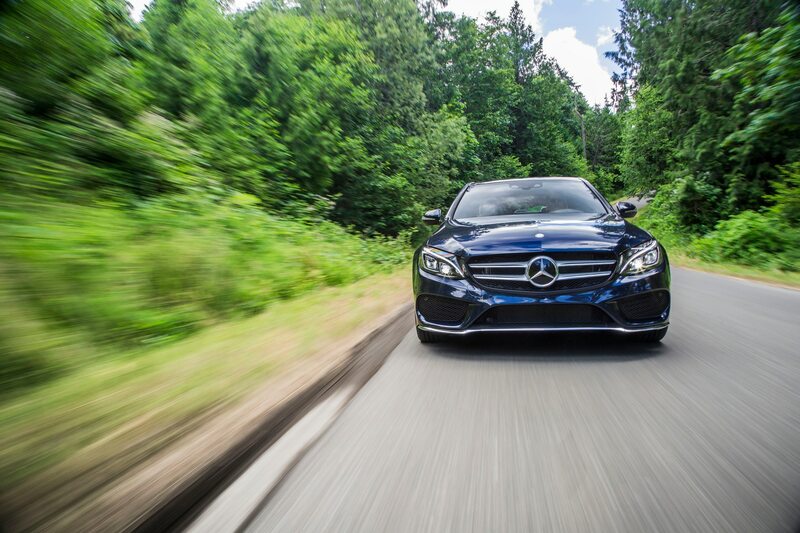 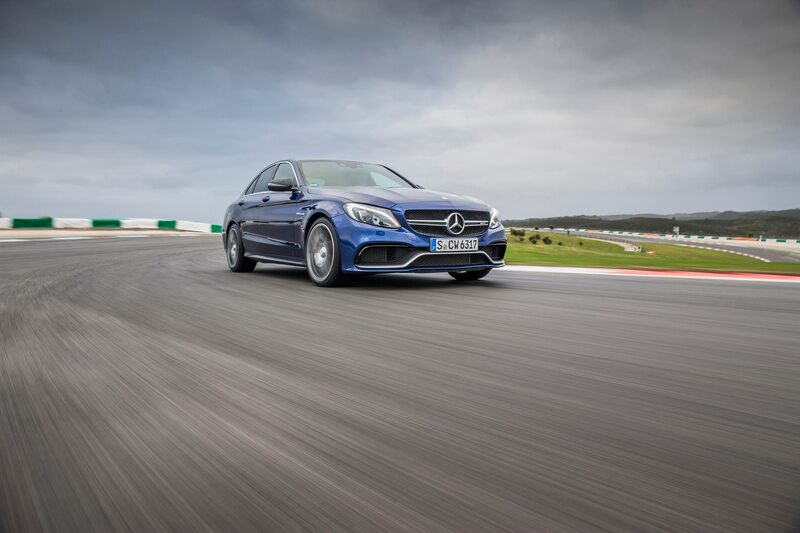 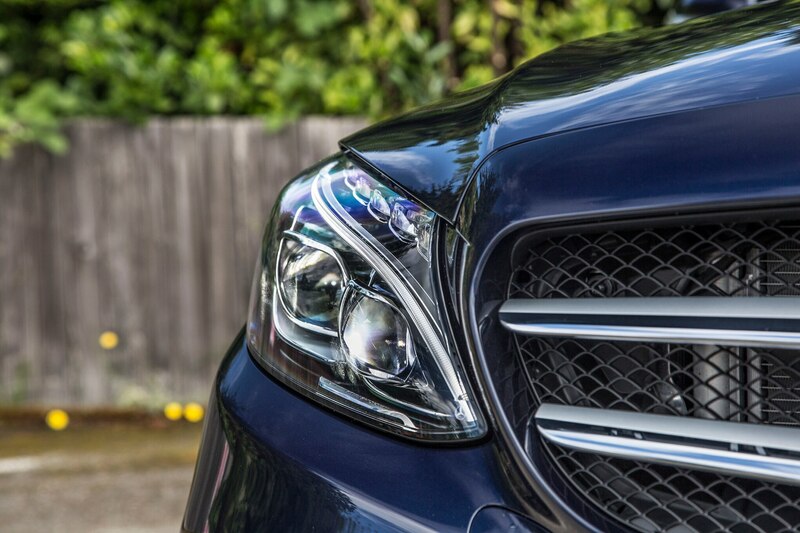 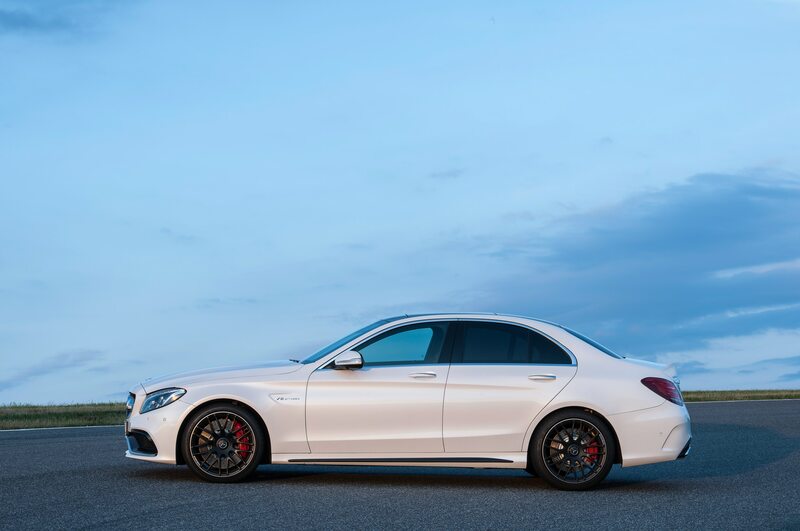 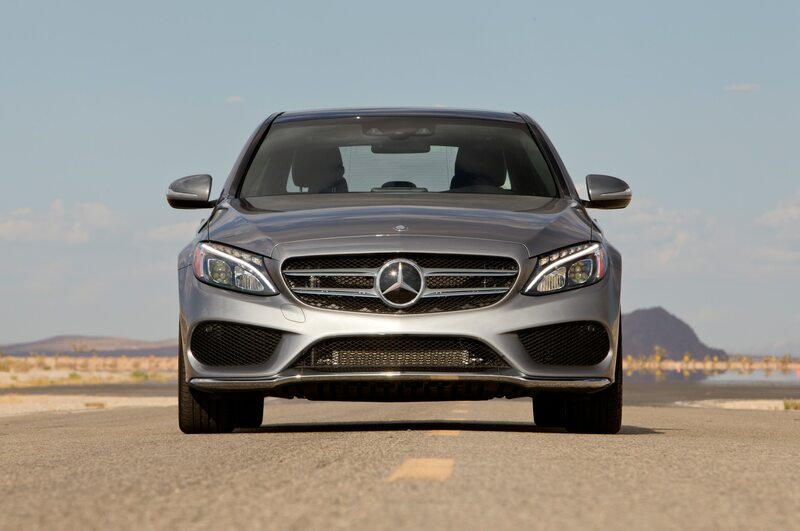 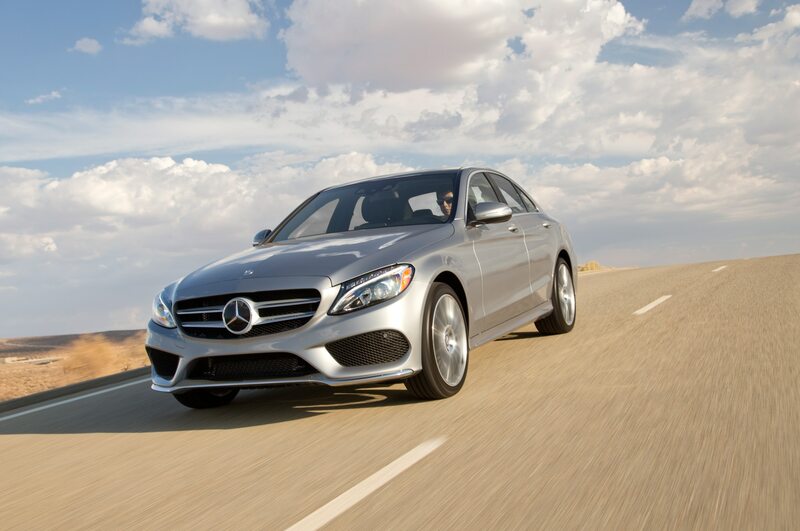 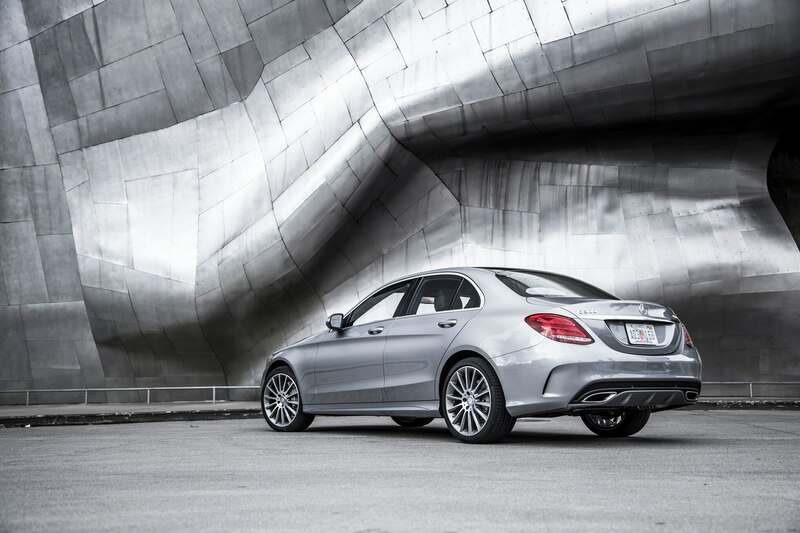 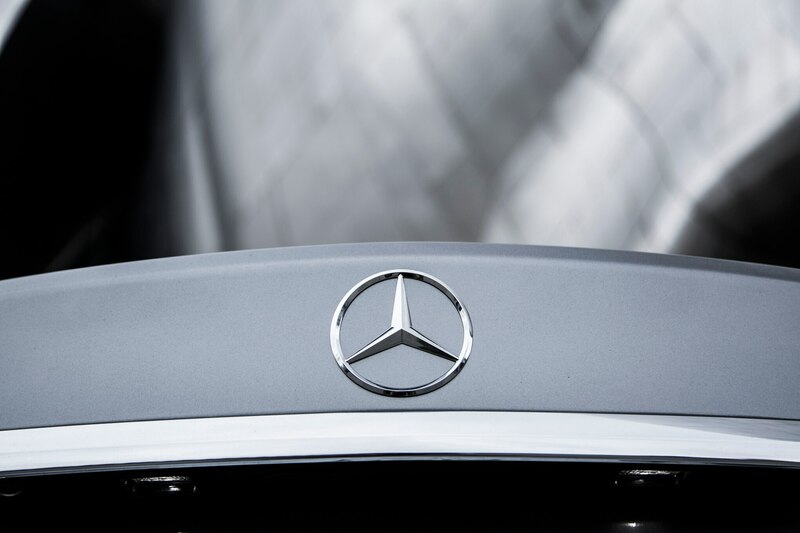 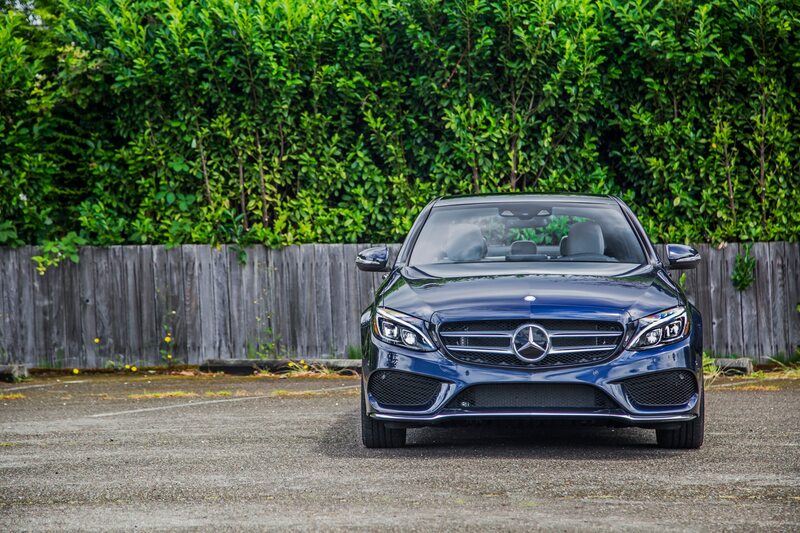 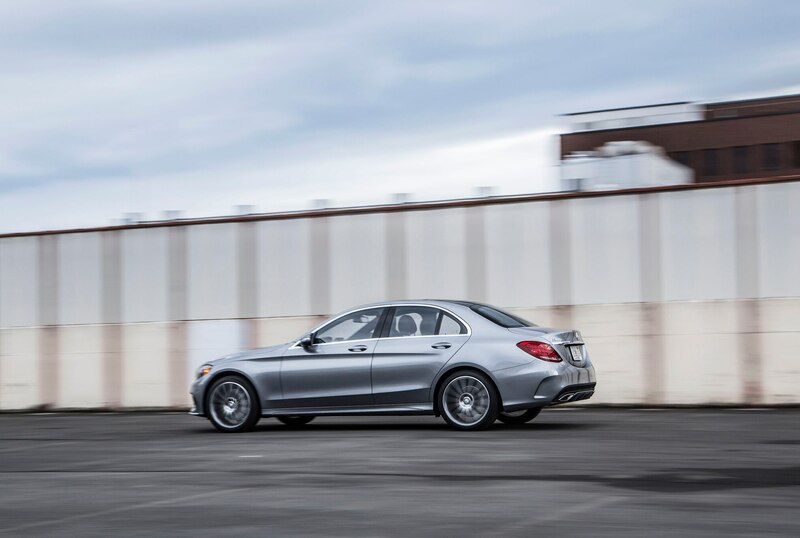 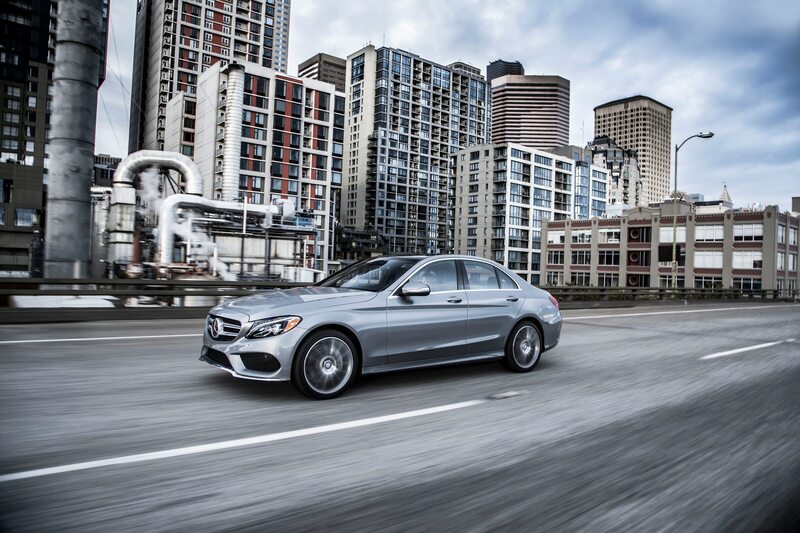 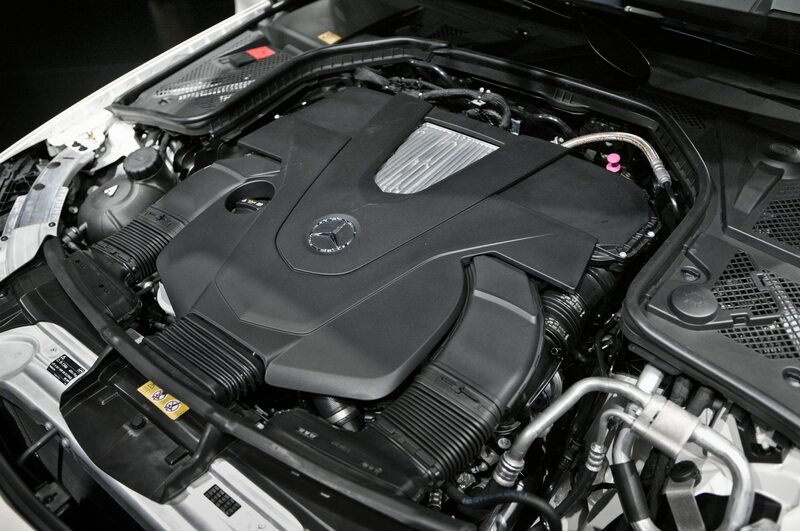 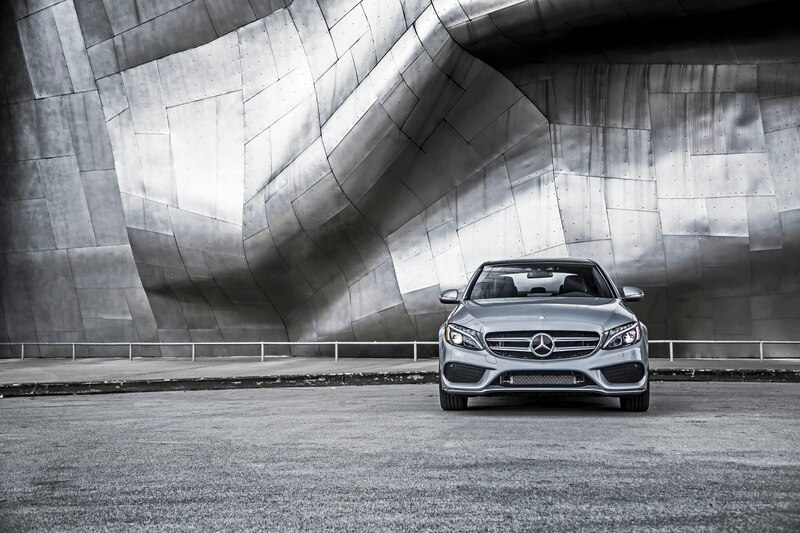 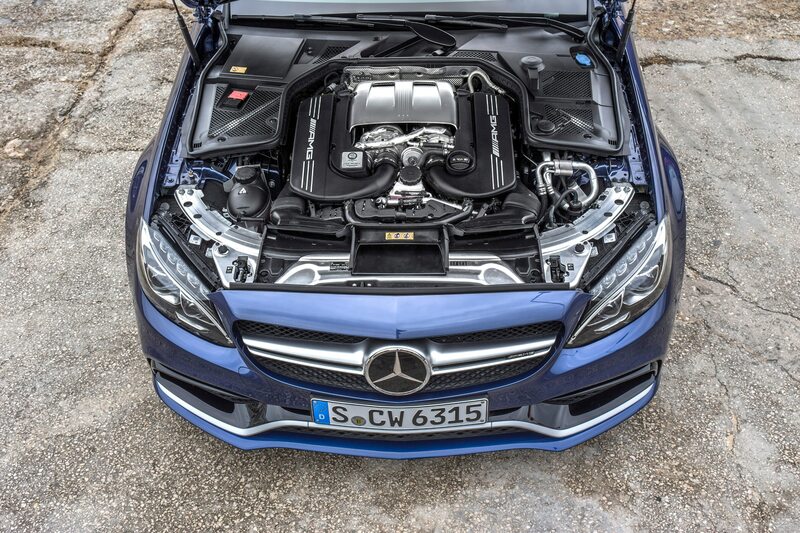 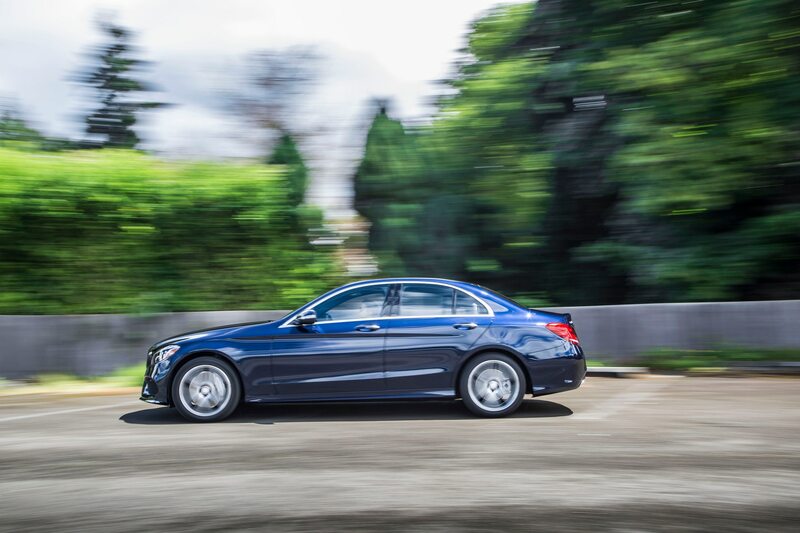 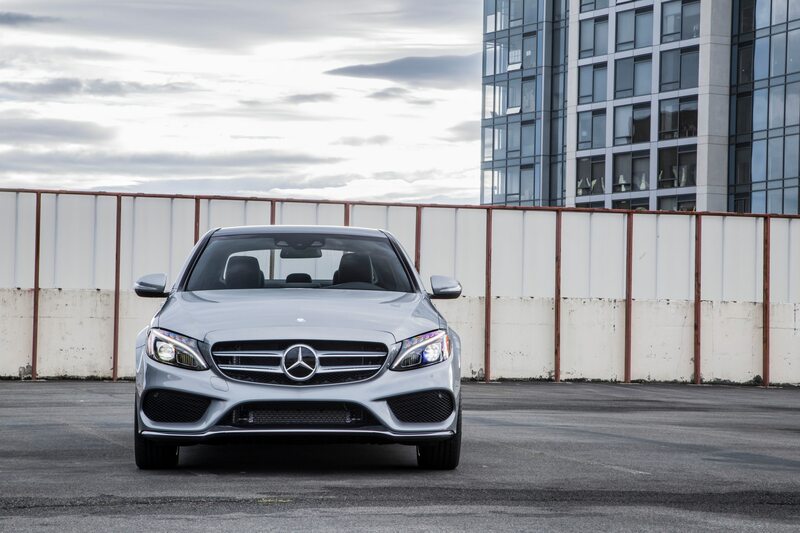 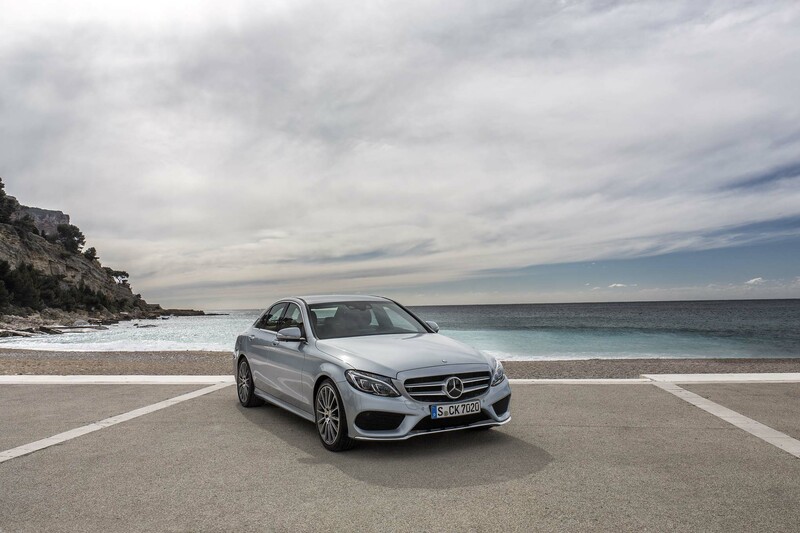 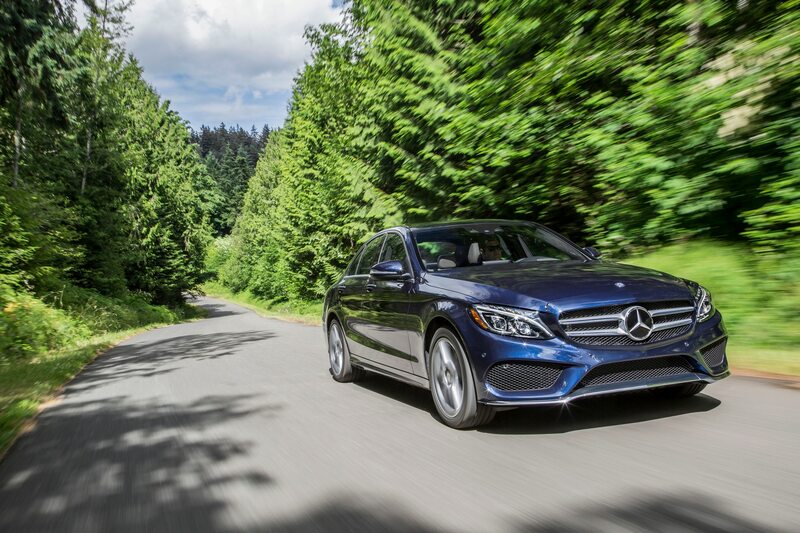 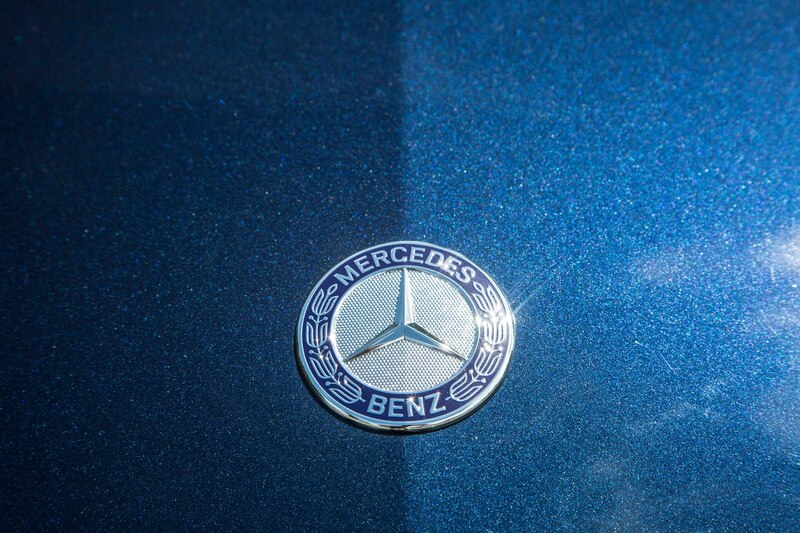 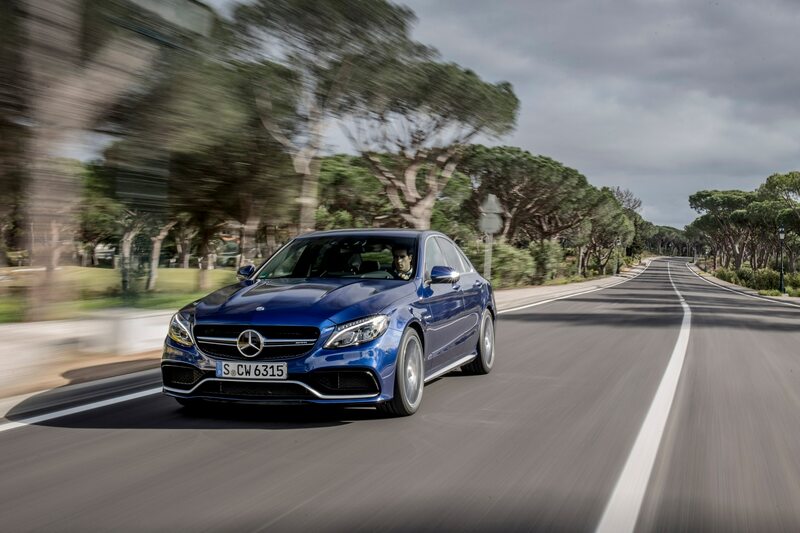 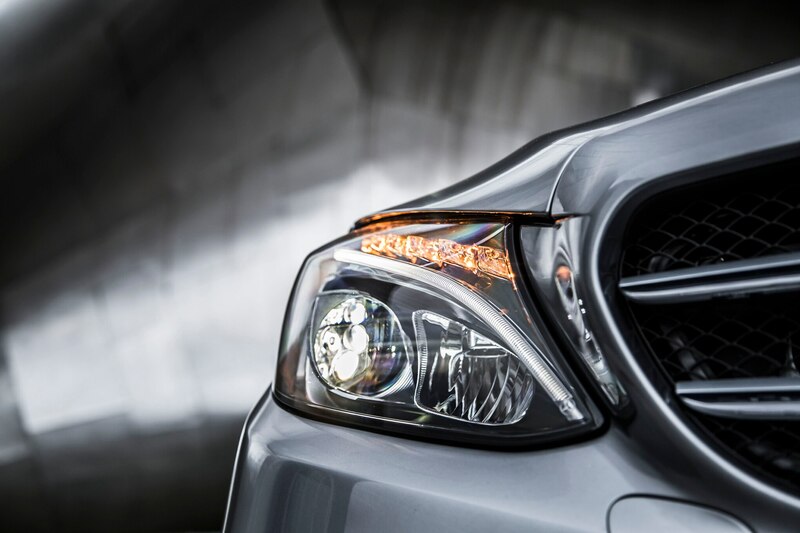 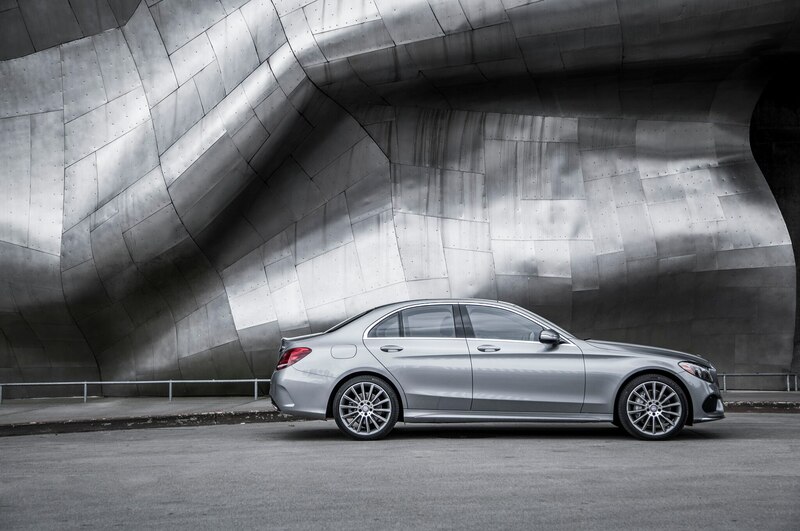 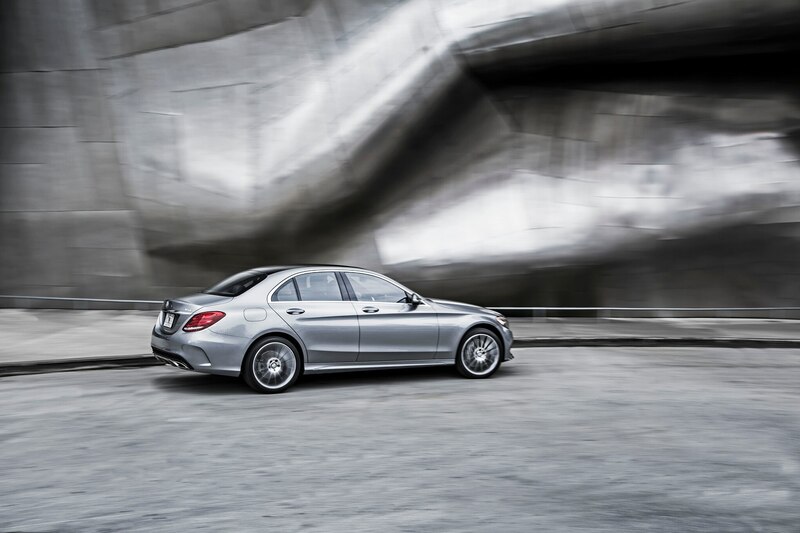 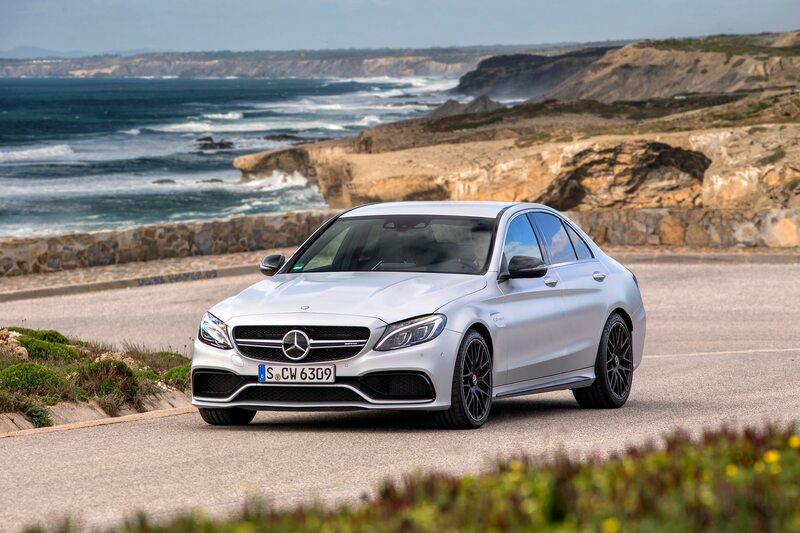 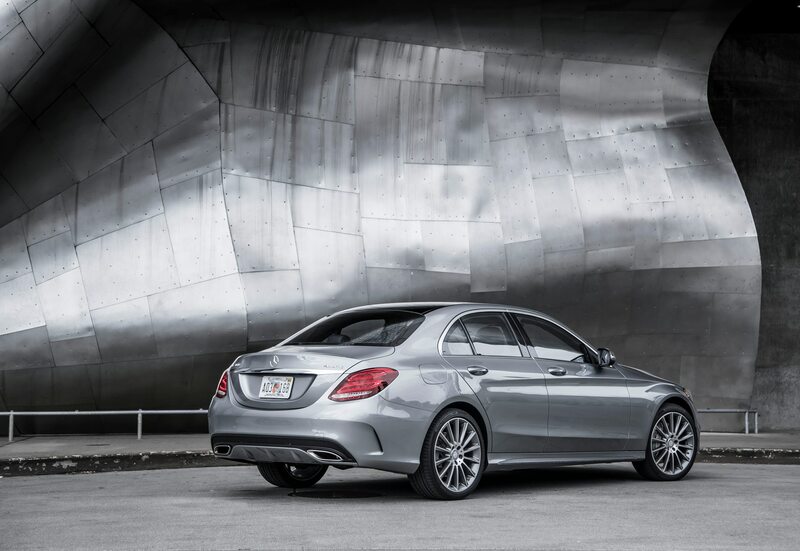 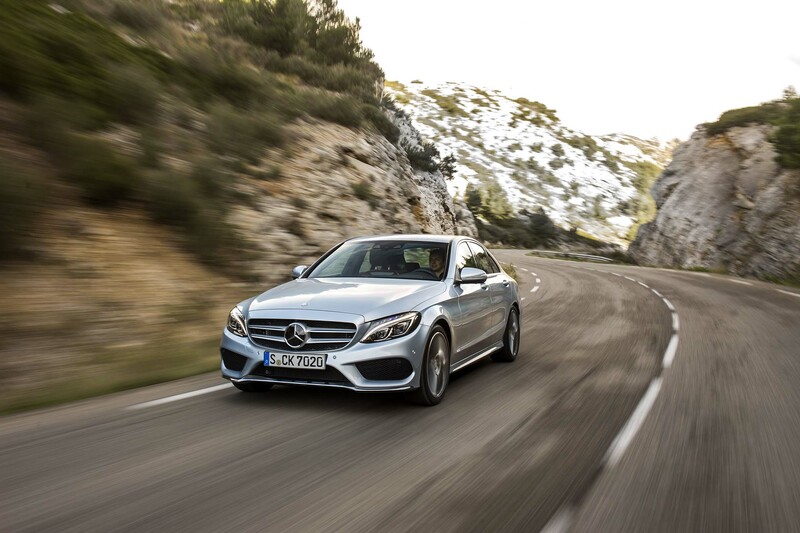 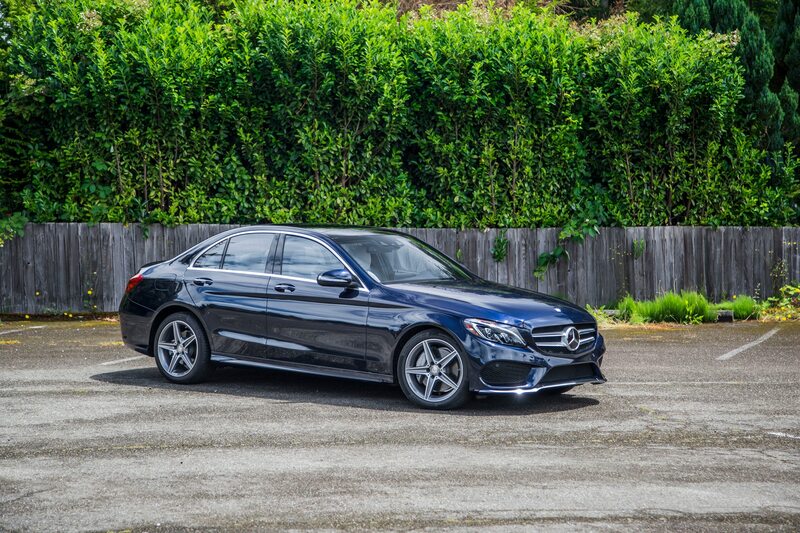 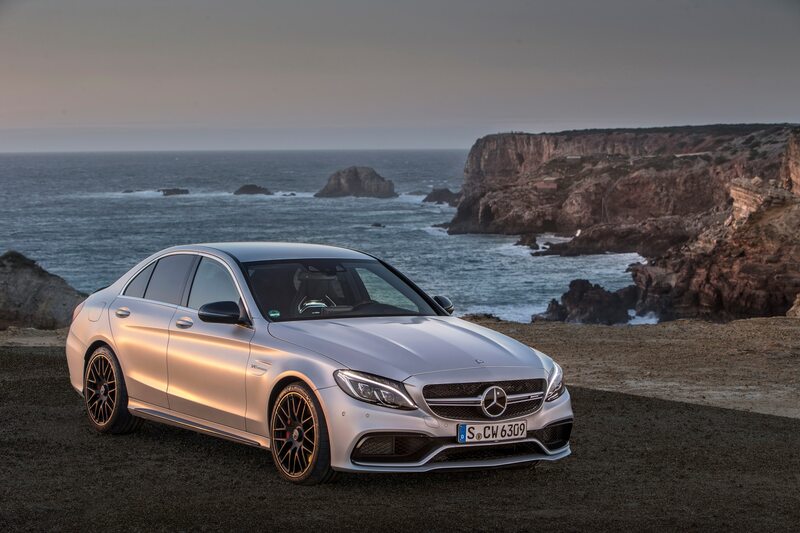 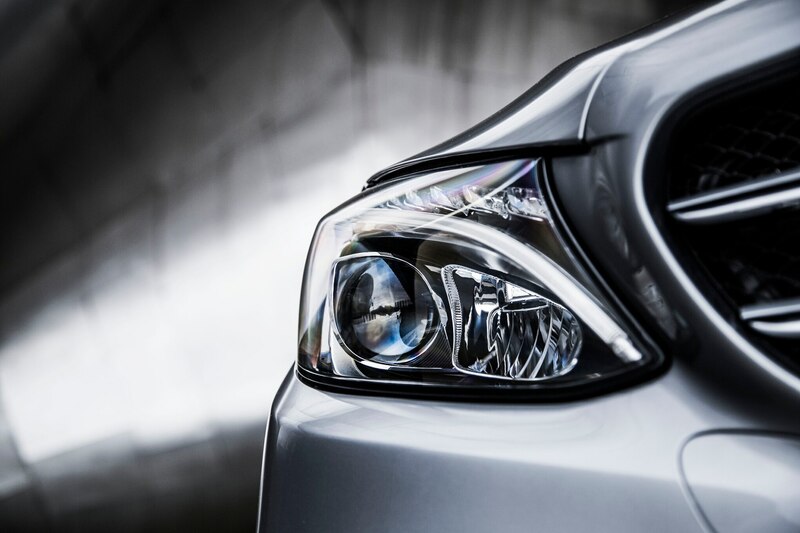 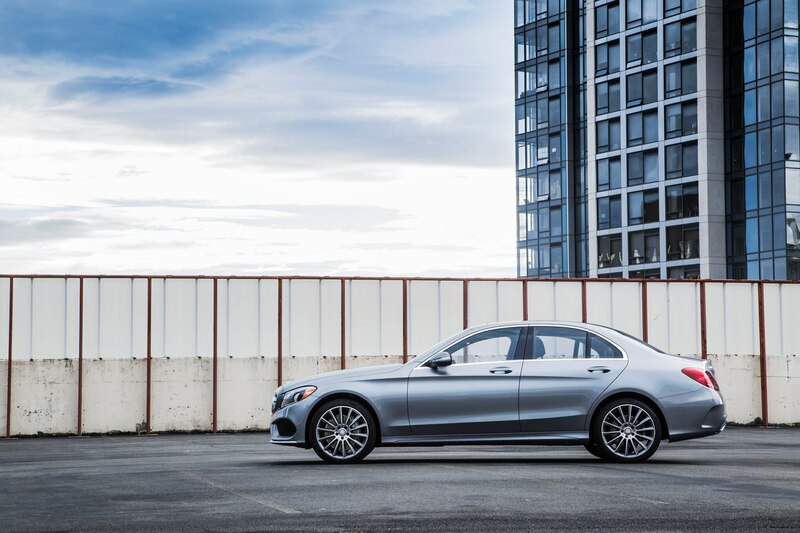 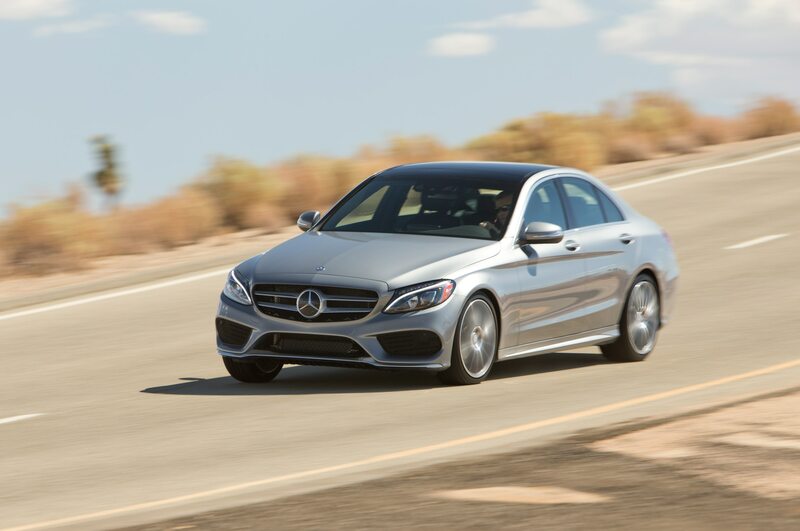 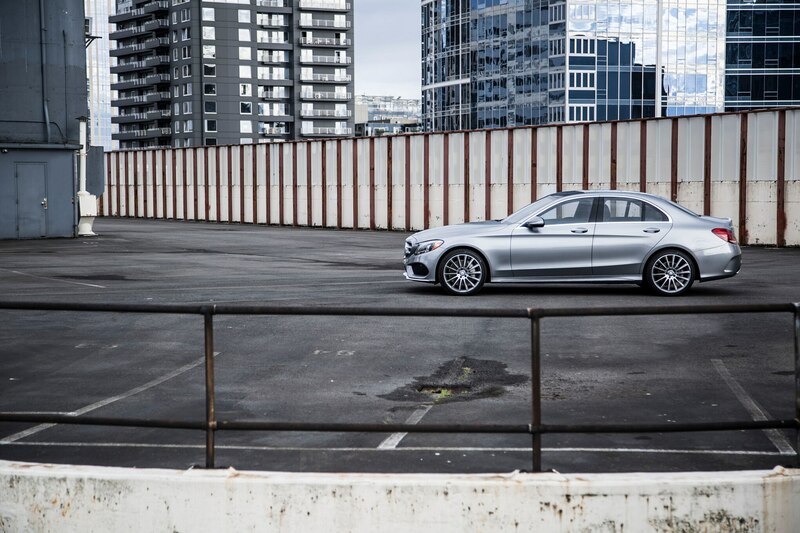 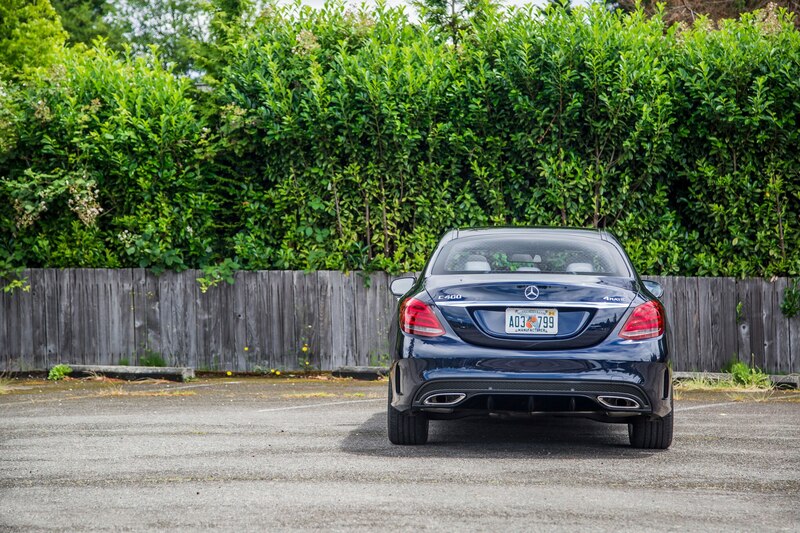 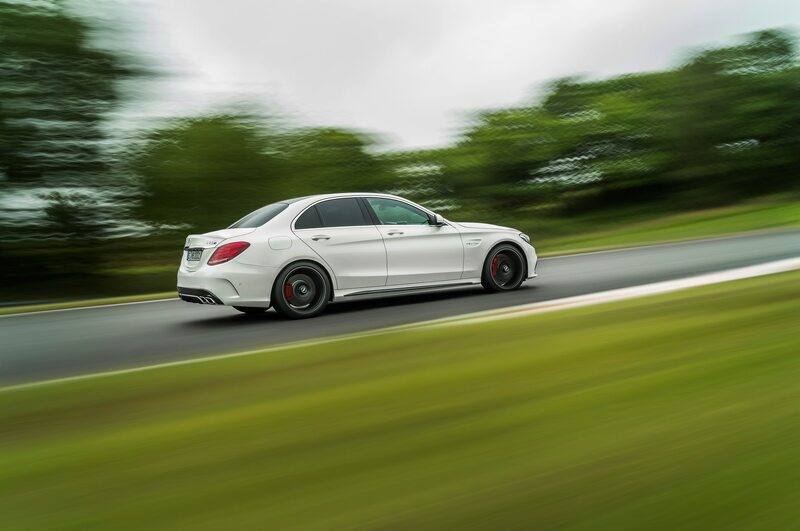 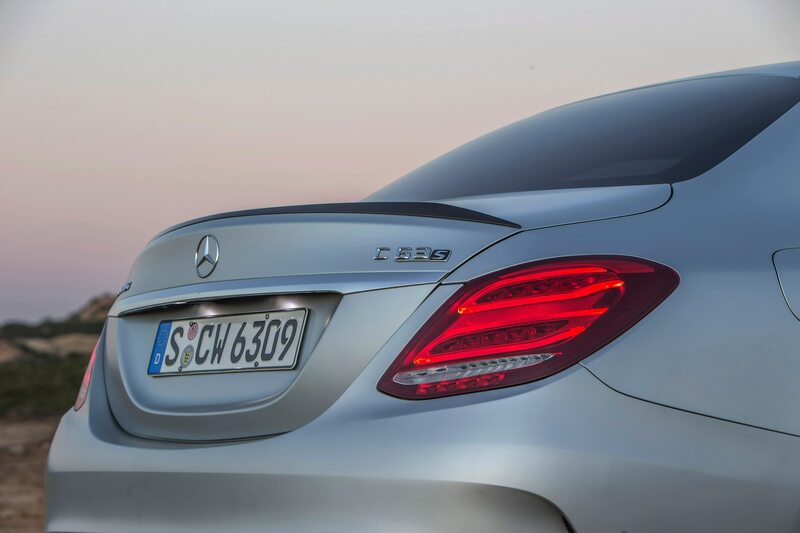 The appeal of the 2015 Mercedes-Benz C-Class comes from the way it balances all we want from a luxury sedan. 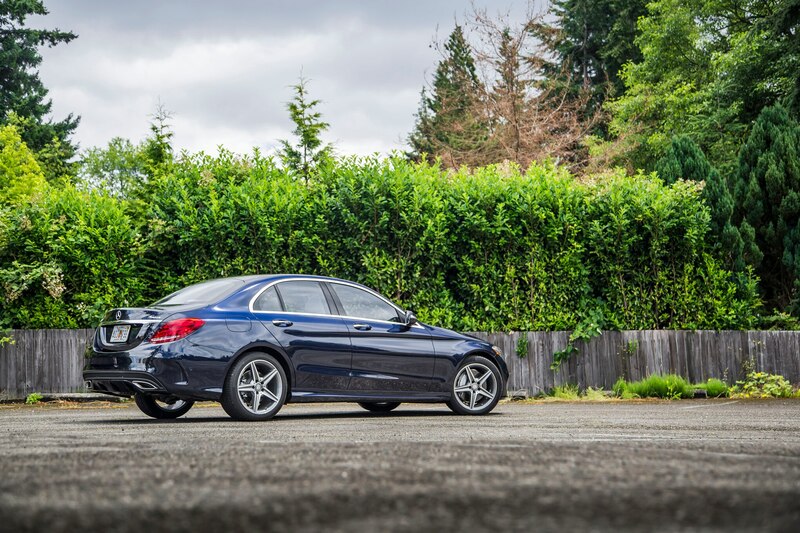 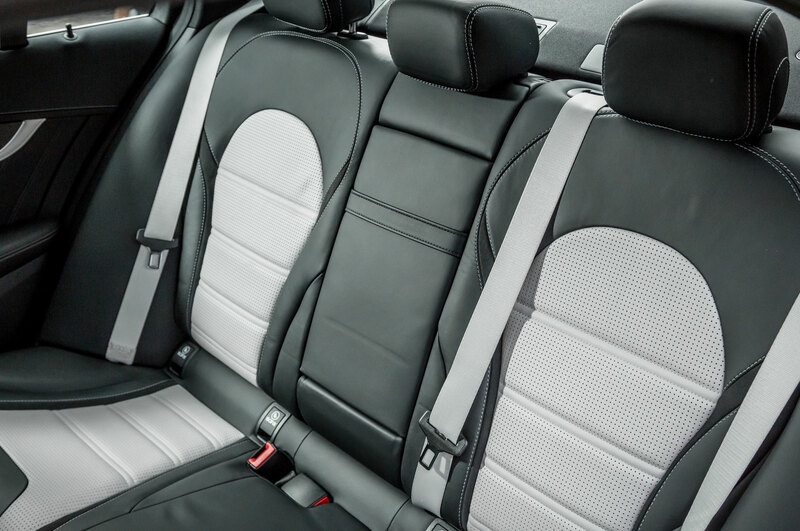 It’s a stylish, comfortable, gadget-laden conveyance that also drives extremely well. 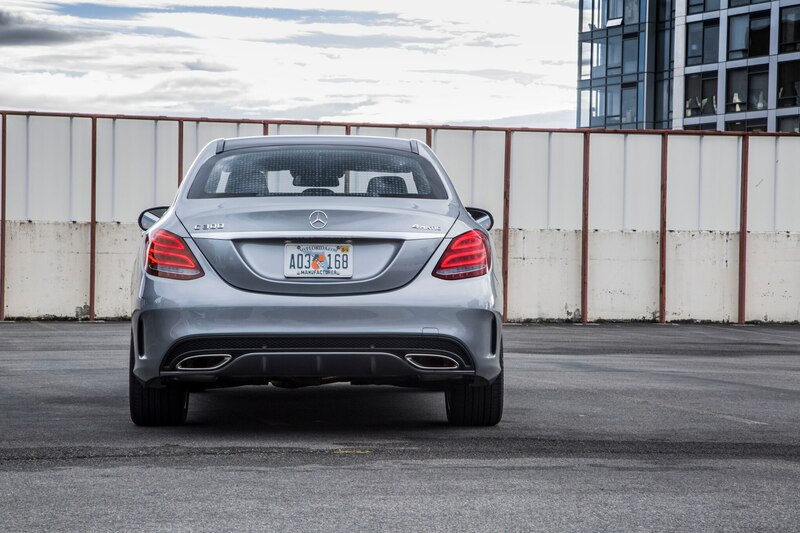 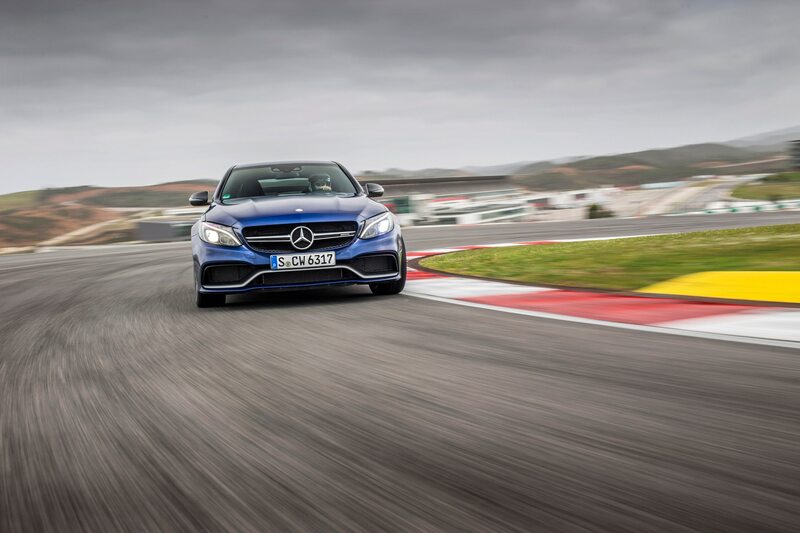 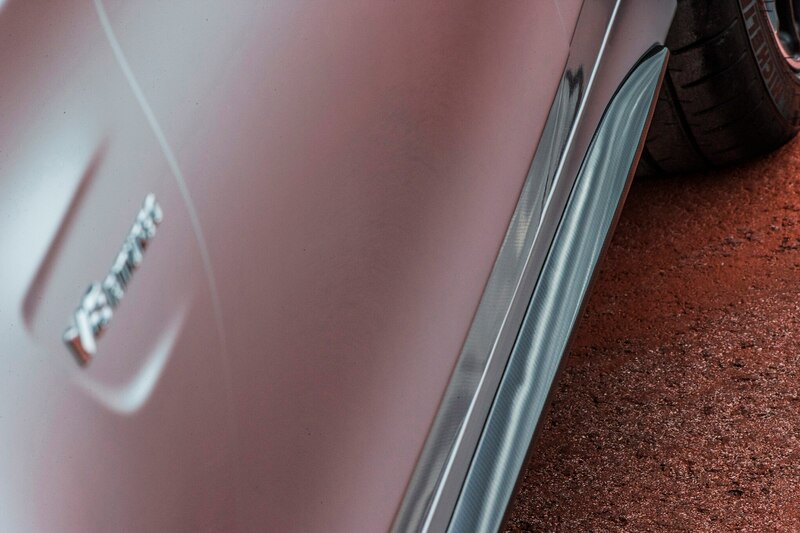 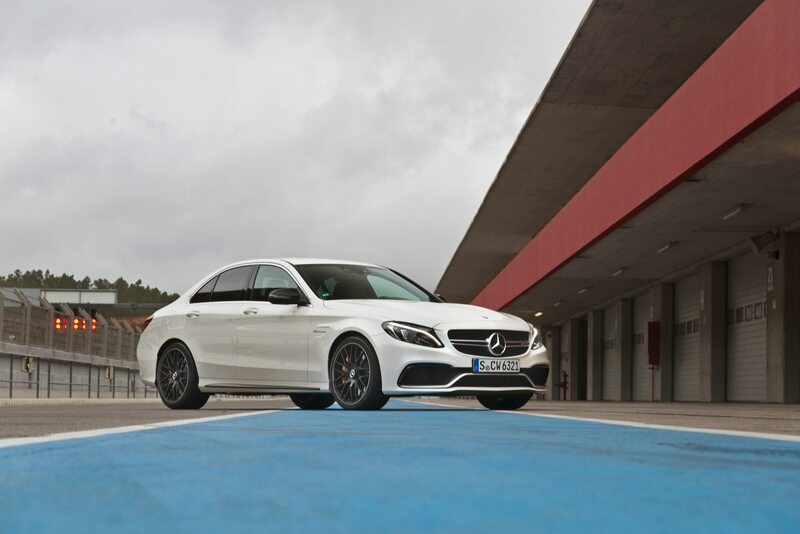 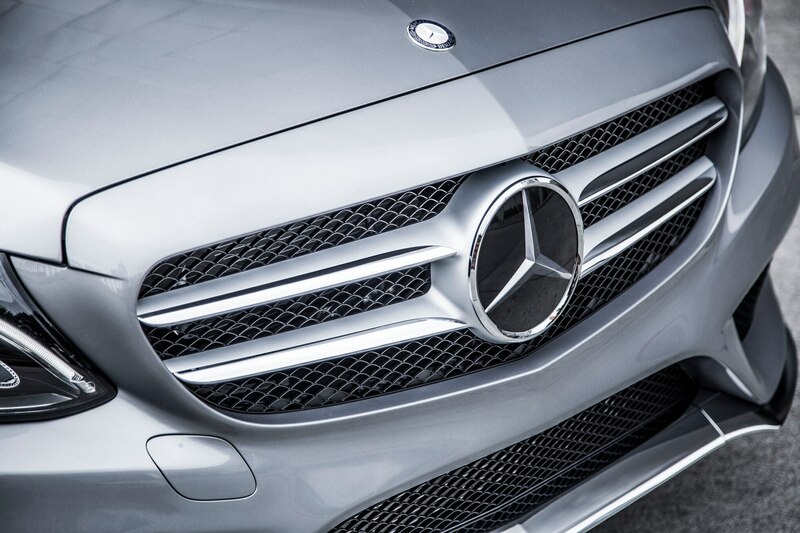 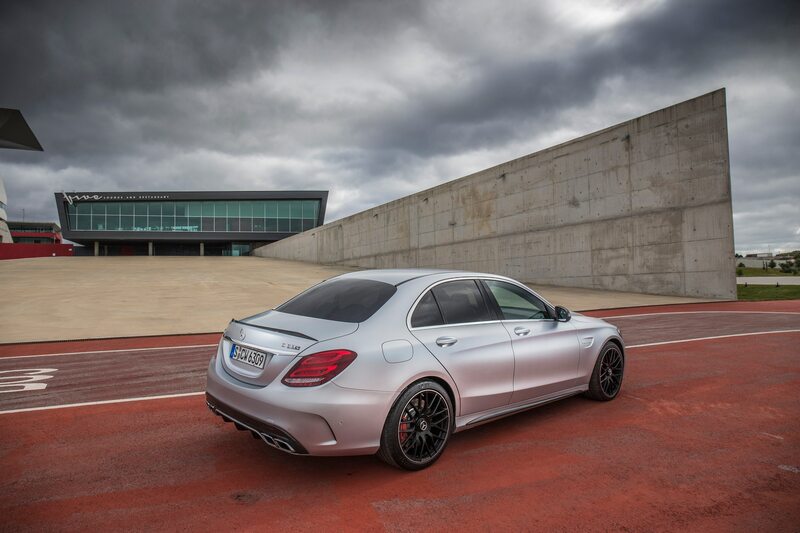 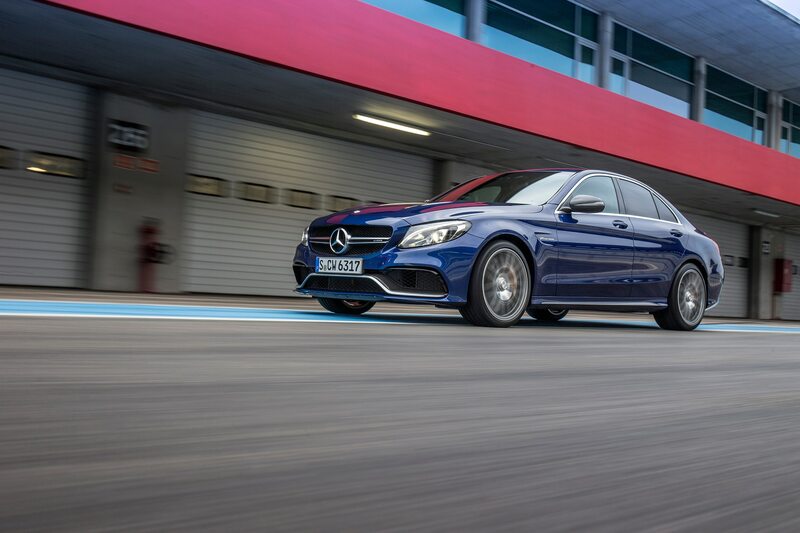 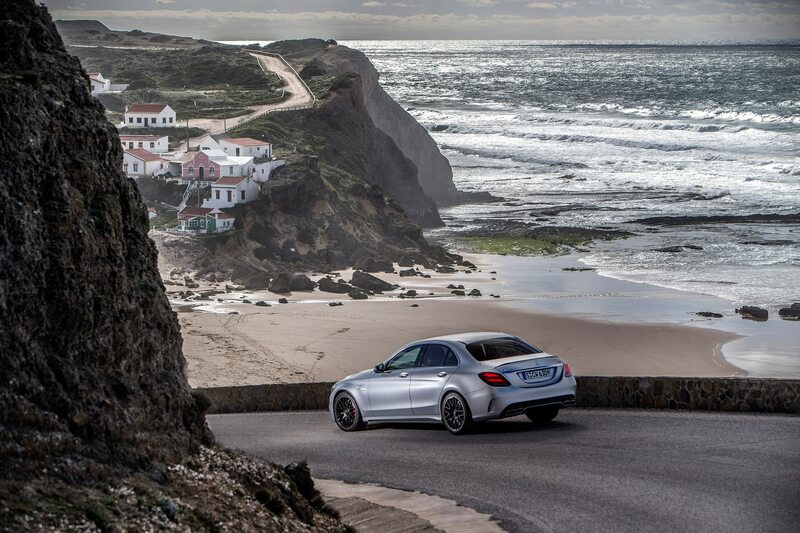 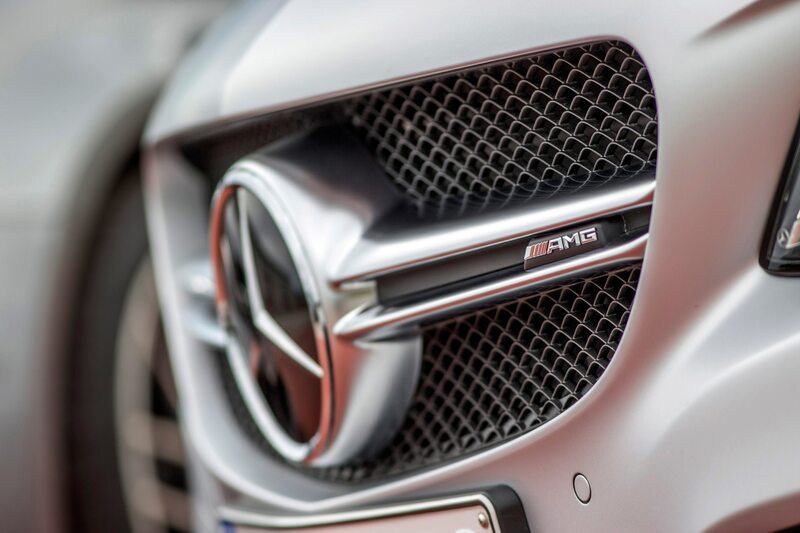 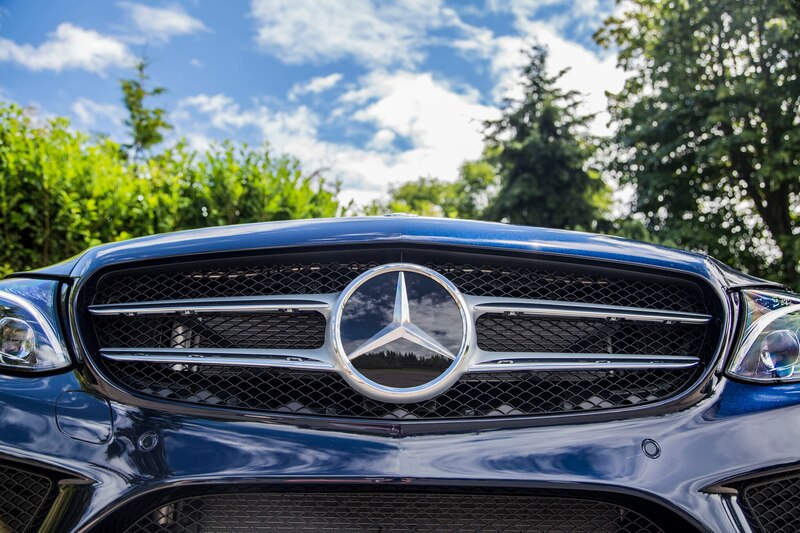 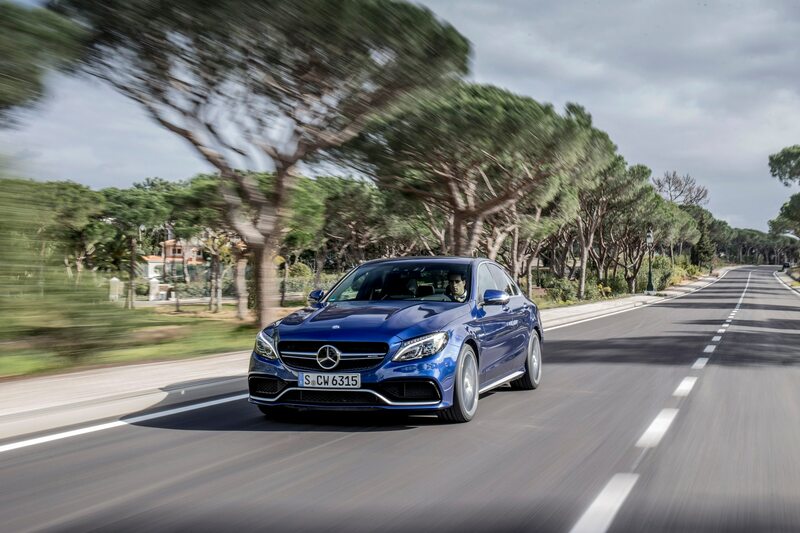 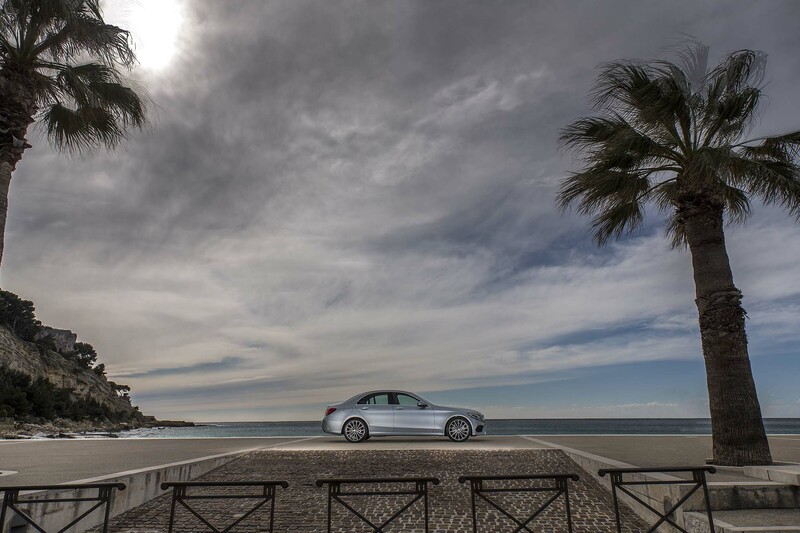 Rivals may beat the C-Class in certain areas, but none meets the Mercedes meets the car in every respect. 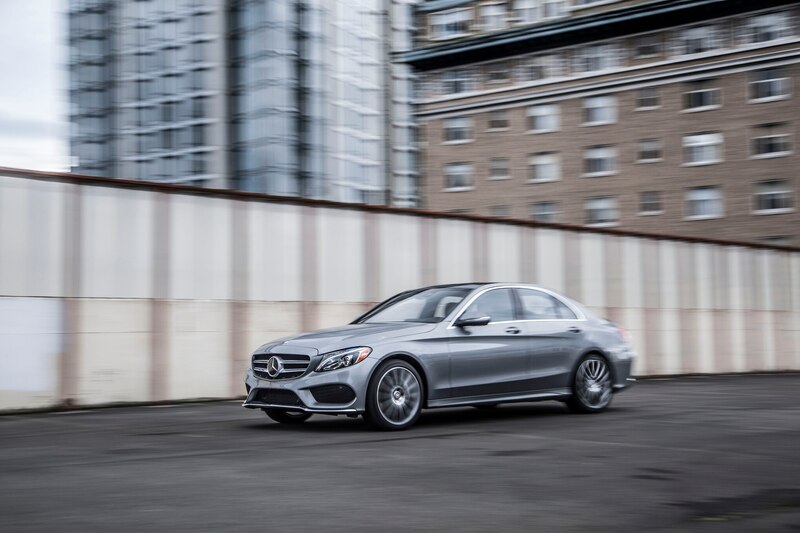 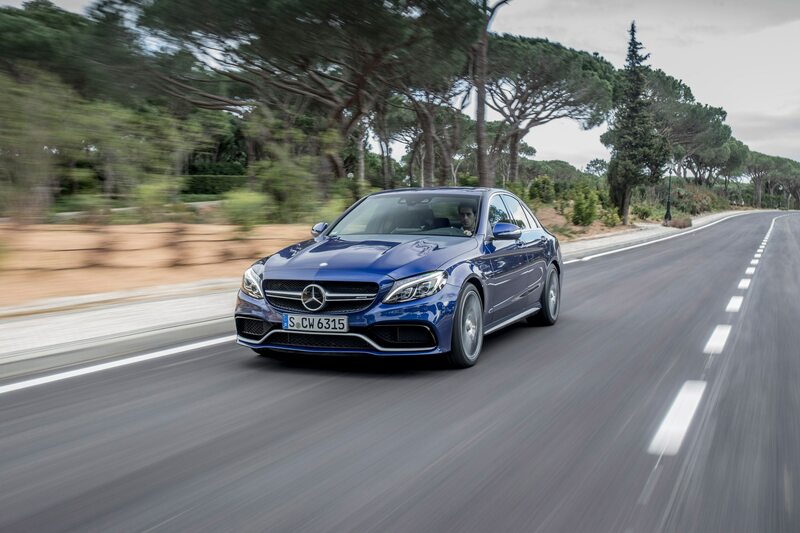 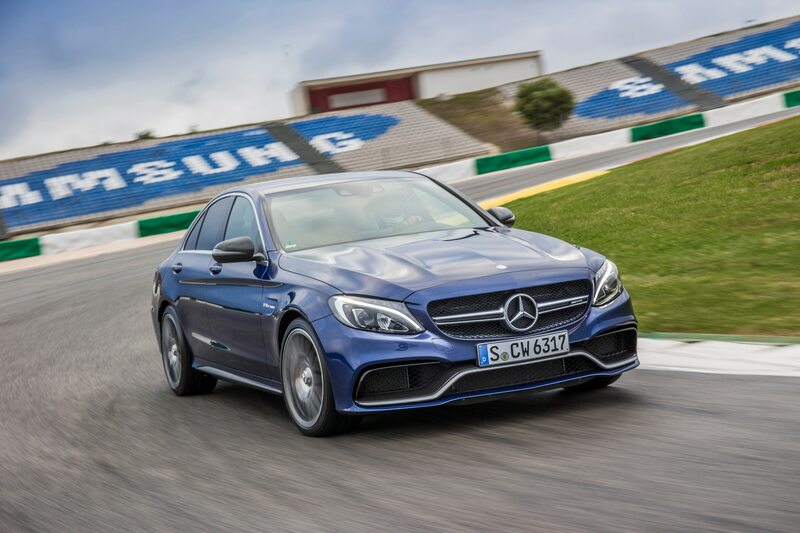 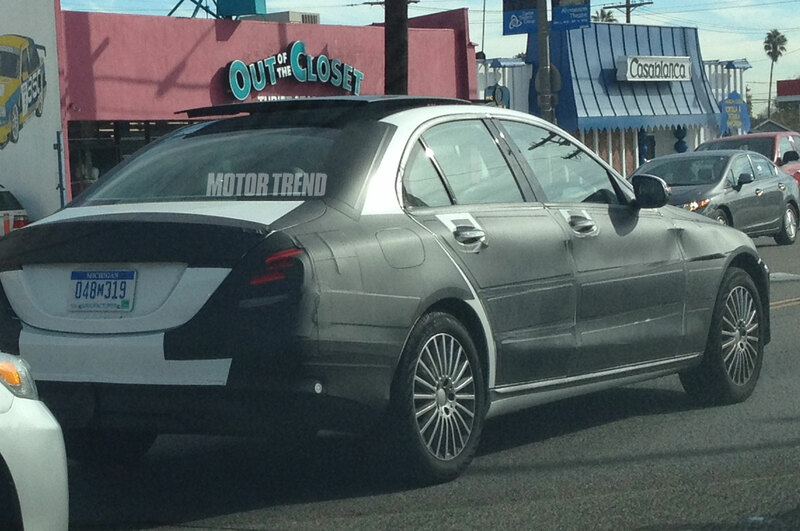 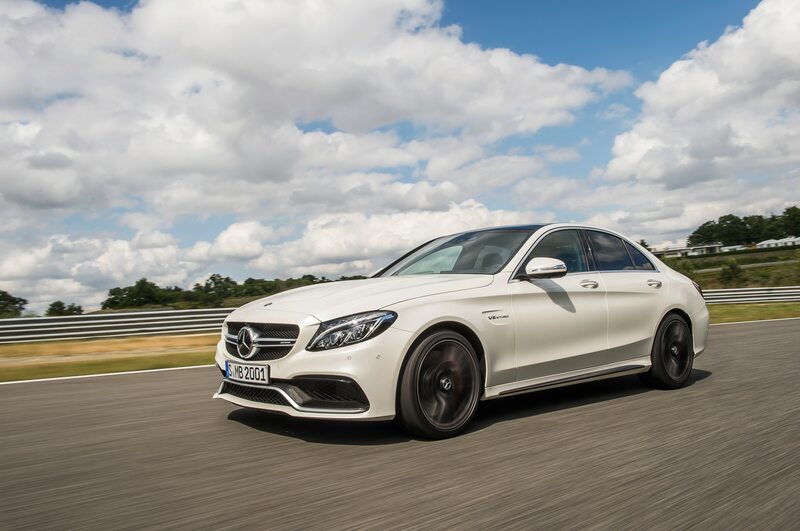 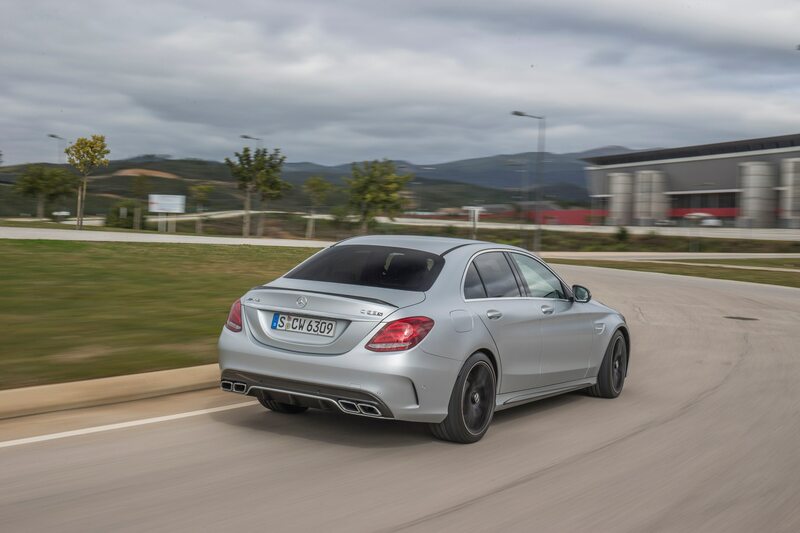 There’s no reason to believe the 2015 Mercedes-Benz C-Class won’t quickly become the company’s best-seller once it launches later this month. 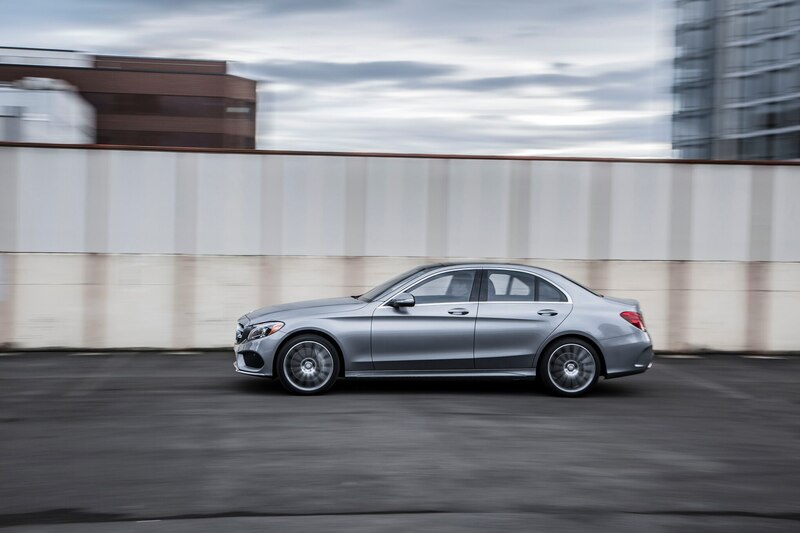 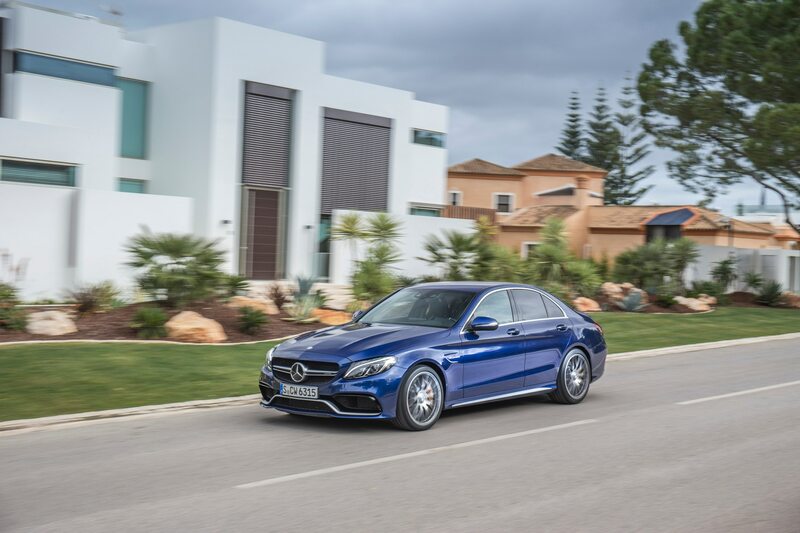 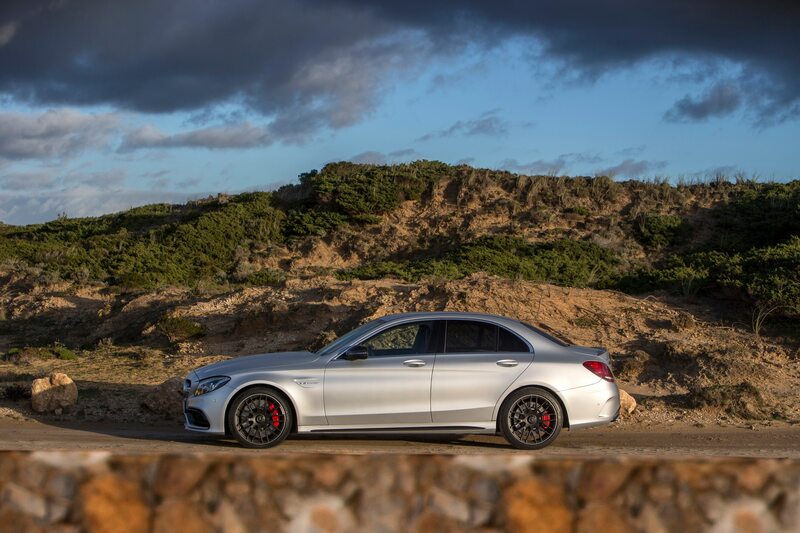 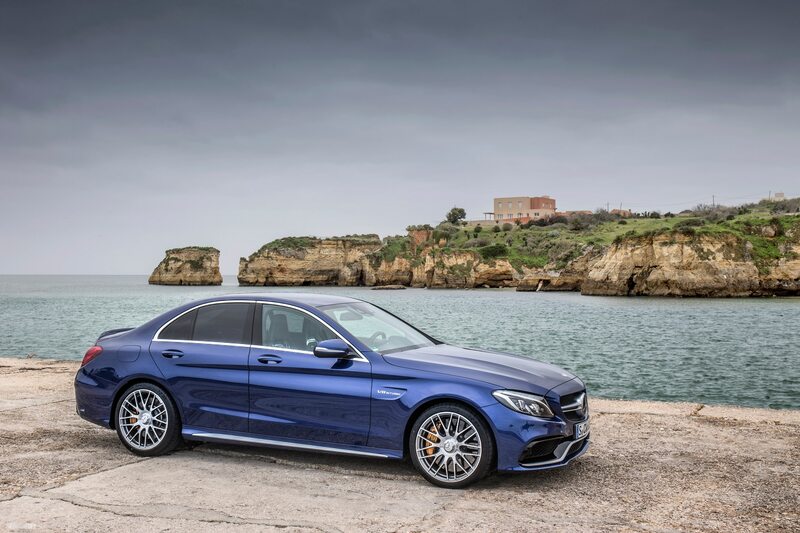 The C-Class is a wholly impressive, modern take on what used to be the entry-level luxury segment.